ONE OF THE MORE unusual sights in Paris at the moment is the recently drained Canal Saint-Martin. 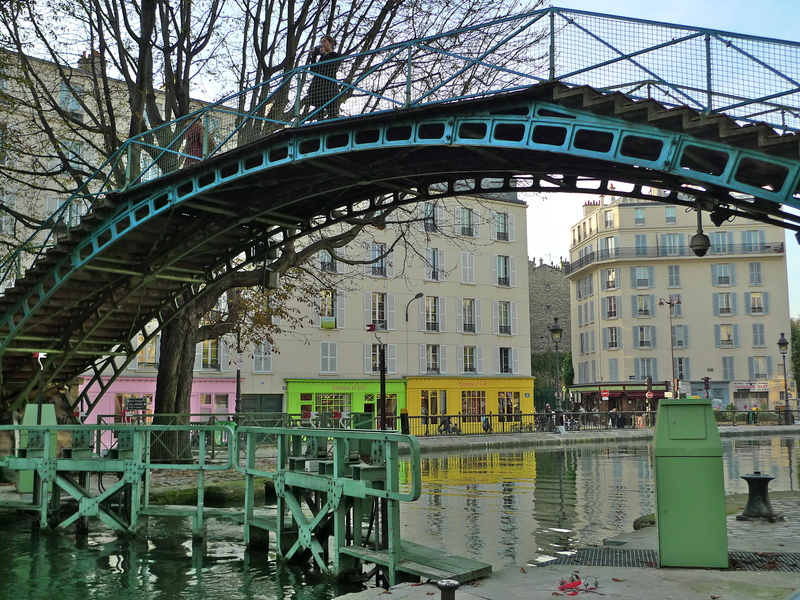 Opened in 1825, the Canal Saint-Martin is a 4.5 km stretch of water connecting the Canal de l’Ourcq to the Seine. 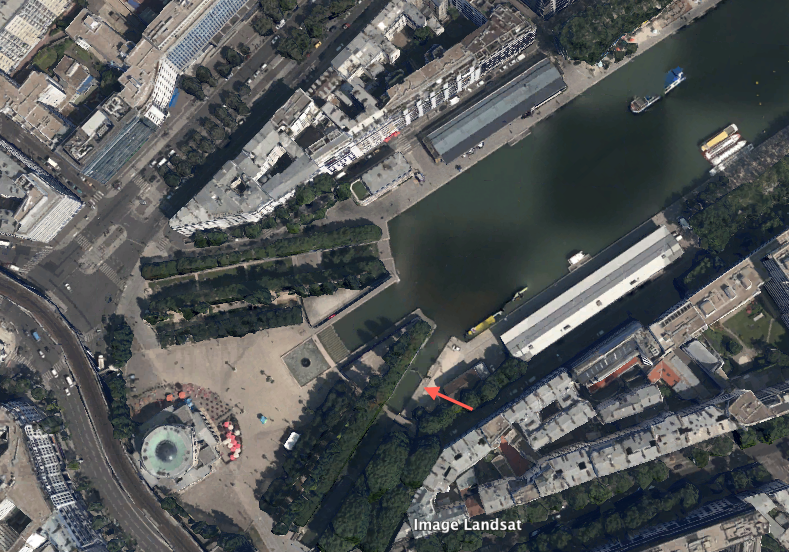 From the Bassin de la Villette at its upstream end to its junction with the Seine at Port de l’Arsenal downstream, the canal comprises nine locks and two swing bridges and from one end to the other it falls some 25 metres. For the final 2 km at its downstream end, from Rue du Faubourg du Temple to Port de l’Arsenal, the canal runs underground passing under Boulevard Richard Lenoir and Place de la Bastille. On Monday, 4th January, work began to drain and clean the canal and to do some renovation work to some of the locks. To get things underway a dam was installed at the upstream end of the canal. Once the dam was in place the lock gates along the canal were opened and some 90,000 cubic metres of water drained from the canal into the Seine. The canal has a large fish population and so some 10 cm of water was left in the bottom of the canal initially so the fish that didn’t manage to escape with the flow of water could be rounded up in nets and transferred to the Seine. 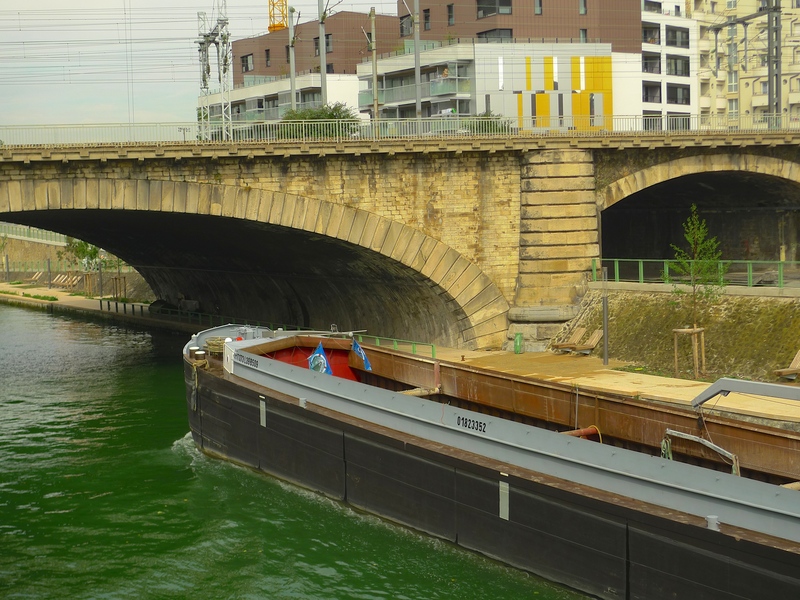 Once a waterway supplying Paris with fresh water, grain and other commodities to support a growing population, the canal trade eventually dwindled and the canal came close to extinction. 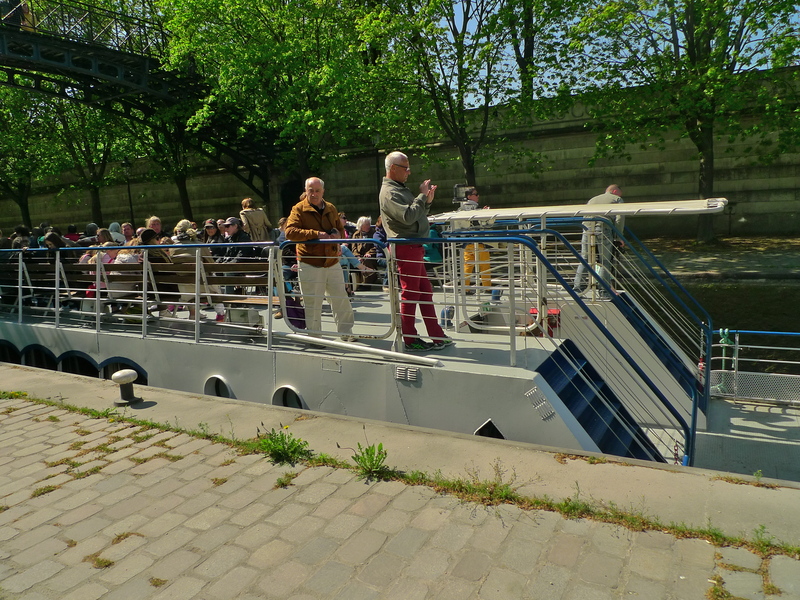 Today, with its romantic footbridges and mysterious vaulted tunnels, the tree-lined Canal Saint-Martin conveys passenger boats and pleasure craft and has become one of the key tourist spots in Paris. In contrast to its romantic image though, the canal takes on a different aspect once the water has been drained. The canal was last drained and cleaned in 2001 and during that operation 18 tonnes of fish were recovered and 40 tonnes of rubbish gathered. The haul of garbage and occasional treasure could be even more this time around. 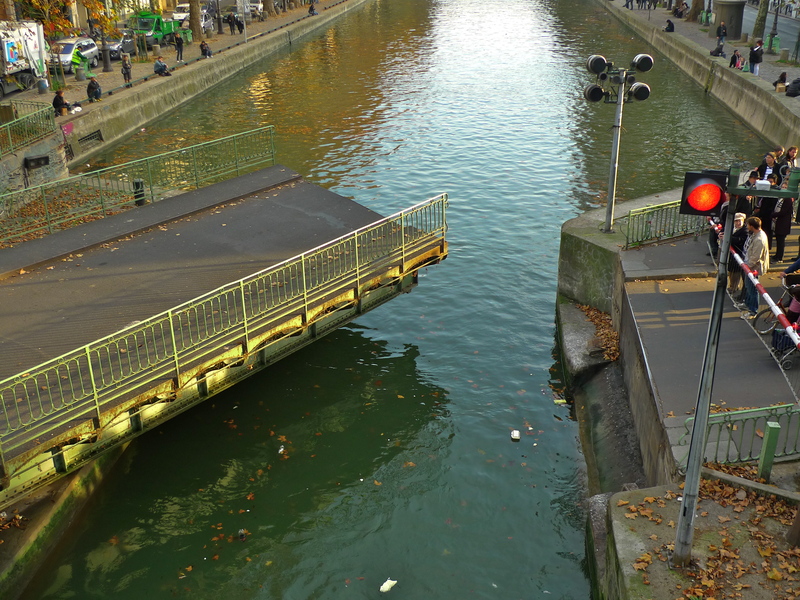 The other day, I walked along the Canal Saint-Martin from the Bassin de la Villette to Rue du Faubourg du Temple where the canal enters the 2 km tunnel before it reaches the Seine. It is this above-ground stretch of the canal that is being cleaned. Anxious to capture the cleaning operation in sound and since I couldn’t get close to the canal from either the Quai de Valmy on one side or the Quai de Jemmapes on the other, I chose to record from the top of the footbridge crossing the canal close to Rue du Faubourg du Temple. The recording doesn’t last for long and it isn’t perfect – but it is historic since these sounds are only heard every ten to fifteen years! All the detritus from the canal is being transferred by road to barges on the Canal St-Denis that will take it on for disposal. 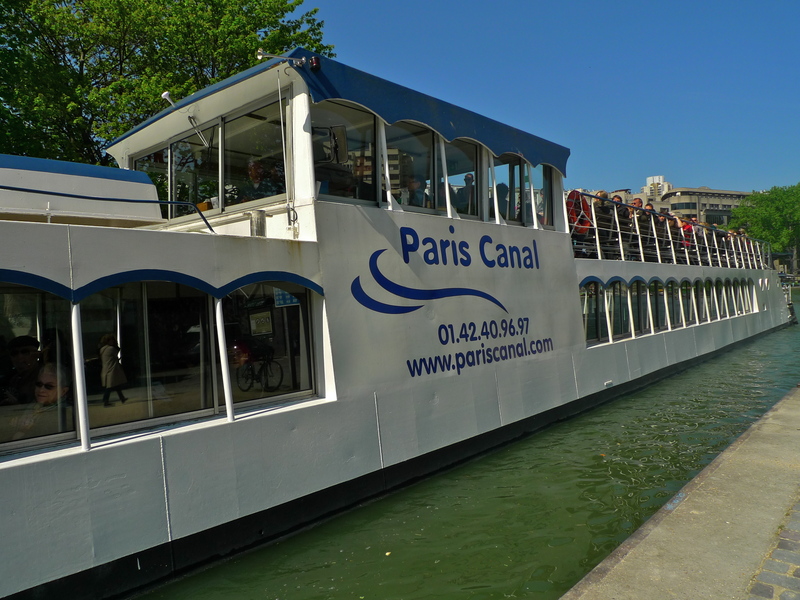 At a cost of €9.5 million, the cleaning and renovation work will take three months and the Canal Saint-Martin is due to open for business again on 4th April. IN THE FOURTEENTH CENTURY it was part of the fossé, the ditch that surrounded the wall built by Charles V to encircle Paris. 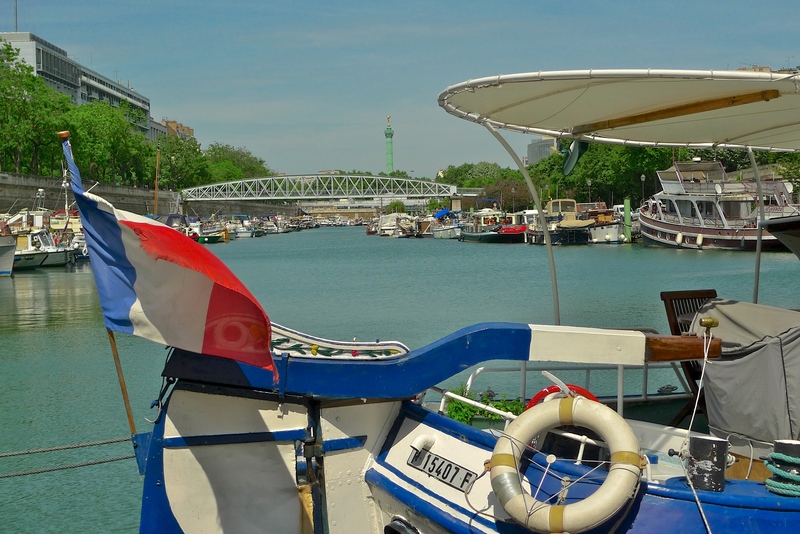 Today, the Bassin de l’Arsenal (also known as Port de l’Arsenal) is a marina connecting the Canal Saint-Martin to the Seine. After the destruction of the Bastille fortress in November 1789 during the French Revolution, the Bassin de l’Arsenal was excavated to replace the ditch that had been in place at the fortress. The Bastille fortress with the fossé (ditch) in the foreground. The fossé was later converted into the Bassin de l’Arsenal. From the sixteenth to the nineteenth centuries an arsenal existed here, which accounts for the name of the port and the name of the neighbourhood bordering the westerly side of the Bassin. 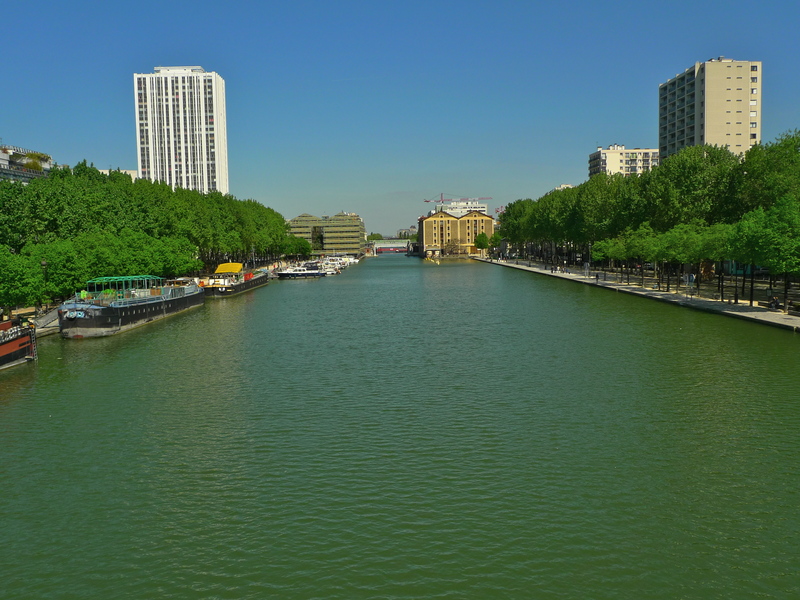 In the early nineteenth century, the construction of the Canal Saint-Martin was undertaken connecting the Bassin de la Villette to the Bassin de l’Arsenal and the Seine. 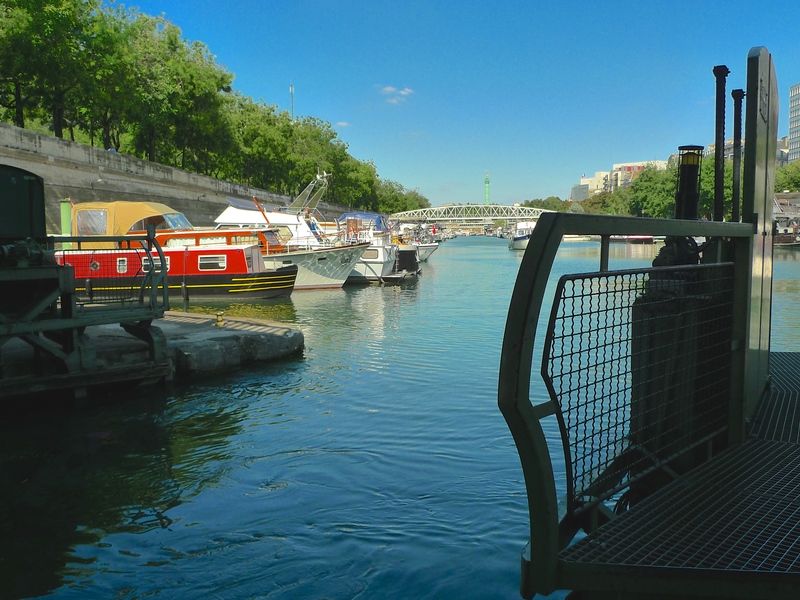 With the increased barge traffic on the Canal Saint-Martin during the nineteenth and much of the twentieth century, the Bassin de l’Arsenal became an important commercial port handling mainly wine, wheat and wood. 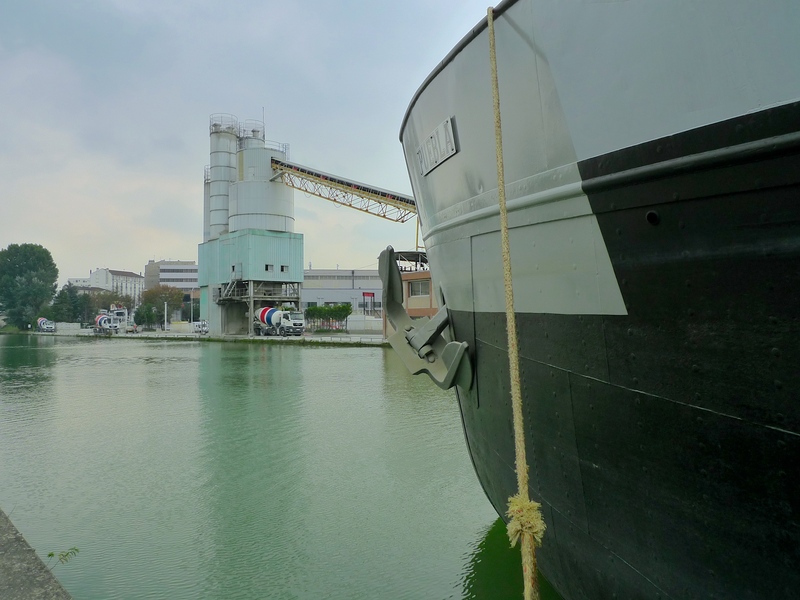 Separated from the Seine by the ninth and final lock on the Canal Saint-Martin, l’Écluse de l’Arsenal, the port was converted into a port de plaisance (a marina) in 1983. 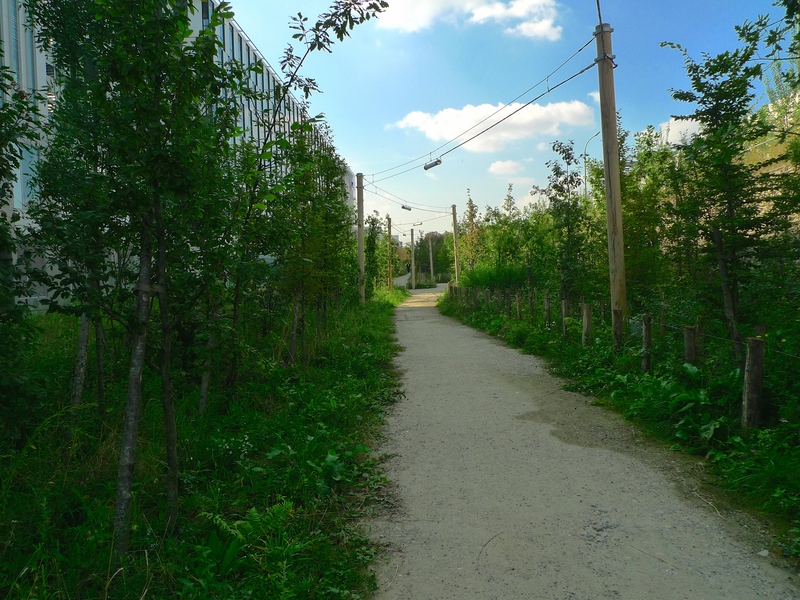 At the same time, a 1.4-hectare public park, the Jardin du Bassin de l’Arsenal, was created along the eastern side of the marina, which includes maple and willow trees and a rose covered pergola. The Bassin de l’Arsenal stretches for six hundred metres between Quai de la Rapée and Place de la Bastille and it forms the boundary of the 4th and the 12th arrondissements. Running over the lock leading to the Seine at the southern end of the Bassin are two bridges, the road bridge Pont Morland and an iron bridge carrying Métro Line 5. 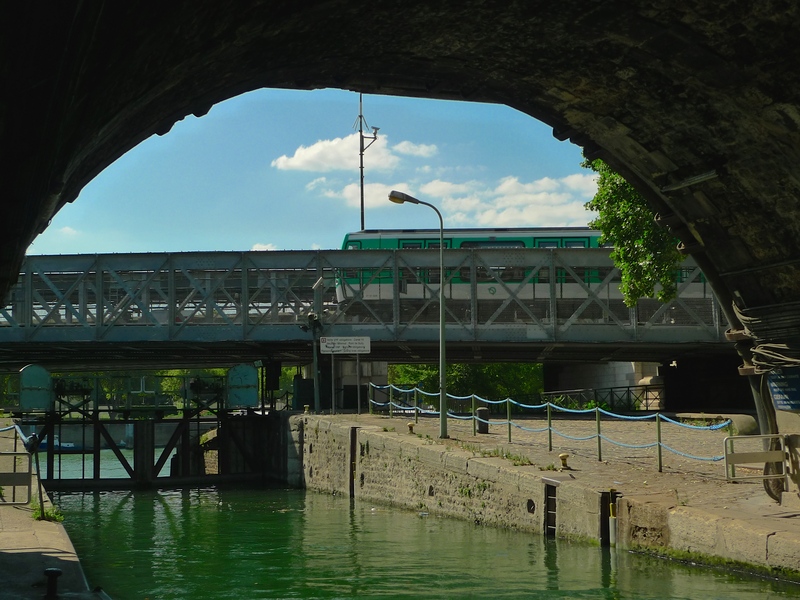 The sounds of the Métro trains running over the iron bridge into and out of Quai de la Rapée station dominate the soundscape around the lock. I’m fascinated by industrial soundscapes and so I’ve made many recordings of l’Écluse de l’Arsenal in operation but all of them have been punctuated by the sounds of passing Métro trains. The sounds of the lock operating are really interesting and so for several years I’ve been trying to capture the sounds of the lock without the Métro sounds in the background. The other day I finally succeeded thanks to a temporary interruption to the service on Métro Line 5. The lock is operated from la Capitainerie, the Harbourmaster’s office on the eastern side of the Bassin. 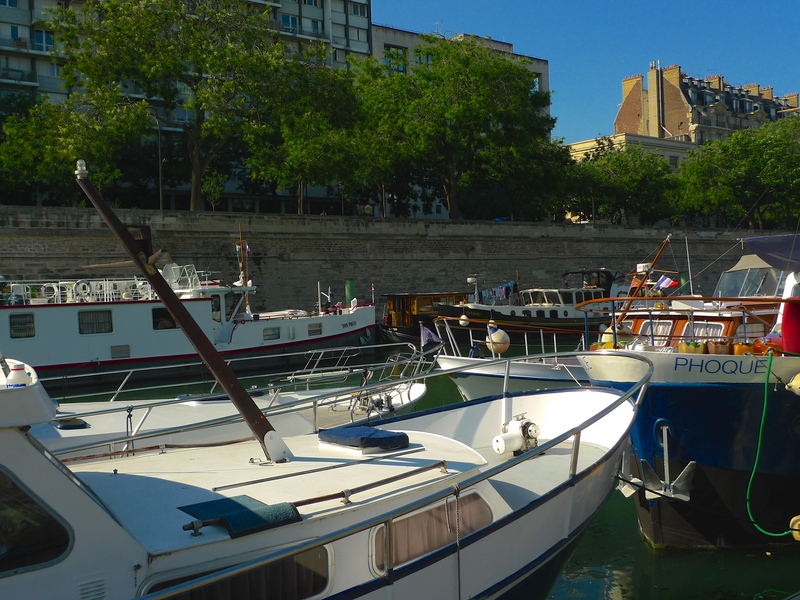 Against a background of hammering from building work on a neighbouring apartment block, two boats are waiting to leave the Bassin de l’Arsenal to enter la Seine. In this soundscape we hear the lock filling and then a warning signal before the lock gates creak open. 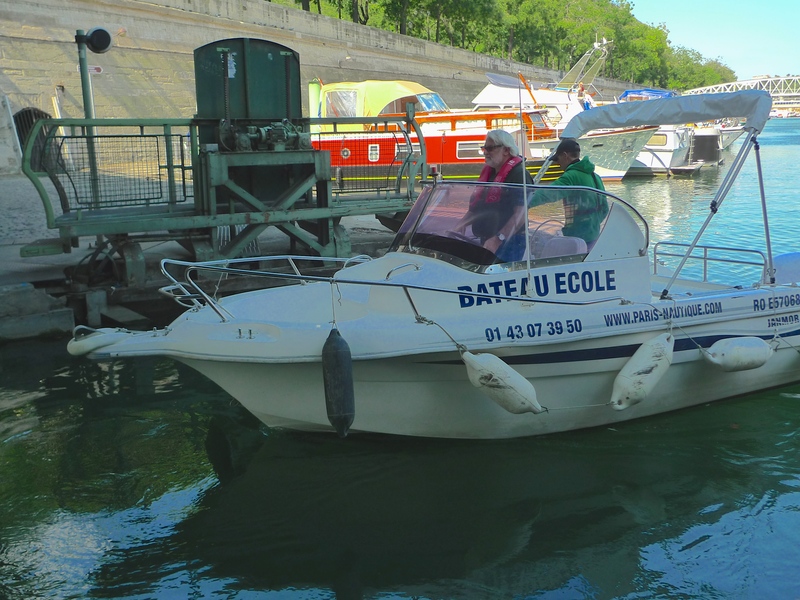 The first boat to enter the lock is a bateau école, a training boat. It passes into the lock almost imperceptibly. The next boat is larger but its sounds are equally tranquil. Once the two boats are in the lock the lock gates are closed with more creaking. A grandmother comes alongside and explains the process to her petite-fille. Note the fascinating sounds of the hydraulics after the lock gates are shut. 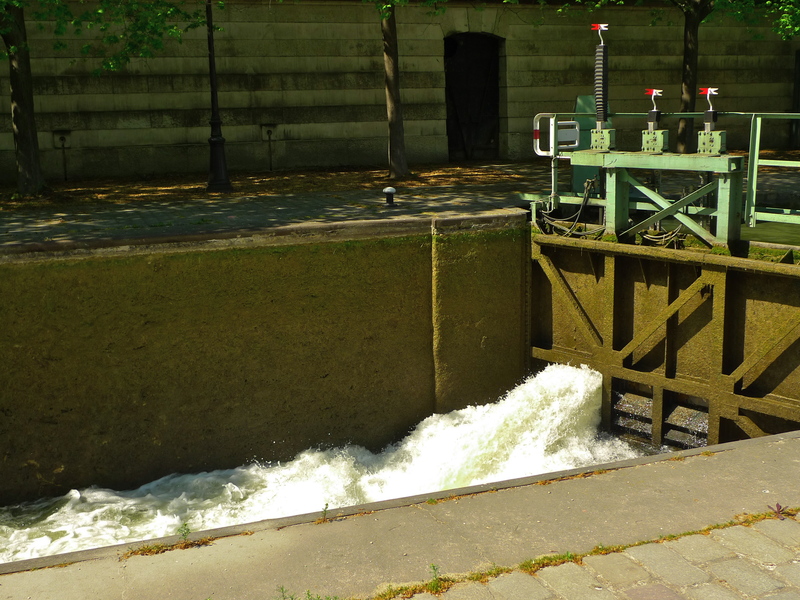 Water drains out of the lock, the boats drop three metres, the lock gates at the far end of the lock are opened and the boats are free to enter la Seine. 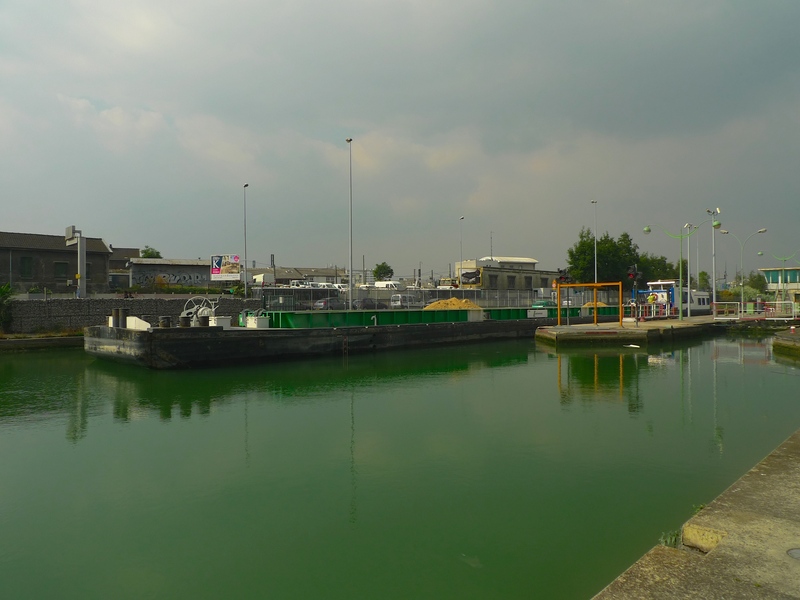 But as the water level is lowered, the soundscape closest to the Bassin de l’Arsenal changes as water seeps into the lock from gaps in the closed but exposed lock gates. Some of the best sounds in my Paris Soundscapes Archive are sounds of the Paris Métro but even though the sound rich Métro Line 5 was so close this was one occasion when I was pleased that the Métro sounds were absent. 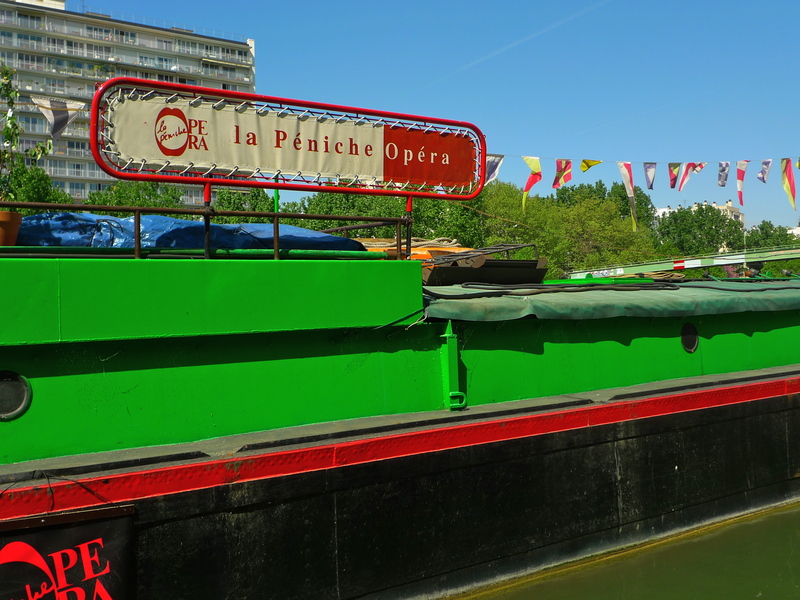 MY EXPLORATION OF THE Canal Saint-Denis and its sounds began at the head of the canal where it parts company from the Canal de l’Ourcq at the Parc de la Villette. 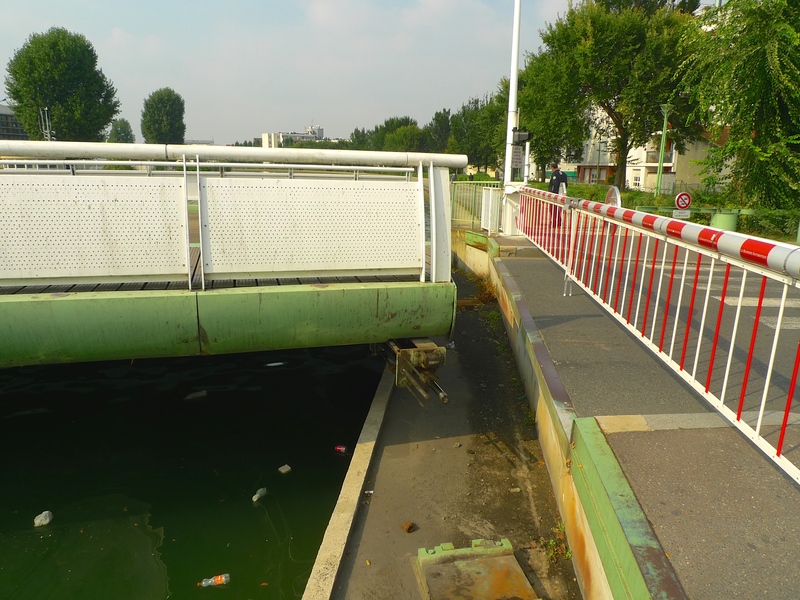 In Part 1, I followed the canal to the end of the Quai de la Gironde on the edge of the 19th arrondissement of Paris and in Part 2, I crossed the Paris city limits and followed the canal across the western edge of Aubervilliers to the swing bridge, the Pont Tournant du Canal Saint-Denis. 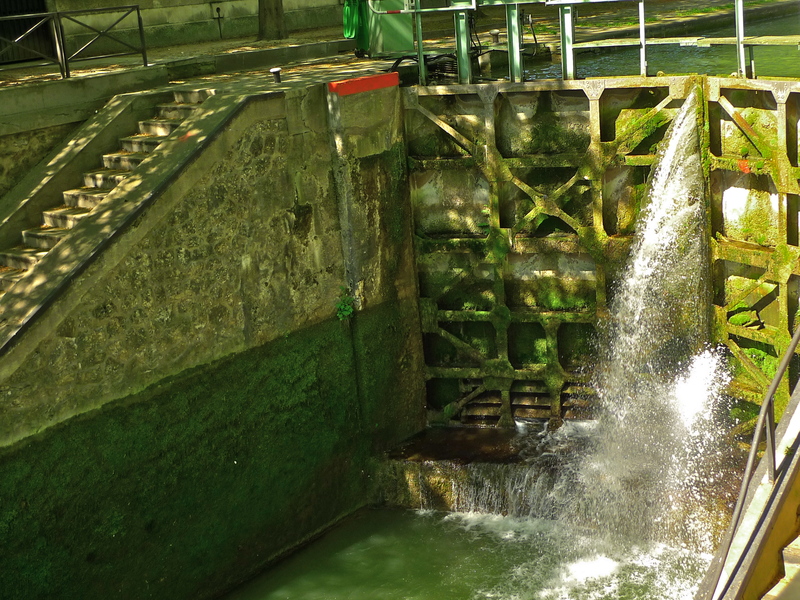 Having completed a little over half my journey, I’m now going to follow the canal into the commune of Saint-Denis to the final lock on the canal, l’Écluse de la Briche, where it discharges into la Seine. 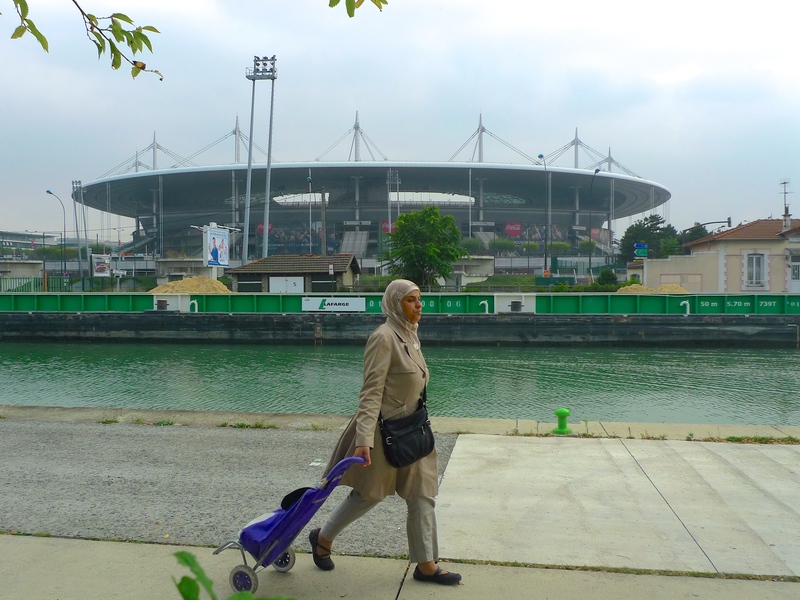 Walking along the quay from the swing bridge, I crossed from Aubervilliers into the commune of Saint-Denis and the French National Stadium, the Stade de France. With a seating capacity of 80,000, the Stade de France is a major international sporting and concert venue. It was opened in January 1998 in time to stage the 1998 FIFA World Cup Final in July of that year, a final which appropriately France won beating Brazil 3-0. Built on the site of a former gasworks and costing €290 million, the stadium took just thirty-one months to build during which time some 800,000 M2 of earth was moved and some 180,000 M3 of concrete poured. The stadium has retractable seating, which moves to reveal an athletics track around the central playing field. The most notable feature of the stadium is the elliptical roof, which is suspended some 42 metres above the ground, covers an area of six hectares and weighs 13,000 tons. The one glaring omission in the design of the stadium is the lack of any under floor heating, something that was highlighted, much to the stadium’s embarrassment, when in 2012 a Six Nations international rugby game between France and Ireland had to be cancelled just before kick-off due to the pitch freezing. As well as hosting the 1998 FIFA World Cup Final, the stadium also hosted the 2003 Athletics World Championships, the 2007 Rugby World Cup Final and the UEFA Champions League Finals in 2000 and 2006. Had Paris won its bid to host the 2012 Olympic Games, the Stade de France would have been the main Olympic stadium. As a major concert venue, the stadium has hosted the likes of The Rolling Stones, Paul McCartney, Madonna, U2, Céline Dion, Coldplay, Beyoncé, Eminem, Lady Gaga and many more. 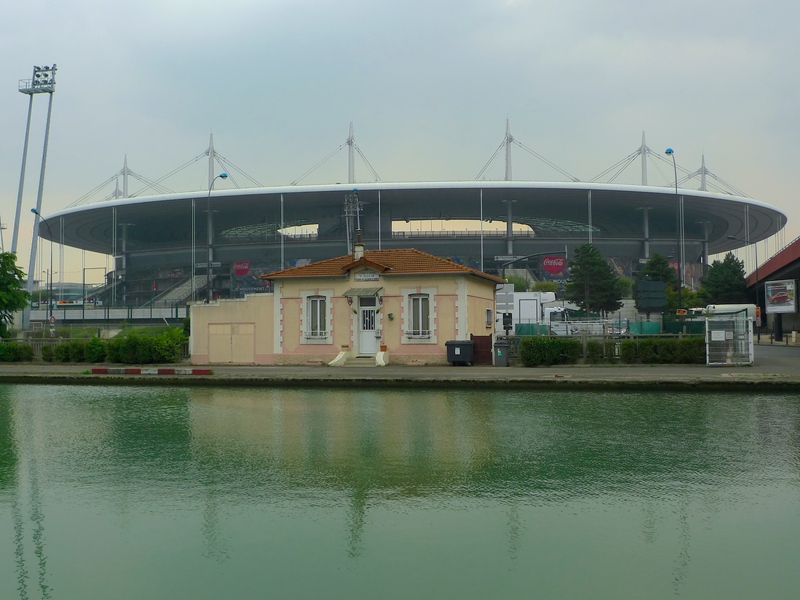 Having stopped for a while to look at the Stade de France from across the canal, I moved on a short way and followed the canal to the next lock, Lock N° 5, l’Écluse de la Porte-de-Paris. Lock N° 5, l’Écluse de la Porte-de-Paris looking downstream. This lock is enveloped in sound, not only the sound of canal traffic though, although plenty of canal traffic passes through the lock, but rather the sound of endless traffic passing over two road bridges adjacent to the lock. One of these bridges, the Pont Wilson, carries l’avenue du Président Wilson, part of the trunk road running from Paris to Calais, and the other is the huge bridge carrying the France’s busiest Autoroute, the A1, which runs from Paris to Lille. Despite the fact that Aubervilliers and Saint-Denis are probably the poorest municipalities around Paris and both have a very high crime rate, I never felt uneasy walking through either as I explored the Canal Saint-Denis – at least not until I arrived here. And it wasn’t the people I encountered that made me uneasy, instead it was the atmosphere around where these two major arteries pass overhead. Both bridges feel oppressively low to the ground. One, probably because of its size, feels as though it is – and the other just is! 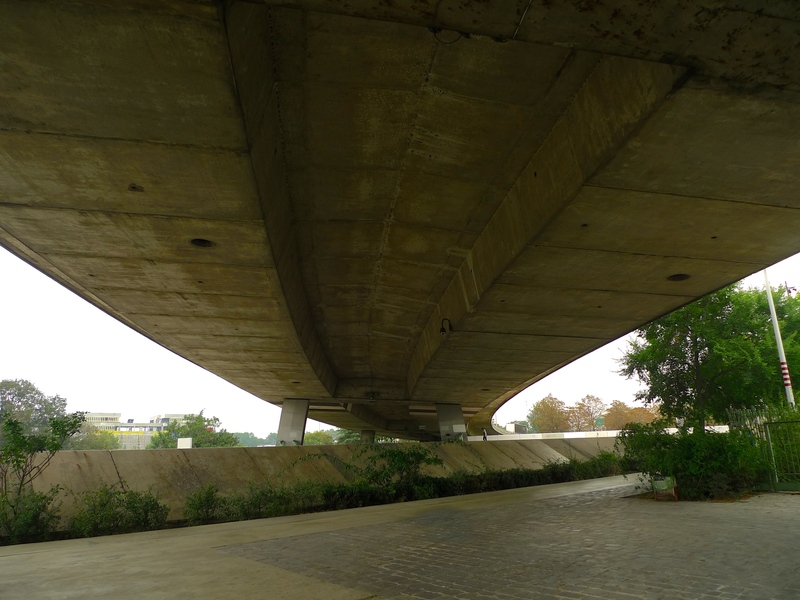 The base of the Pont Wilson in fact forms the roof of the downstream entrance to Lock N° 5 and I couldn’t help feeling claustrophobic and very uneasy as I walked underneath it. In addition, the noise pollution here from the traffic passing overhead is particularly oppressive and certainly didn’t add to my sense of well being. 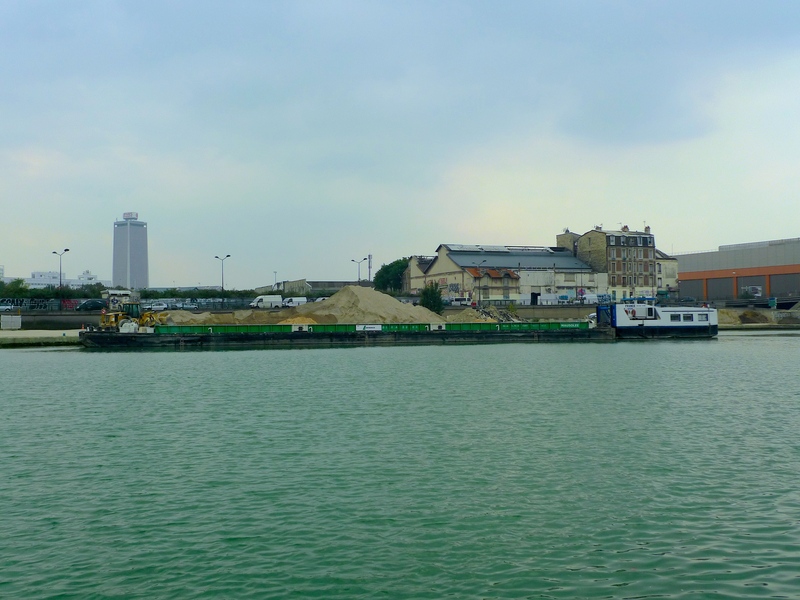 On the downstream side of Lock N° 5, the canal makes a left turn and widens out to form le bassin de la Maltournée, a zone de débarquement, a zone for loading and unloading construction materials, mainly sand and aggregates. Looking back from here you can see both the Pont Wilson and the A1 passing over l’Écluse de la Porte-de-Paris with the Stade de France just beyond. I can’t account for the clothes draped over the rail. They didn’t seem to belong to anybody and there were many other items of clothing scattered around along with much assorted detritus. 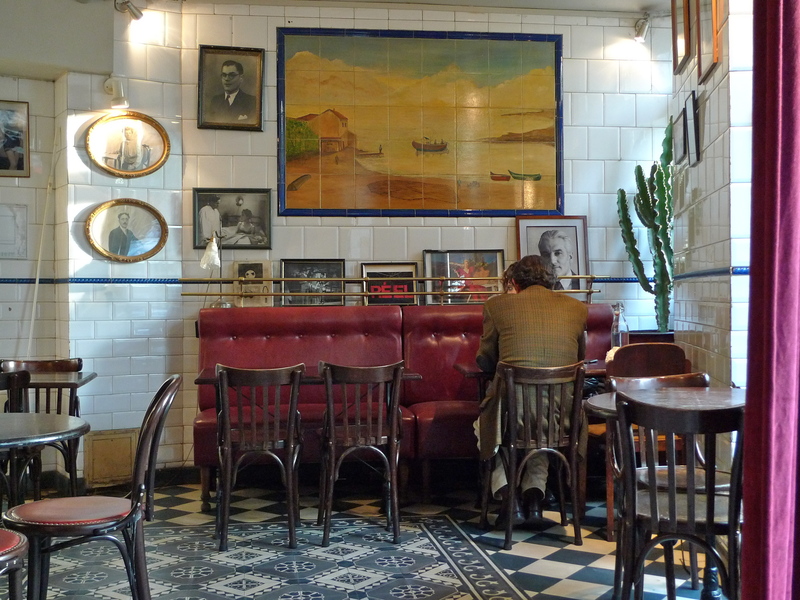 And this is what le Bassin looked like in former, busier, times. 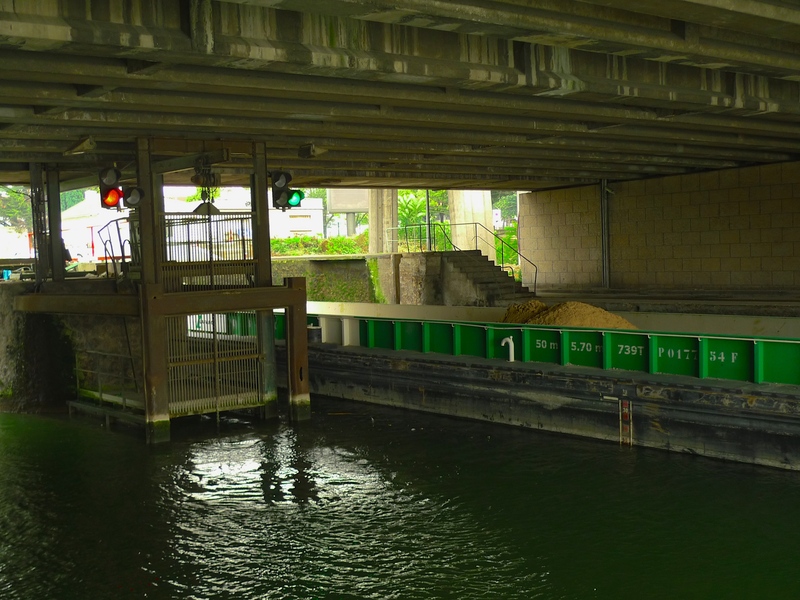 Because of the width of the canal at this, its widest point, vessels are able to manoeuvre to and from the landing stages whilst allowing other vessels to pass in and out of the lock. 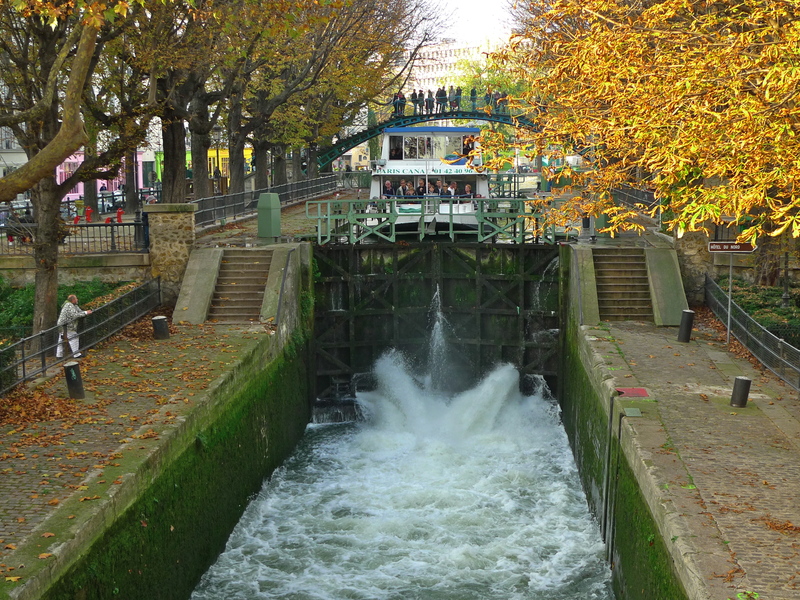 The fifth lock on the Canal Saint-Denis, l’Écluse de la Porte-de-Paris, takes its name from the nearby Porte-de-Paris. Before the industrial revolution of the nineteenth century, Saint-Denis and Paris were separated by a vast agricultural plain, la Plaine Saint-Denis. 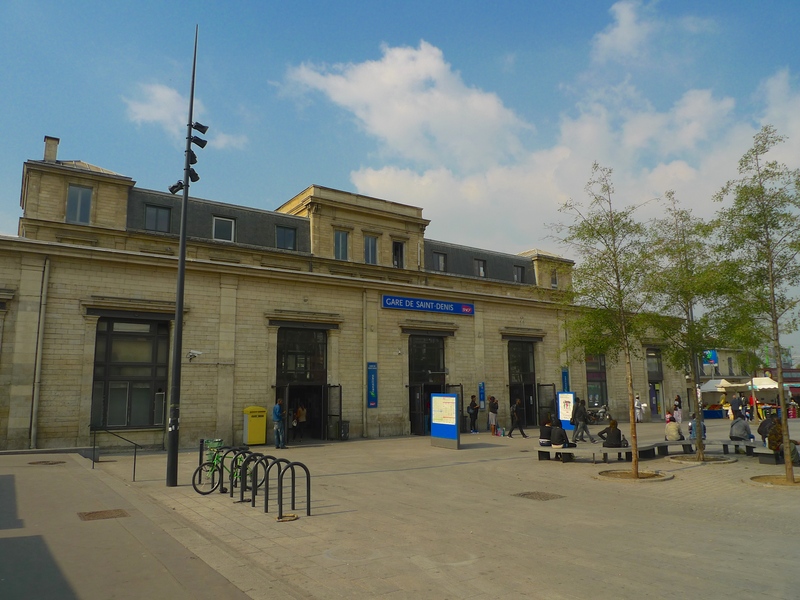 Two gates, the Porte de Saint-Denis in Paris and the Porte de Paris in Saint-Denis, allowed access between the two cities. 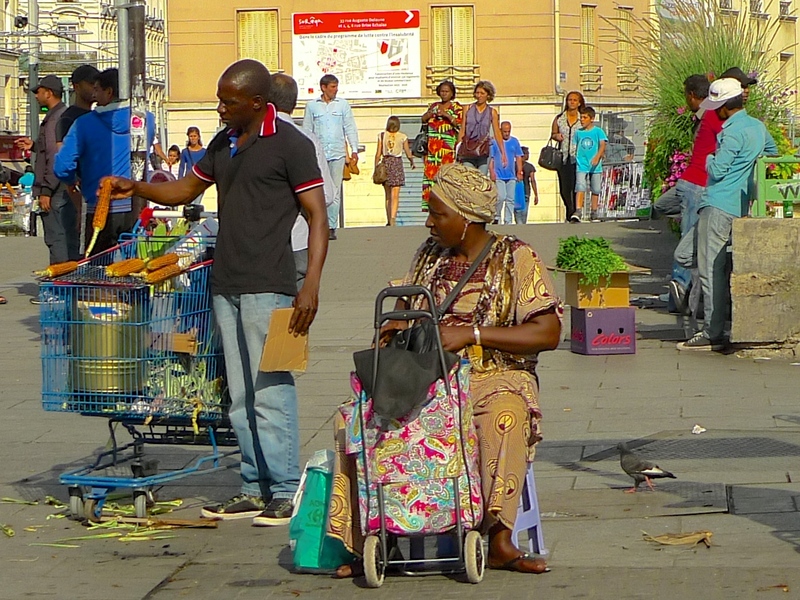 Today, we should think of Porte de Paris as a neighbourhood rather than as a gate. 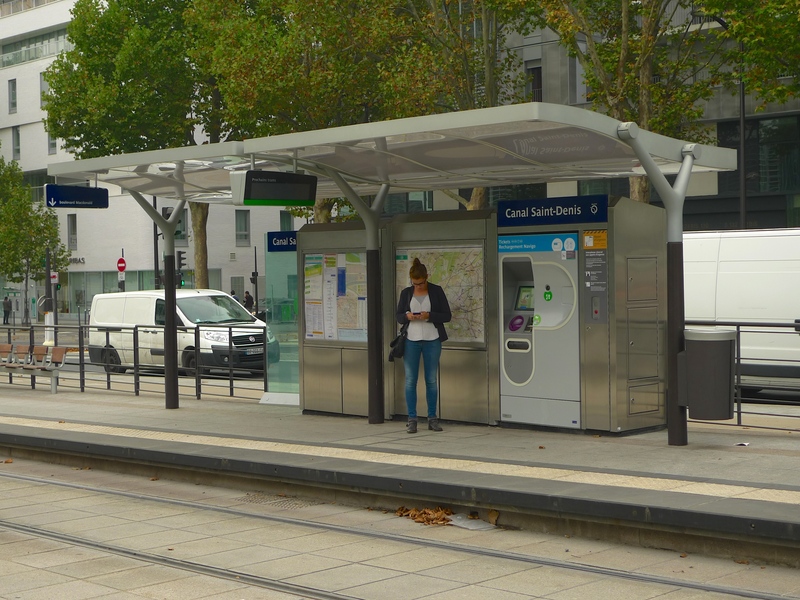 With a population of around 9,000, Le quartier Porte de Paris – Stade de France, links the historic city of Saint-Denis with the modernity around the Stade de France and there are plans to bring an urban continuity between the two. New private and social housing is planned along with a new school and a new hotel project and improved accessibility will be provided when the new Tram Line 8 comes to town later this year. From le Bassin de la Maltournée I walked on to the penultimate lock on the canal, Lock N° 6, l’Écluse Saint-Denis in the heart of the commune of Saint-Denis. 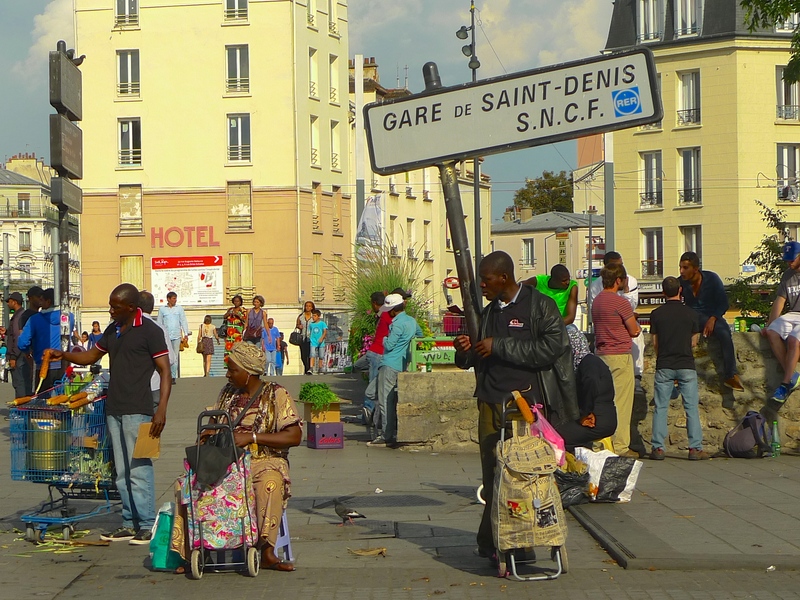 What we now know as Saint-Denis actually dates from the 2nd century AD when it was a Gallo-Roman village named Catolacus or, Catculliacum. Somewhere around the year 270 AD, during the period of the Christian persecution under the Roman Emperors Decimus and Valerian, Denis, a Christian missionary and Bishop of Paris, was martyred on the hill of Montmartre. He was beheaded and it is said that, after he lost his head, Denis picked it up and walked six miles or so preaching a sermon as he went. The place where he eventually fell and died was Catolacus and his grave became a shrine. Around 475, Saint-Genevieve purchased some of the land around the shrine and built a church. This became a place of pilgrimage and in the 7th century, King Dagobert I had this church replaced with something grander, the Abbey of Saint Denis. By the 12th century it had grown to become one of the most powerful Benedictine abbeys in France. The abbot of Saint-Denis, Suger, rebuilt portions of the abbey church using innovative structural and decorative features turning it into a masterpiece of what came to be known as Gothic art. This abbey church, the Basilique Saint-Denis, provided an architectural model for the cathedrals and abbeys of northern France, England and other countries. From the 6th century onwards, the Basilique Saint-Denis became the necropolis of French monarchs. 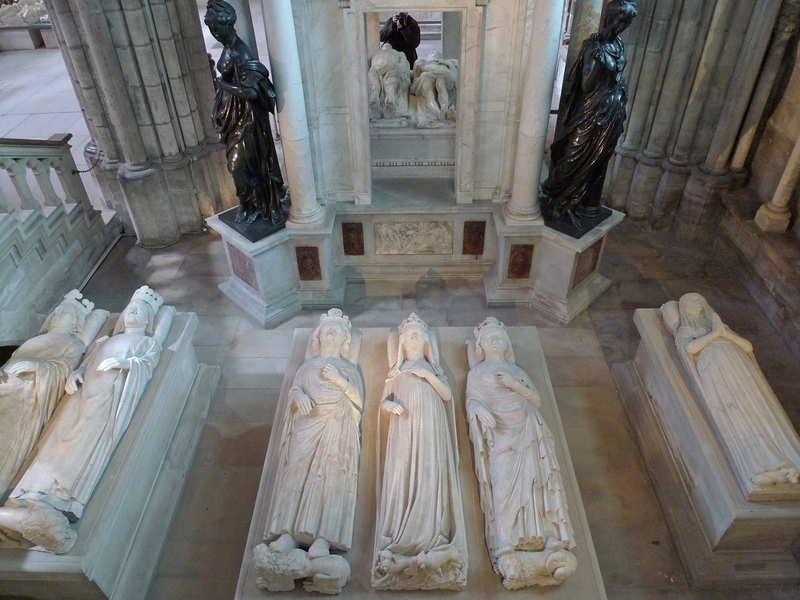 Most of the kings and queens of France were buried there. The list is impressive: 42 kings, 32 queens, 63 princes and princesses and 10 great men of the realm. With I think three exceptions, all the French monarchs were buried here from Hugues Capet onwards. And at some point in all this, although we’re not sure precisely when, the Gallo-Roman village of Catolacus became Saint-Denis. Industrialisation first came to Saint-Denis in the seventeenth-century under le Roi-Soleil, King Louis XIV, when weaving and spinning mills and dye houses were established. But it was not until the mid-nineteenth century that industry really took off. A combination of an expanse of flat land easy to build on together with the arrival of the canal in 1821 and the railway in 1843 facilitated the easy transportation of coal from the mines of northern France and Belgium, metals from Lorraine and raw materials from abroad. 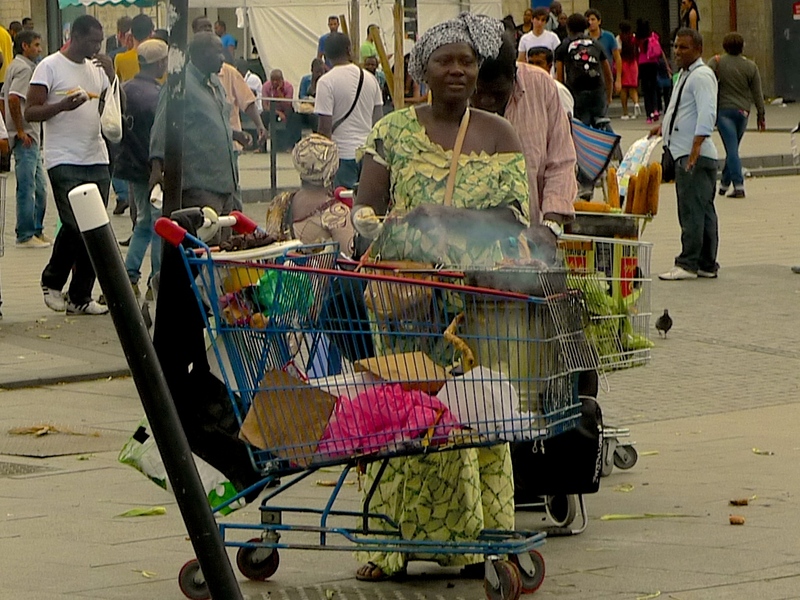 The proliferation of industry changed the face of Saint-Denis, not least its political face. In 1892, Saint-Denis elected its first socialist administration and by the 1920s, the city had acquired the nickname of la ville rouge, the red city. 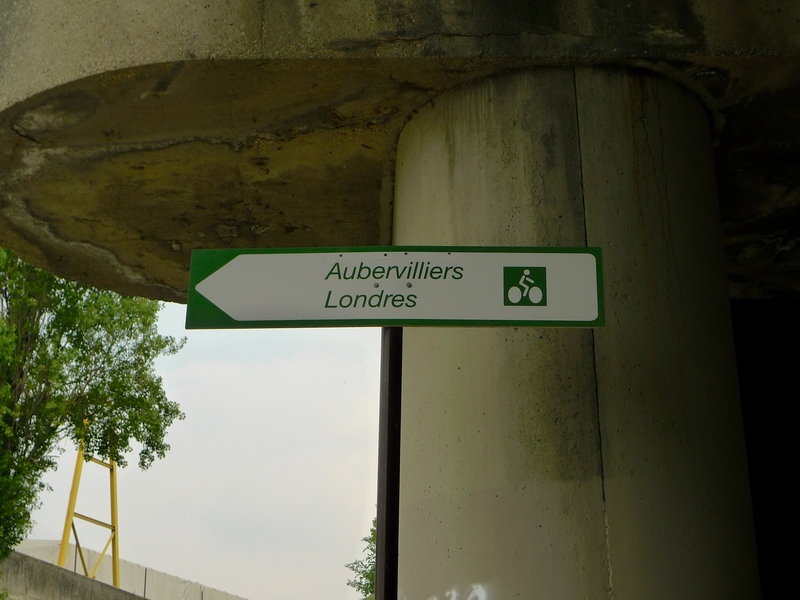 But, as with neighbouring Aubervilliers, (see Part 2), the de-industrialisation of the 1970s and 1980s took its toll. There was a shift away from manufacturing to service industries with the concomitant mismatch between the qualifications required for the new industries and those of the local population leading to increased unemployment, increased poverty, increased immigration and the flight of the wealthiest part of the population leaving the poorest concentrated in dilapidated older housing in the centre and social housing projects at the periphery. During the 1990s, some rejuvenation of Saint-Denis began with the building of the Stade de France and the associated infrastructure improvements and since then, there have been attempts to attract more new industry and to initiate renovation projects not only in Saint-Denis itself but also throughout the wider Plaine Saint-Denis. 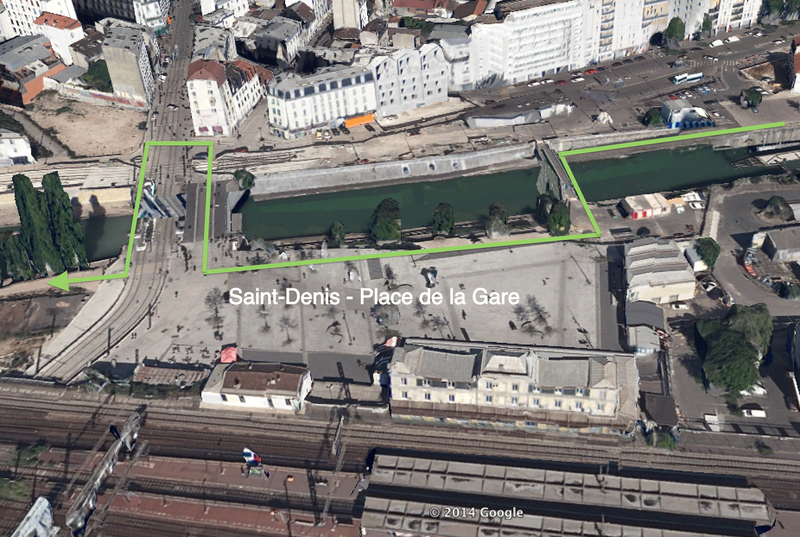 The Saint-Denis website outlines some of the projects underway. From l’Écluse Saint-Denis I walked on passing this rather nice cottage on the quayside. A little further on I discovered that my way on this side of the quay was blocked and so I had to cross over the Passerelle de la Gare and continue along the canal on the other side. This brought me to a bridge carrying several railway lines and an elevated roadway over the canal. 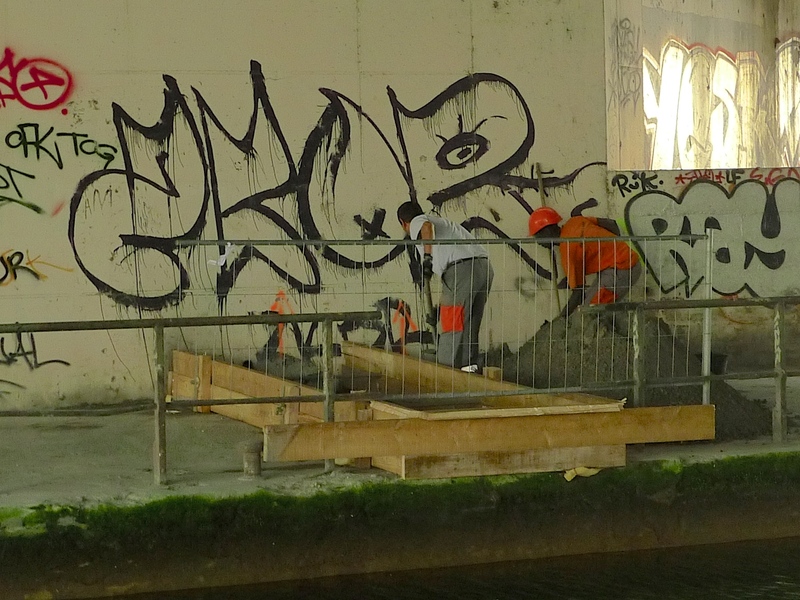 I paused under the bridge to record some sounds only to find that two men, complete with the obligatory white van, were busy shovelling concrete. I could have waited until they’d finished before doing my recording but I didn’t, I carried on and to good effect as you will hear. And I was also able to capture the sounds of this barge passing. 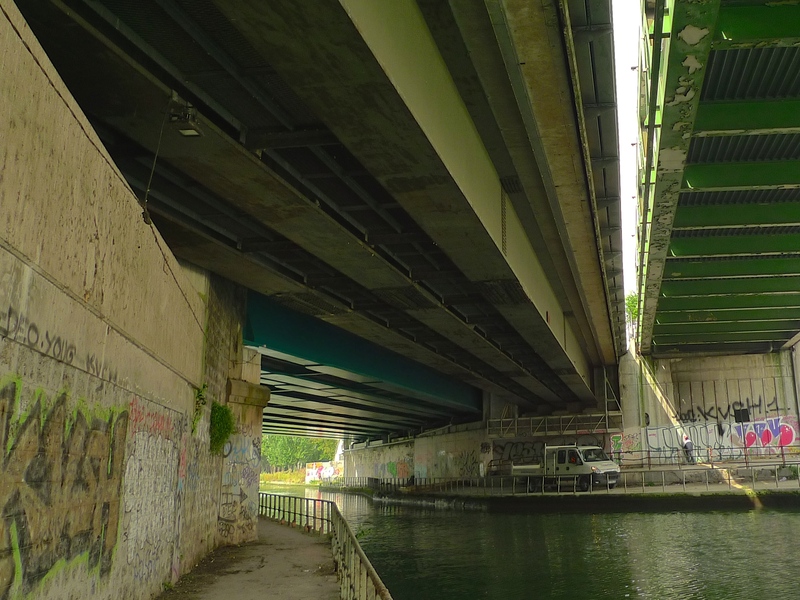 I spent the best part of an hour under the bridge capturing the various sounds before moving on to complete my exploration of the Canal Saint-Denis. Walking along the quay, I paused to look back at the bridge that had occupied so much of my time. 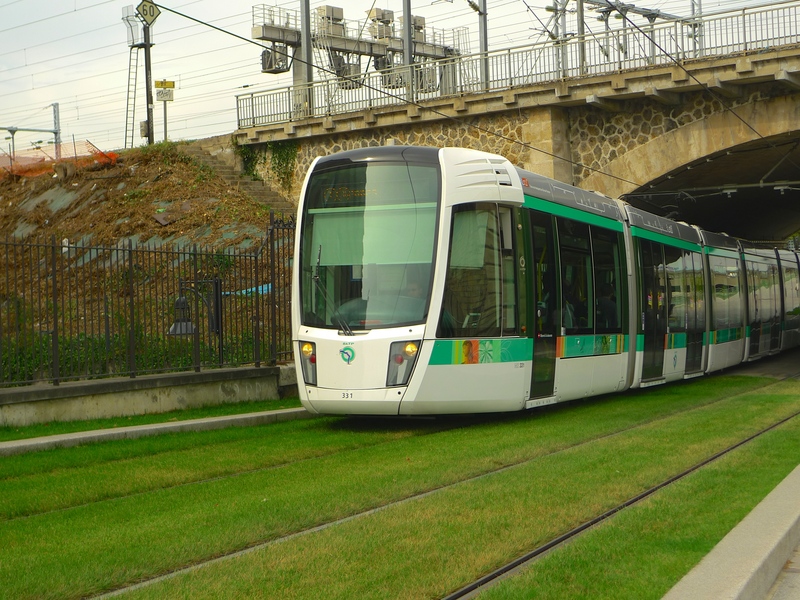 It not only carries the RER trains of Line ‘D’ but also the Transilien trains of the SNCF-owned railway network operating within the Île-de-France region, as well as SNCF and Thalys high-speed TGV trains. Looking in the other direction I was able to get a good view of the final lock on the Canal Saint-Denis, Lock N° 7, l’Écluse de la Briche. I continued along the quay to the downstream end of the lock where I found a sign listing the destinations that can be reached from here together with the distances and the time taken to reach them. 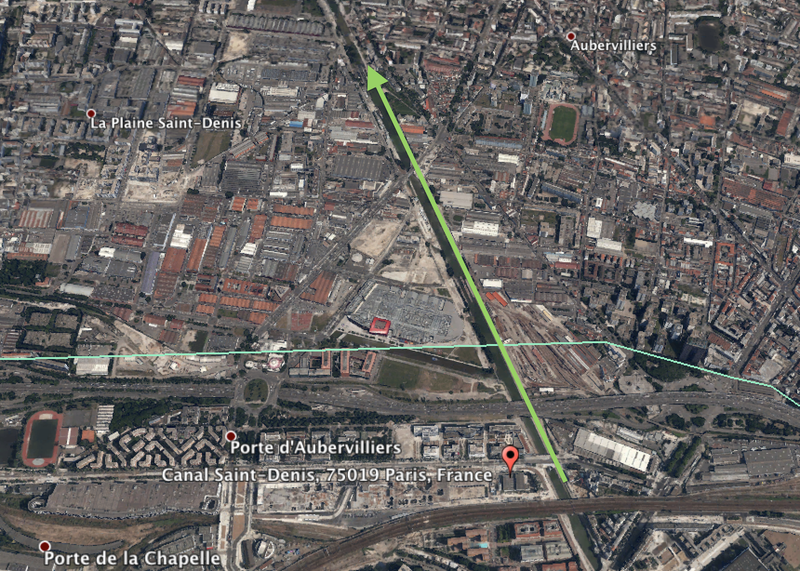 I could see that from here to the Canal de l’Ourcq was 6.6 kilometres and it would take a barge 2 hours and 20 minutes to get there. But I already knew that because I’d just walked all of those 6.6 kilometres. 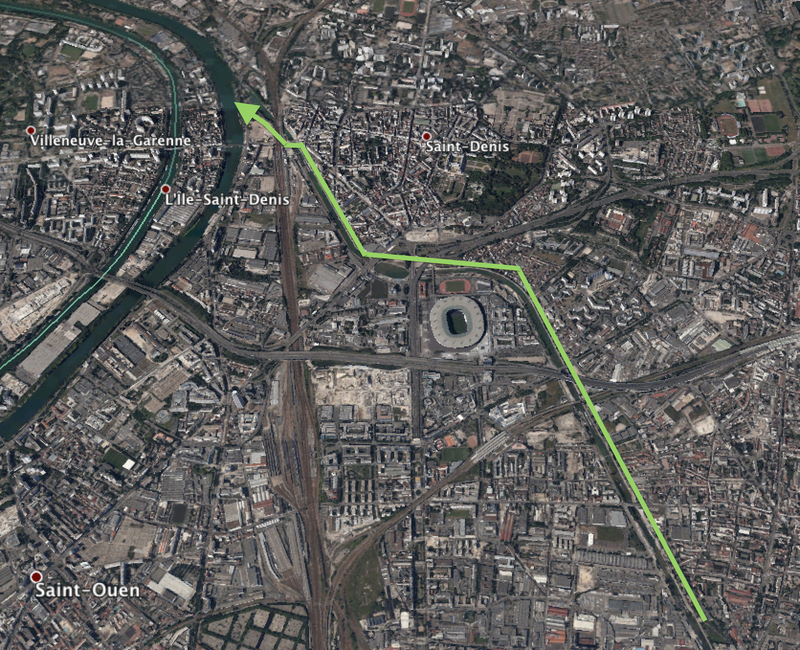 But to cover the 113.3 kilometres to the far end of the Canal de l’Ourcq from here would take a barge 21 hours … and who knows how long by foot! So now that I’d reached the final lock on the Canal Saint-Denis I couldn’t leave without seeing the point at which the canal discharges into la Seine. 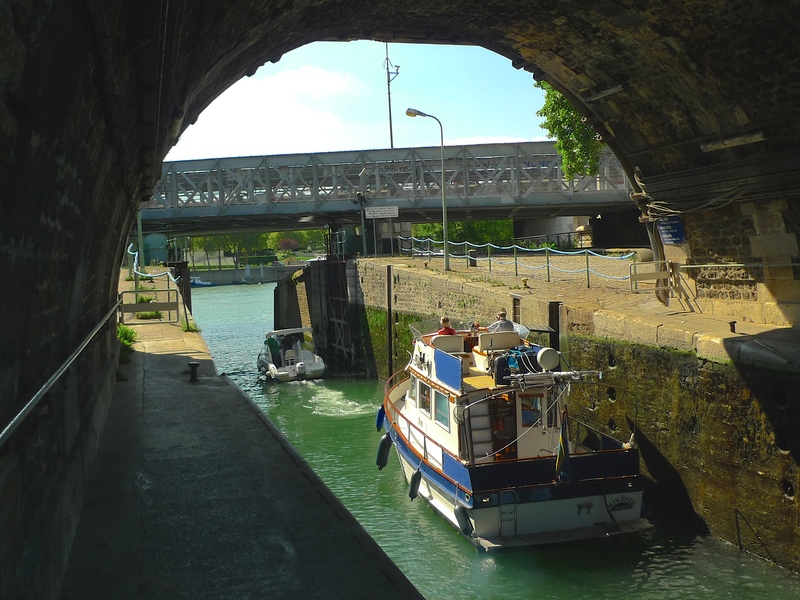 Unfortunately, I couldn’t pass the lock by walking further along the quay because the way was barred so I had to divert away from the canal to the road that would take me up to the bridge that crosses the canal close to the lock, the Pont de la Briche. 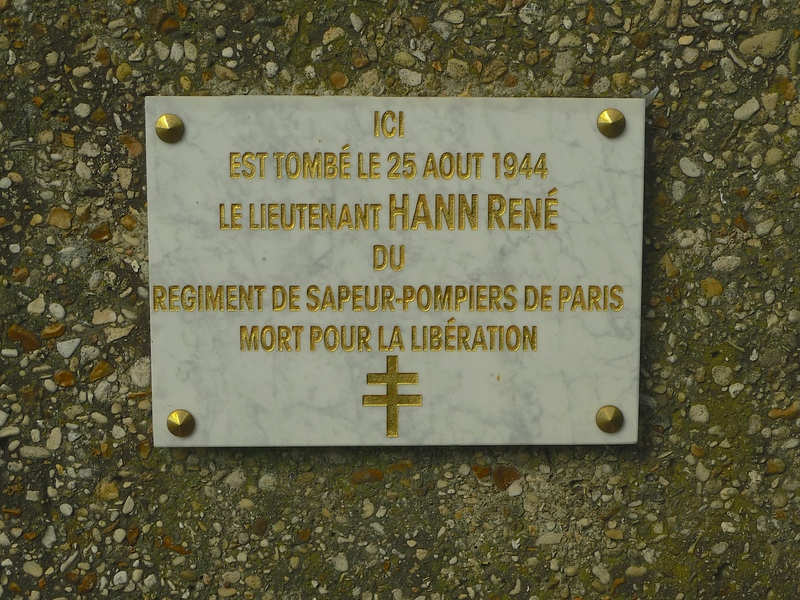 On the way to the bridge I found this plaque, which reminded me that Saint-Denis was occupied by the Germans from June 1940 until it was liberated by General Leclerc on 27 August 1944. Sadly, this unfortunate soul didn’t live to see la libération, he was killed just two days before. Standing on the Pont de la Briche I looked over l’Écluse de la Briche and thought about the things I’d seen and what sounds might represent this third leg of my journey along the canal. 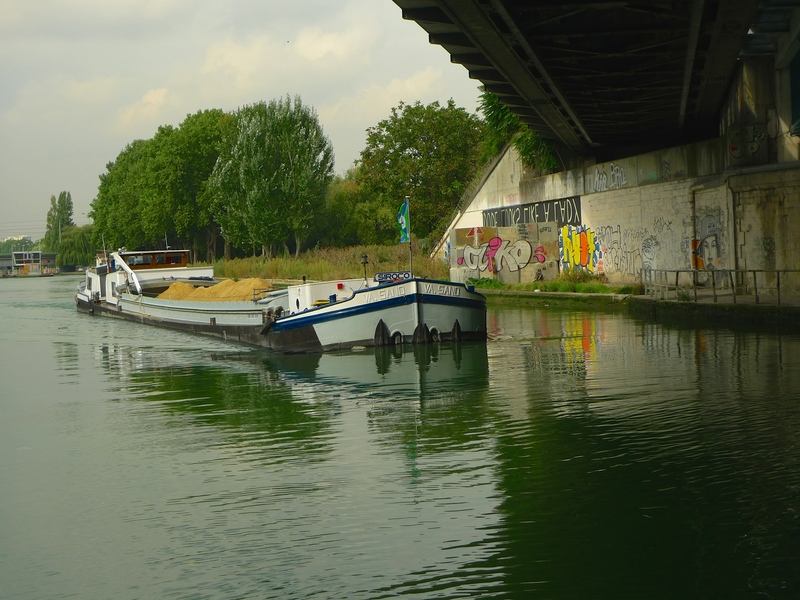 This sound portrait begins with the sound of a barge manoeuvring in la Bassin de la Maltournée and another barge negotiating the entrance to Lock N°5, l’Écluse de la Porte-de-Paris. 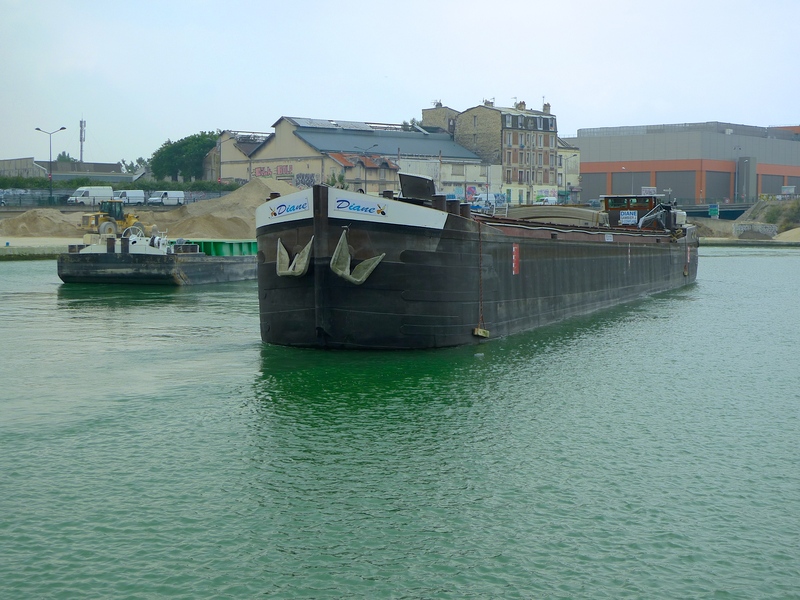 Then comes the sound of long the Lafarge barge carrying a load of sand exiting Lock N°6, l’Écluse Saint-Denis. We then move to underneath the railway bridge with the sound of trains rumbling overhead, a barge passing under the bridge and the men shovelling concrete. All these sounds conjure up images for me of this final leg of my journey. But my journey wasn’t yet quite complete. I couldn’t walk all this way and not visit the spot where the Canal Saint-Denis actually enters the river – and simply to see it from on top of the Pont de la Briche wasn’t good enough, I had to see it from ground level just as I’d seen the rest of the canal. Finding a way down from the bridge took some time but eventually I discovered a set of very uneven stone steps some way away from the bridge. 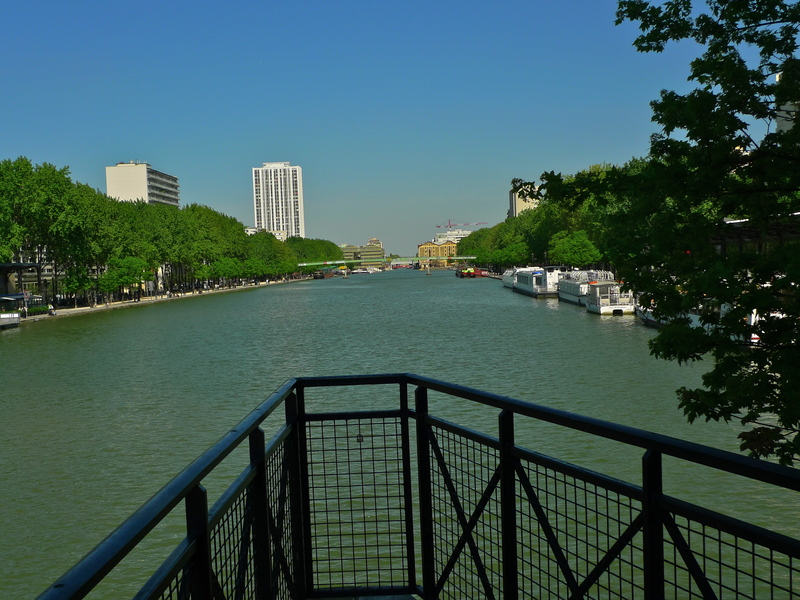 I ventured down and this was my reward – the junction of the Canal Saint-Denis and la Seine. And this was the end of my exploration of the Canal Saint-Denis. 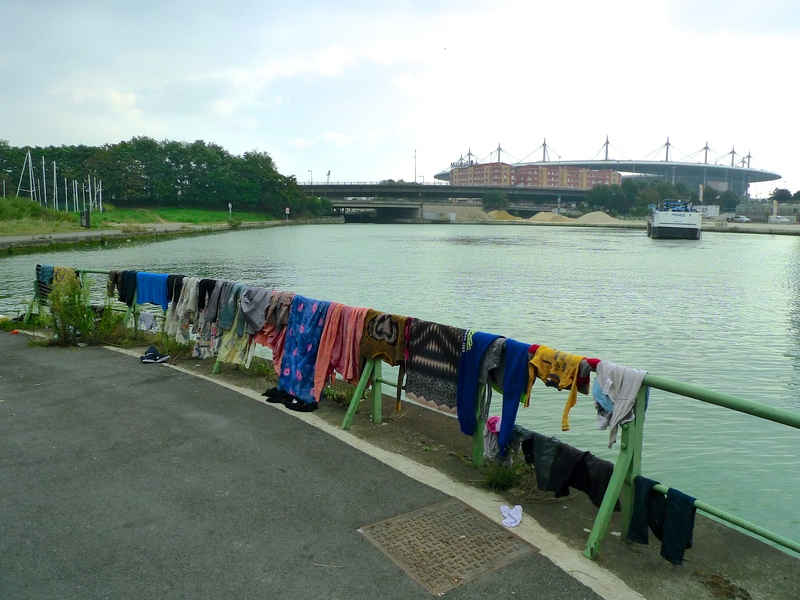 I’d walked from the head of the canal in the Parc de la Villette where it parts company from the Canal de l’Ourcq and followed it through the 19th arrondissement of Paris and then through the communes of Aubervilliers and Saint-Denis to the point where it discharges into la Seine. The canal stretches for 6.6 kilometres, although I walked much further than that if you count the detours I made to look at things that caught my eye and to find suitable places from which to record sounds. It took me almost seven hours to complete the journey, much longer than a serious walker would take of course, but then serious walkers seldom stop to hunt for sounds! My walk along the canal made me think not only about my immediate surroundings but also about history, the medieval history of the fertile Plaine Saint-Denis, the industrial revolution in the nineteenth-century and the more recent de-industrialisation with the urban decline and attempts at renewal that have followed in its wake. Next time, I shall add a postscript to my exploration of the Canal Saint-Denis and its sounds, something I came upon by chance and something I think captures the very essence of the canal. 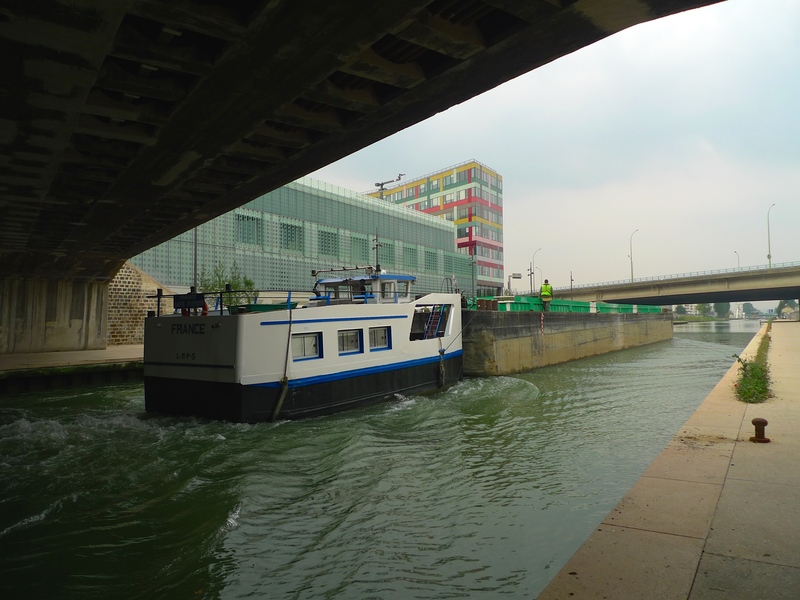 IN THE FIRST PART of my exploration of the Canal Saint-Denis I followed the canal from its starting point at the Canal de l’Ourcq in the Parc de la Villette to the end of the Quai de la Gironde in the 19th arrondissement. 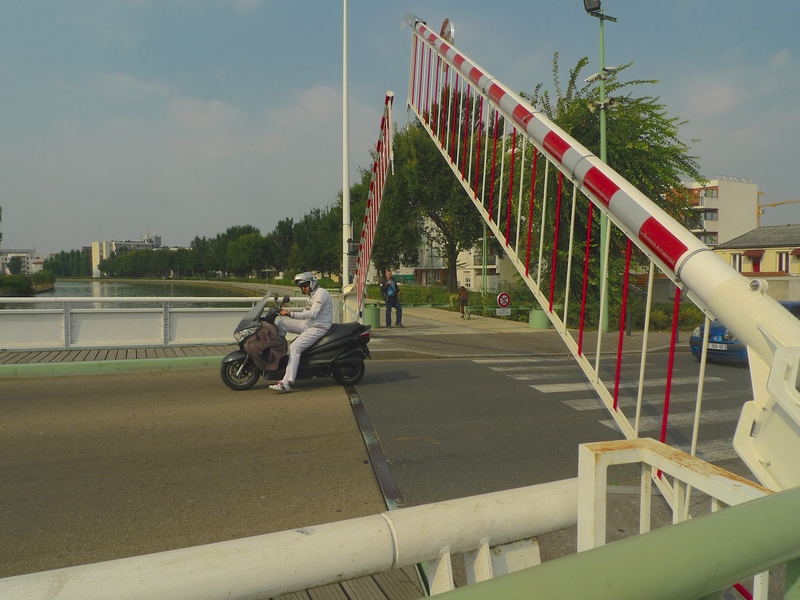 In this second part, I’m going to leave the Paris city limits and follow the canal as far as the swing bridge, the Pont Tournant du Canal Saint-Denis, at Aubervilliers in la Plaine Saint-Denis . 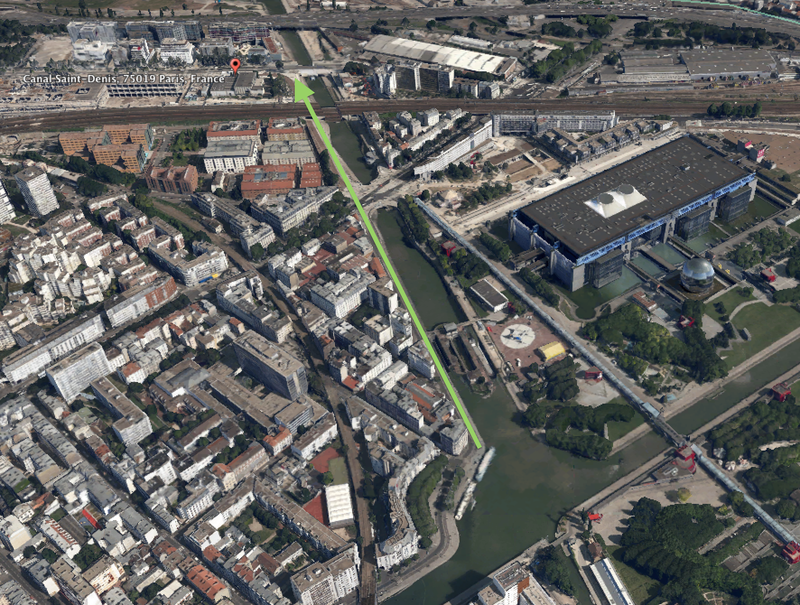 The green arrow shows my route from the end of the Quai de la Gironde to the Pont Tournant du Canal Saint-Denis. The horizontal line shows the Paris city limits. To continue walking along the canal it’s necessary to cross the bridge at the end of the Quai de la Gironde, the Pont MacDonald, and walk down to the canal on the opposite side. But before I did that I wanted to take a short detour. 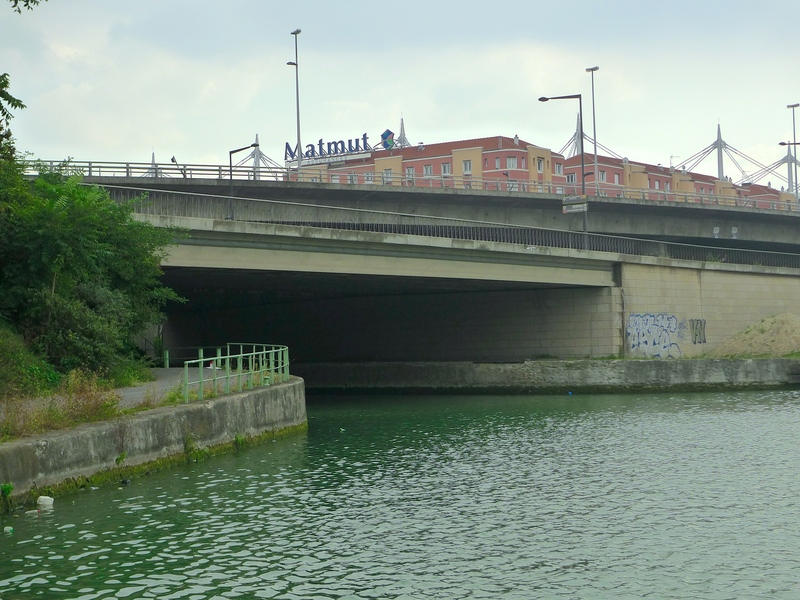 Before crossing the bridge, I crossed the road by the tram stop and walked along the canal as far as the Boulevard Périphérique, which is as far as you can go on this side of the canal. 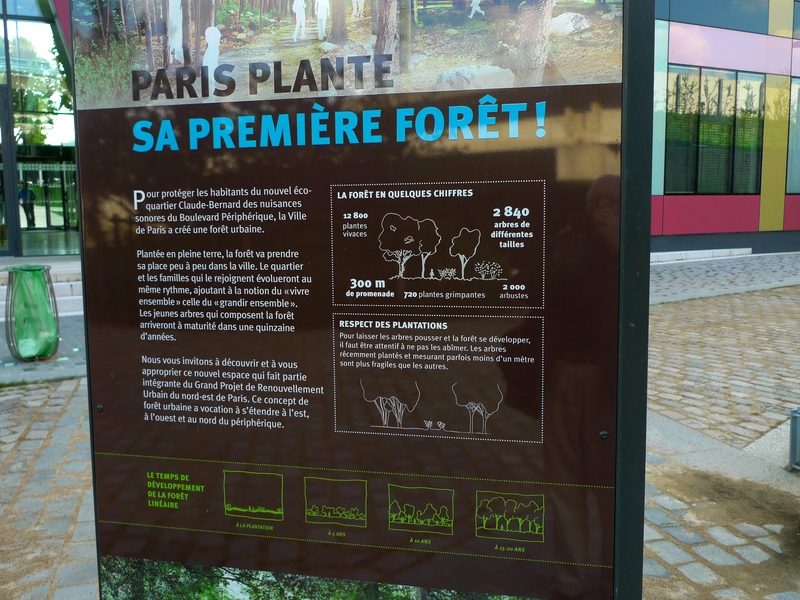 There I found the newly opened first forest planted within the city of Paris. Occupying a strip of land between office buildings on one side and the Boulevard Périphérique on the other it’s perhaps a little early to call it a forest but these young saplings are expected to grow into something much more substantial over the next fifteen years or so. 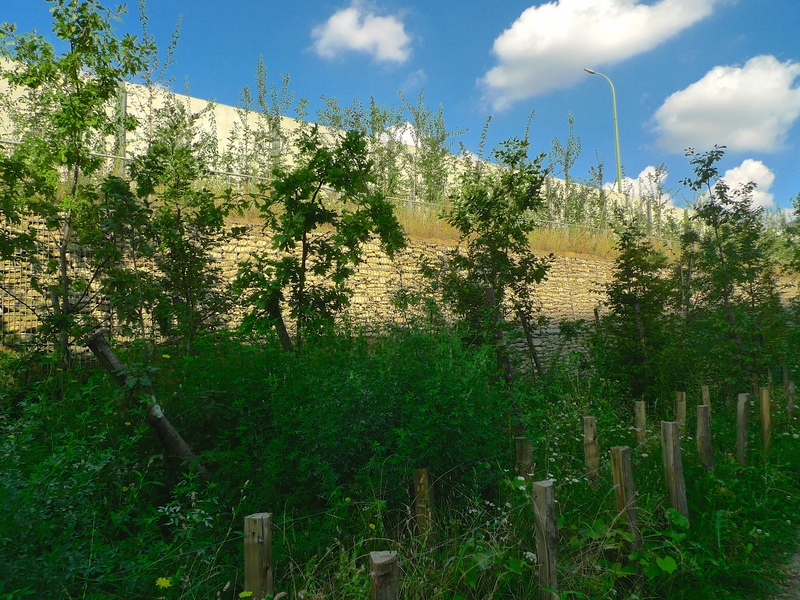 This new urban forest is intended in part to shield the neighbourhood from the noise pollution generated by the constant ribbon of traffic passing by on the Périphérique. 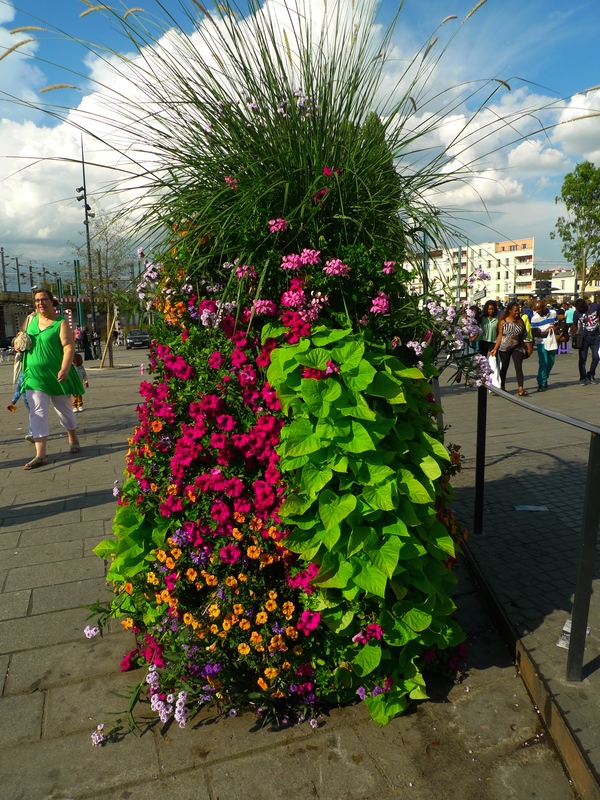 The Boulevard Périphérique lies directly above and behind these saplings beyond the wall and the lamppost. It seems that the Paris city authorities are not expecting the root cause of the noise pollution problem, excessive traffic, to reduce any time soon. Having had a look at this new urban forest I walked back to the Pont MacDonald, crossed over and went down the steps to the canal towpath just in time to catch this barge passing under the bridge. 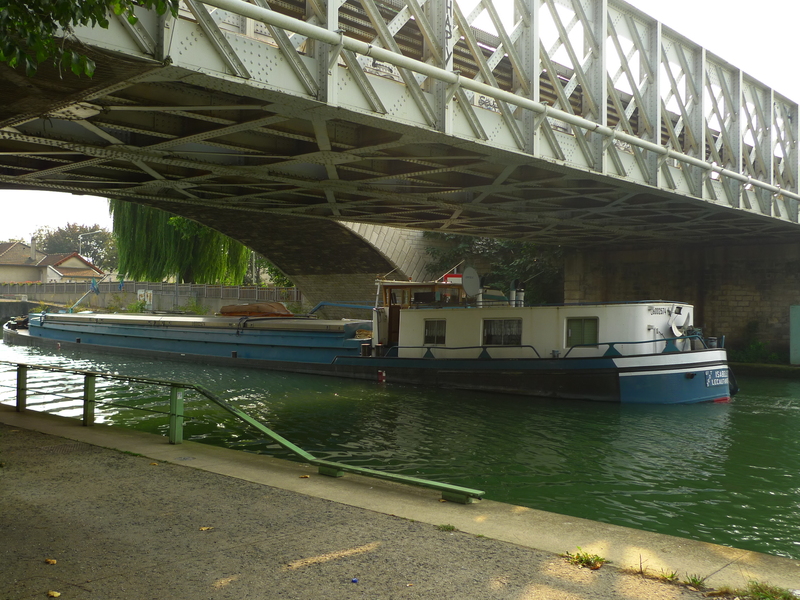 This type of barge is called a ‘pusher’ and it’s quite common to see them on the Canal de l’Ourcq, the Canal Saint-Denis and, of course, on la Seine. They comprise a pusher tug and barge combination combining the operational capabilities of a non-propelled split hopper barge together with the capabilities of a pusher tug. This one was empty but I was to meet it again on my walk along the canal, this time heading in the opposite direction when it was full of sand. 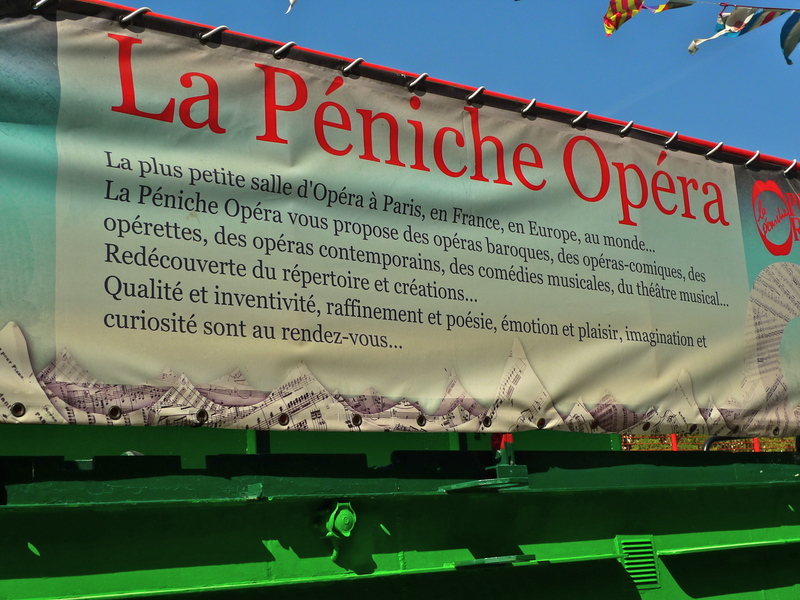 Pausing under the Boulevard Périphérique to record some sounds (of which more later) I happened upon this sign. 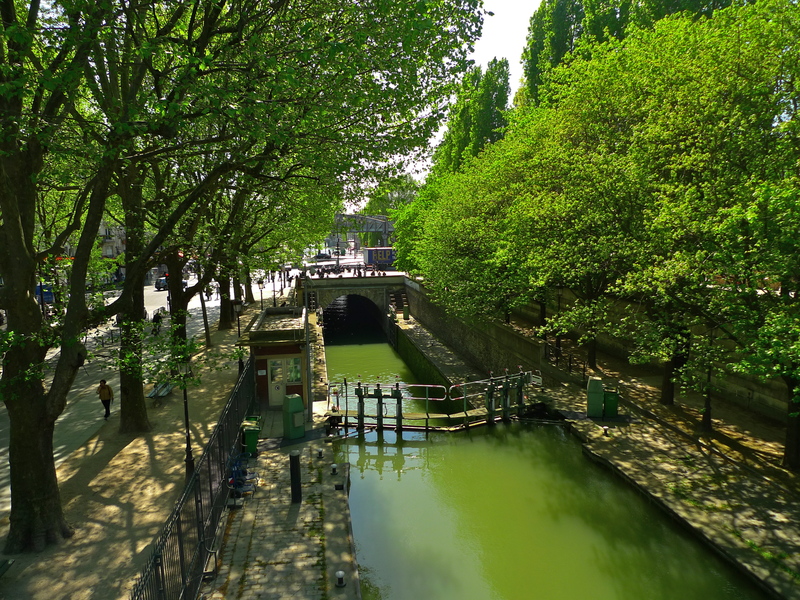 The towpath along the Canal Saint-Denis forms part of l’Avenue Verte, the 406 km cycle route stretching from Paris to London, a good part of which follows special traffic-free greenways. 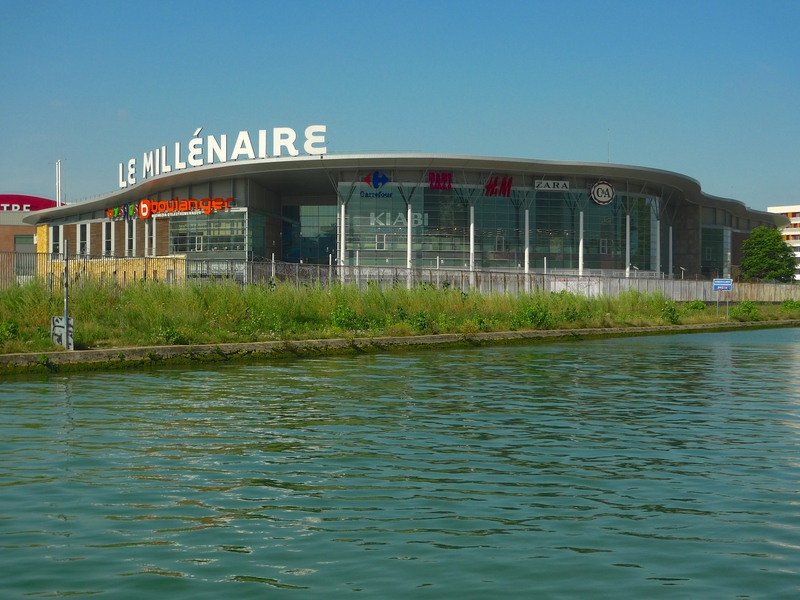 On the opposite side of the canal just beyond the Périphérique I came upon the shopping complex Le Millénaire which you can get to by road but it’s also served by a fleet of electric powered ferries, or navettes fluvials, which you can see and hear in Part 1 of my exploration of this canal. 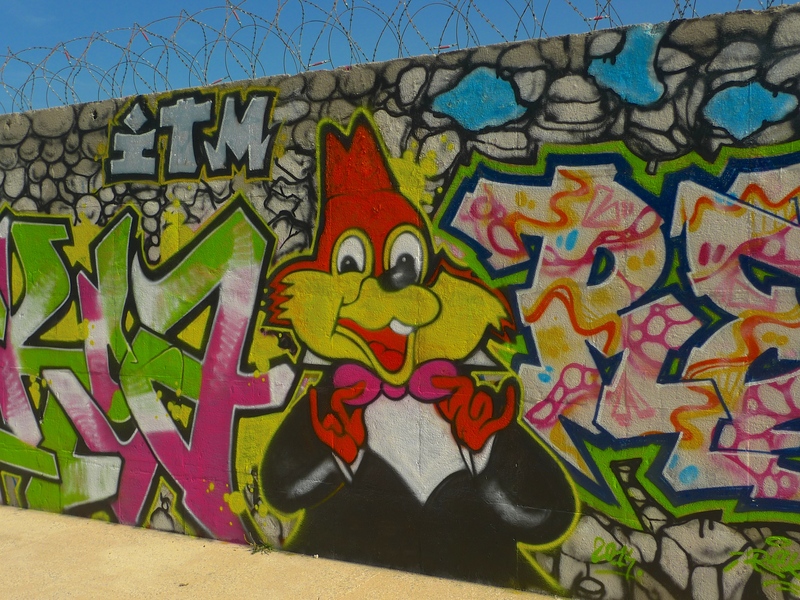 On my side of the canal I discovered a wall covered in colourful graffiti. At the end of the wall I crossed the Paris city limits into the commune of Aubervilliers and the second lock on the canal, l’Écluse des Quatre Chemins. 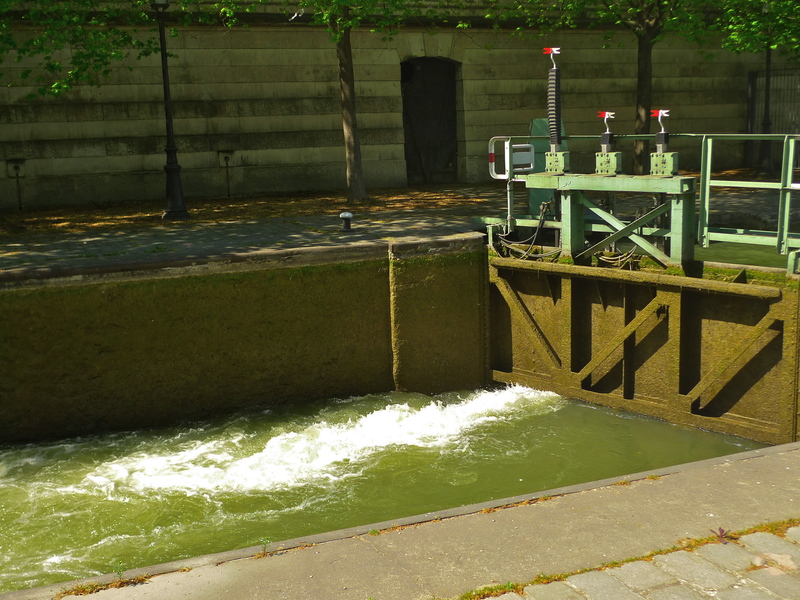 This lock, like all the locks on the canal, is a dual-chamber lock remotely controlled from Lock N°1, l’Écluse du Pont de Flandre, at the head of the canal. 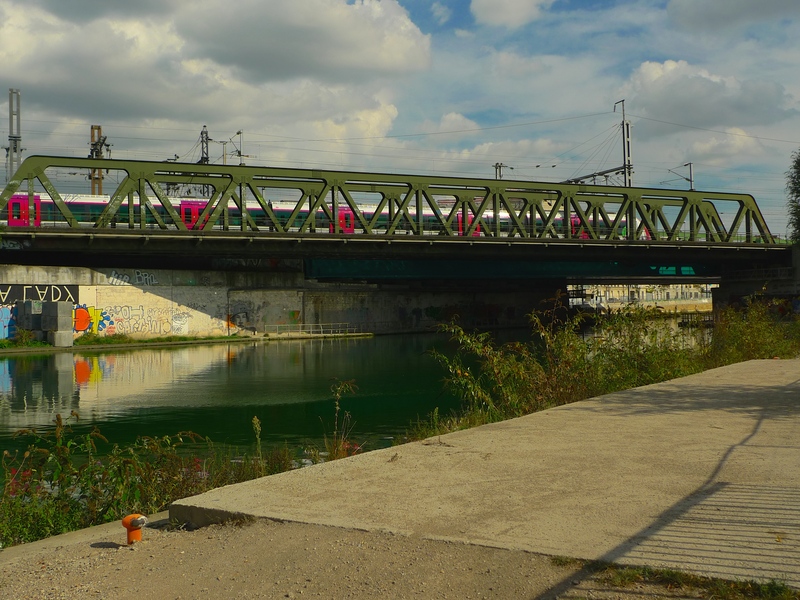 After leaving the Paris city limits, the Canal Saint-Denis crosses the western edge of Aubervilliers from south to north before reaching Saint-Denis. Originally a hamlet called Notre-Dame-des-Vertus, the first reference to Aubervilliers comes in the mid-eleventh century when it was known as Albertivillare. 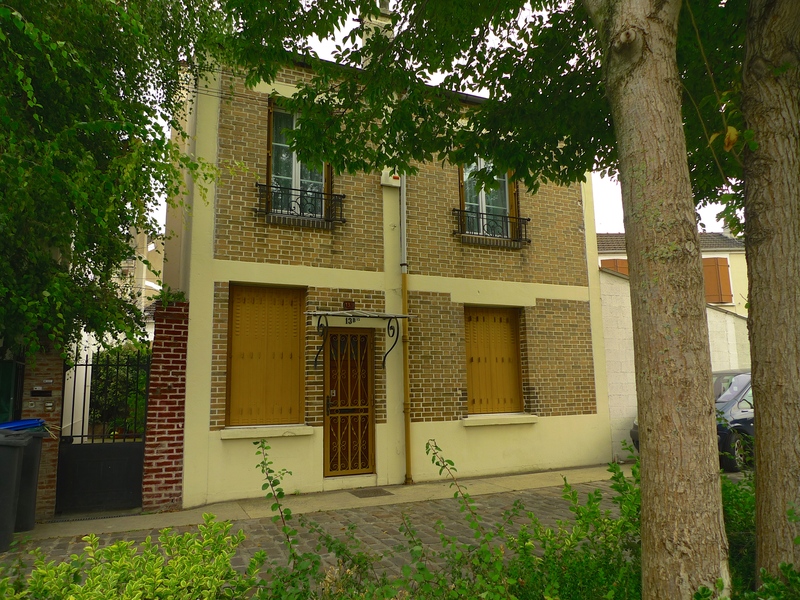 These names live on today with the thirteenth-century church still called the Église Notre-Dame-des-Vertus, the fourth lock on the canal is called l’Écluse des Vertus and the residents of Aubervilliers are still known as Albertivillariens or Albertivillariennes. Up until the early nineteenth-century Aubervilliers’ claims to fame were the miracles that were supposed to have happened in the parish in the Middle Ages and the quality of its vegetables, notably cabbages and onions, that were much sought after in the Parisian markets. 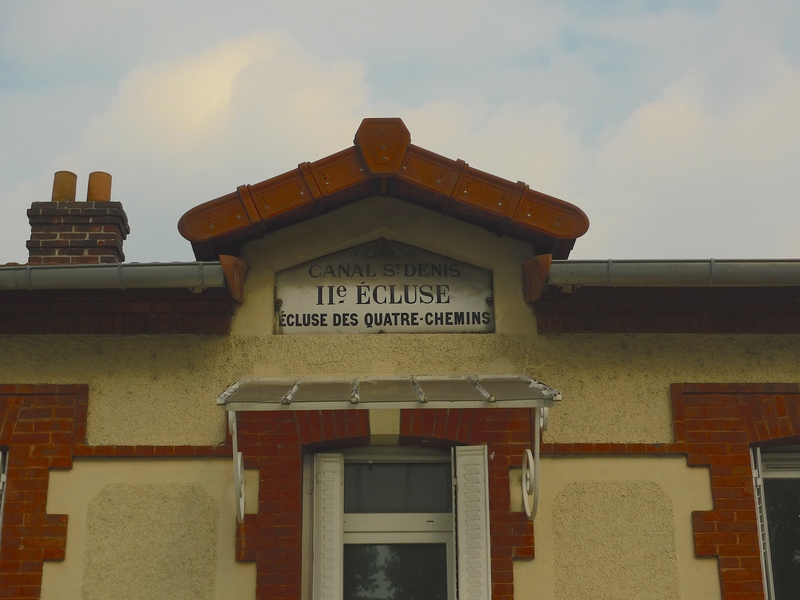 Once totally dependent upon the large, fertile, agricultural plain on which it stood, the nineteenth-century marked a turning point for Aubervilliers. The years following the arrival of the Canal Saint-Denis in 1821 and the removal of the barrières d’octroi (the tax barriers) in 1860 saw a medieval peasant village transformed into an industrial city with much of the industry centred along the canal. 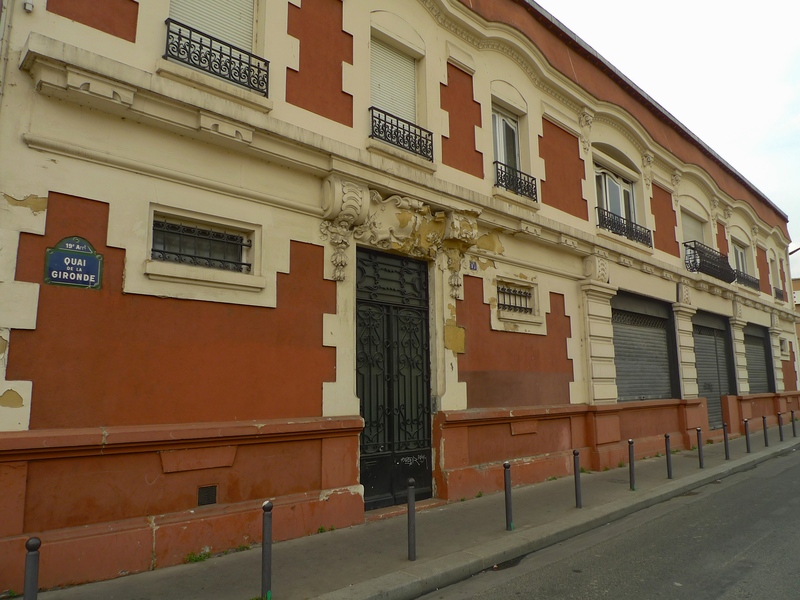 Among the industries that sprang up were factories manufacturing soap, sulphuric acid, matches (the former match factory is now preserved as an historic monument), glass, tripe, chemicals (the buildings of La Pharmacie Centrale de France still remain), and ceramic, plaster and cork tiles. 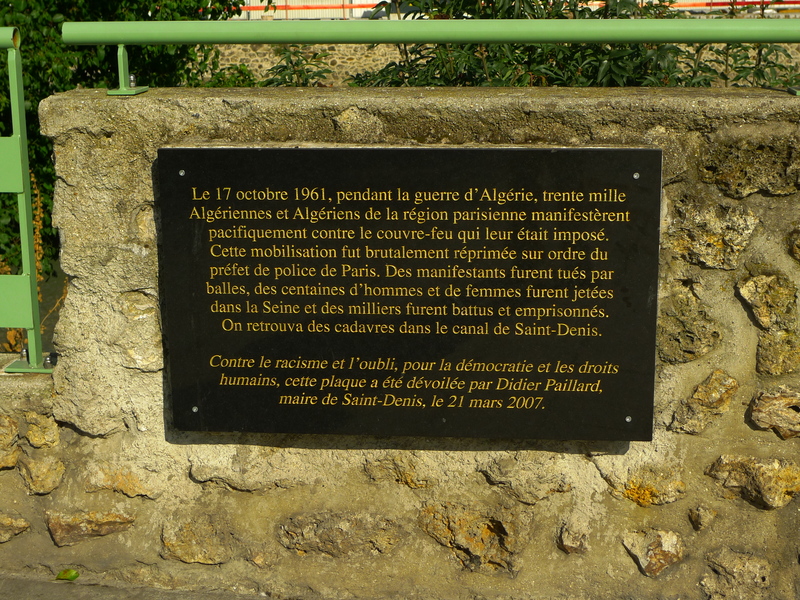 All this changed the face of Aubervilliers. At the end of the 19th century people from Belgium, Lorraine, Alsace, Brittany, Spain, and Italy arrived in successive waves seeking work in these new industries. 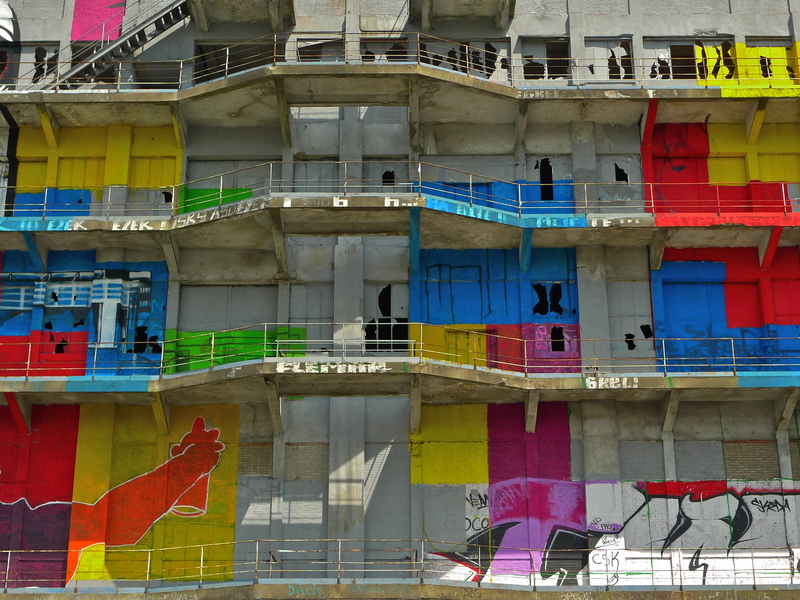 The Quatre-Chemins district, which straddles the boundary of Aubervilliers and Pantin, was pejoratively nicknamed La Petite Prusse (Little Prussia) due to the many immigrants coming to work in the Saint-Gobain glassworks established in 1866 next to the canal. Just as the industrial revolution changed the face of Aubervilliers, so has its de-industrialisation. Today, the large manufacturing industries have gone to be replaced by a network of service industries including the Rhodia and Saint-Gobain research laboratories, Orange S.A., Documentation Française (housed in the former match factory), some workshops of the Paris Métro and a large RATP bus depot. New areas have developed in fields such as telecommunications, audiovisual and cinema (Euromédia, Studios d’Aubervilliers, Ciné-Lumières), and textiles and fashion (Kookai, Redskins, Hugo Boss, Afflelou, etc.). Wholesale activities have also become a strong sector with more than 300 establishments concentrated around the Port of Aubervilliers importing cheap manufactured goods (textiles, watches, toys, etc. ), mainly from China, which are distributed throughout France. 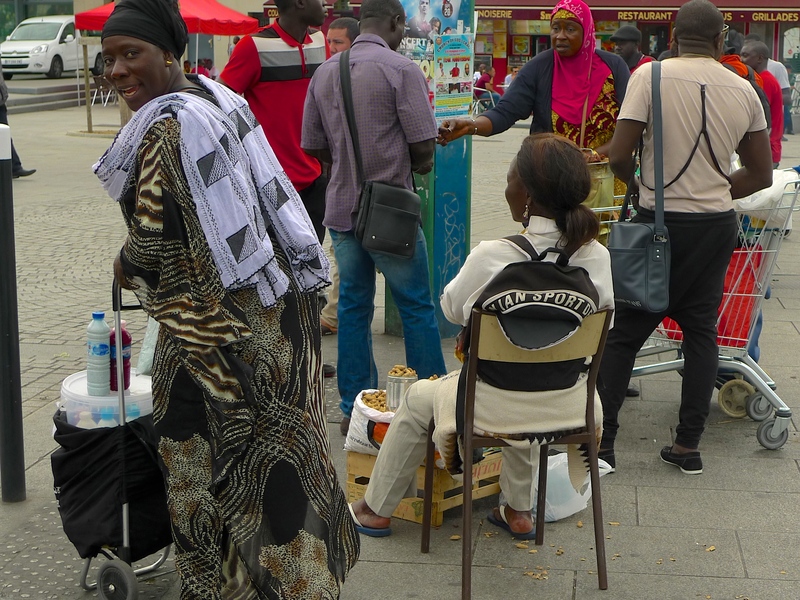 But, despite the rise of these service industries, Aubervilliers still suffers the blight of de-industrialisation since most of the people employed by these industries don’t live in the commune. 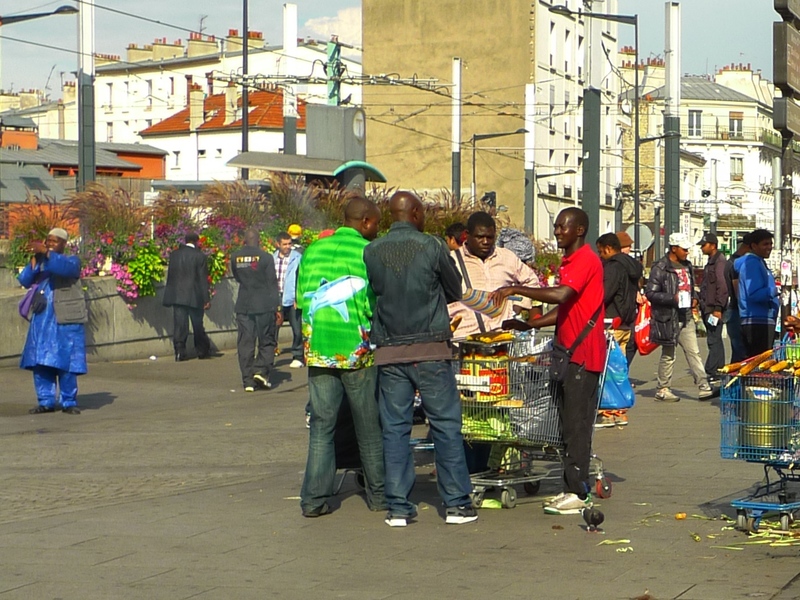 With a population of over 70,000, around 40% of whom are immigrants now mainly from Africa, Aubervilliers is one of the poorest municipalities around Paris. 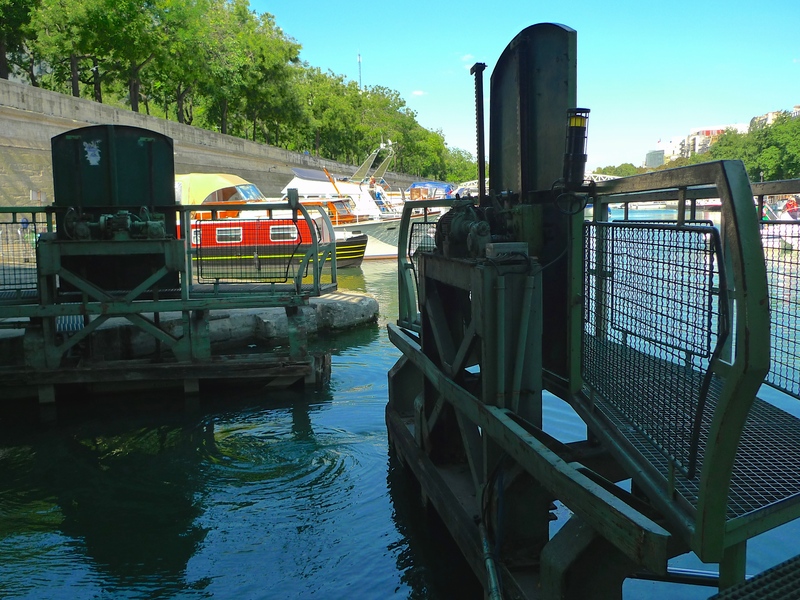 Today, it’s only the depots for cement, concrete and aggregates for use in the building industry that line this part of the Canal Saint-Denis. So, I’d now walked from the start of the Canal Saint-Denis in the Parc de Villette (see The Canal Saint-Denis and its Sounds – Part 1), I’d explored four of the locks on the canal, walked under six road bridges, one footbridge and one railway bridge and I’d covered a little over half the length of the canal. Now I’d come to a bridge that I couldn’t walk under, the Pont Tournant du Canal Saint-Denis, the fascinating swing bridge. I was lucky enough to arrive as a barge was waiting to pass through and so I was able to watch the bridge in action. 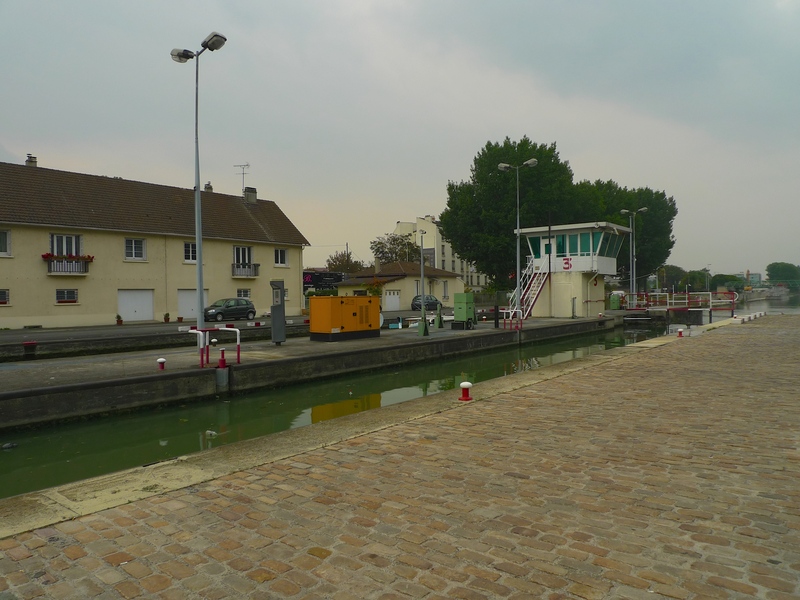 The barge waited on the canal until a signal from the control room at Lock N°1, l’Écluse du Pont de Flandre, at the head of the canal set the bridge in motion. Very sedately it swung open until it was completely aligned with the opposite bank allowing the barge to pass. Once the barge was clear, another signal set the bridge in motion once again and it began its return journey. I took up a prime position to record the sounds as the bridge swung gently back into place. 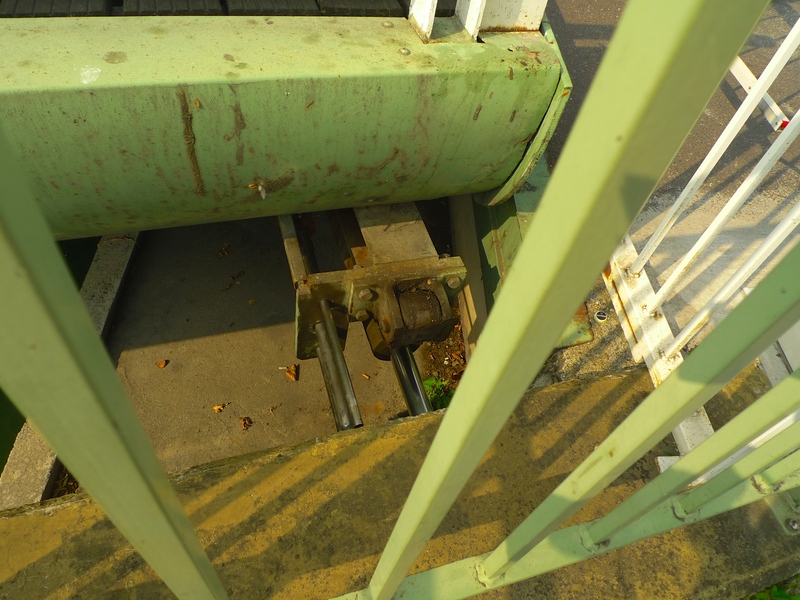 A set of hydraulic bars acted as guides to enable the bridge to slot into position. Once returned to its place, the bridge was still higher than the adjoining roadway and so with a hydraulic driven clatter it was lowered into its final position to make a seamless connection with the road. Once the bridge was locked into place, the gates were opened and the traffic began to pass. I found all this fascinating not only to see from such close range but also to listen to, which brings me neatly onto my sound portrait of this stretch of the Canal Saint-Denis. 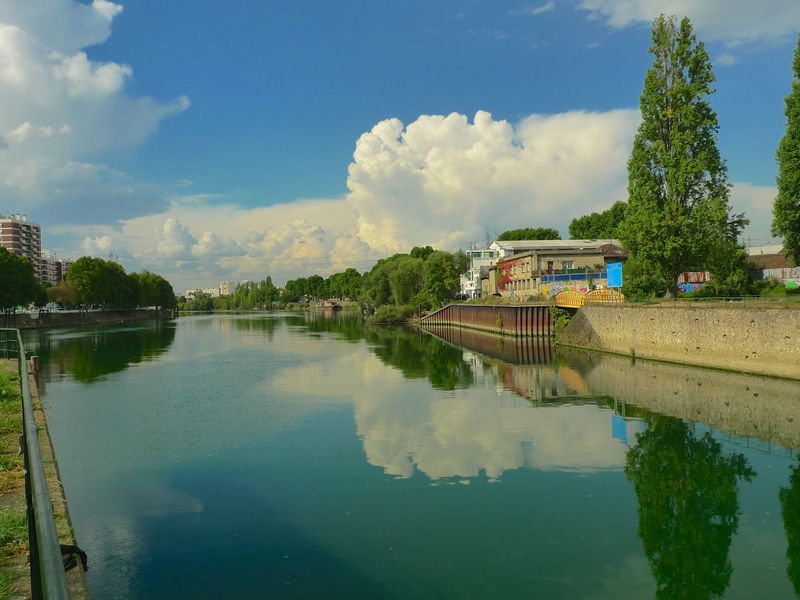 The Canal Saint-Denis from the Quai de la Gironde to the Pont Tournant du Canal Saint-Denis – A Sound Portrait. This sound portrait begins at the Pont MacDonald at the end of the Quai de la Gironde with the sounds of the ‘pusher’ barge passing under the bridge. Then come the curious sounds I recorded under the Boulevard Périphérique, a clattering as traffic passes overhead over a joint in the road. The delicious sounds of the engine of Puebla, a barge berthed at the side of the canal opposite the ready mix concrete works, comes next with the purring sound of the barge’s engine interspersed with the whistling sounds of trucks reversing under the ready mix concrete hoppers. Next are the sounds of a barge manoeuvring into l’Écluse des Vertus accompanied by the sounds of trains crossing the railway bridge overhead. 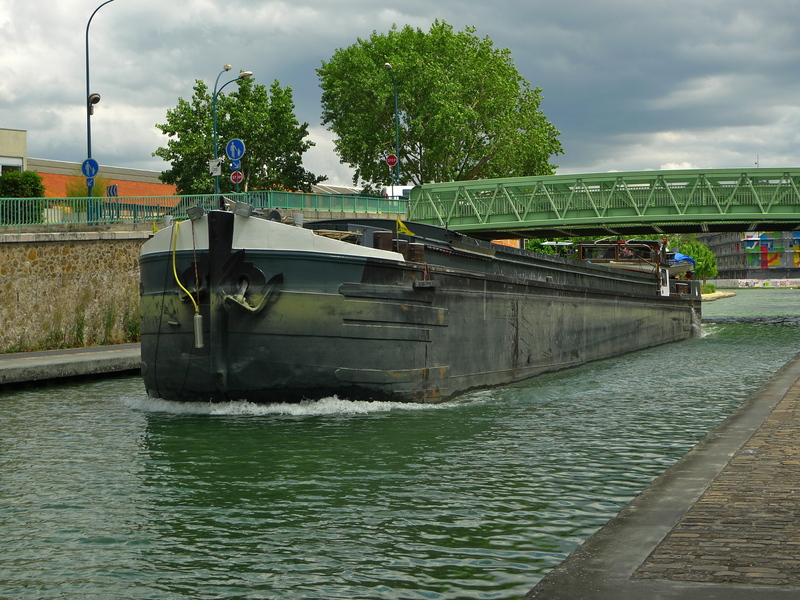 And then … well, then comes what will undoubtedly be one of my sounds of the year – the sounds of the barge passing and then the Pont Tournant du Canal Saint-Denis closing. Capturing sounds like these make all the countless hours I spend walking in and around Paris hunting for sounds worthwhile. 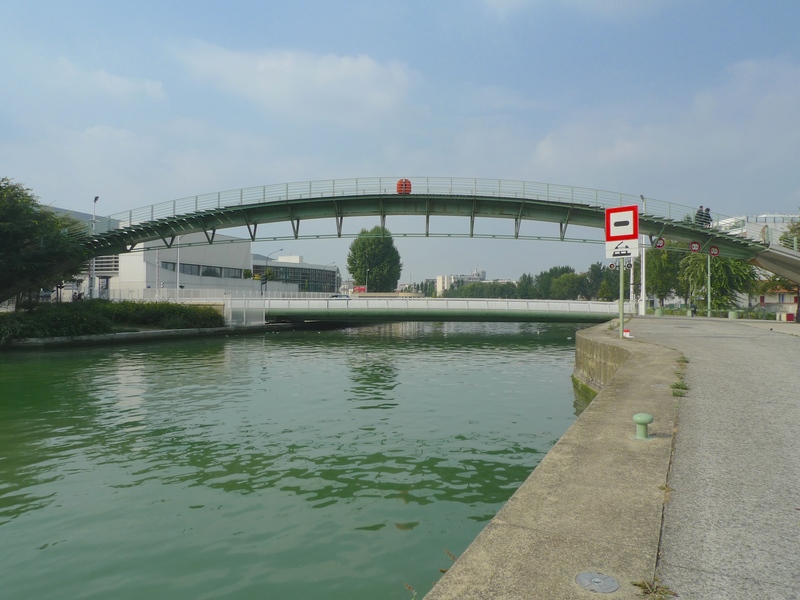 Next time, I will complete my journey along the Canal Saint-Denis from this swing bridge to Lock N° 7, l’Écluse de la Briche, where the canal discharges into la Seine. 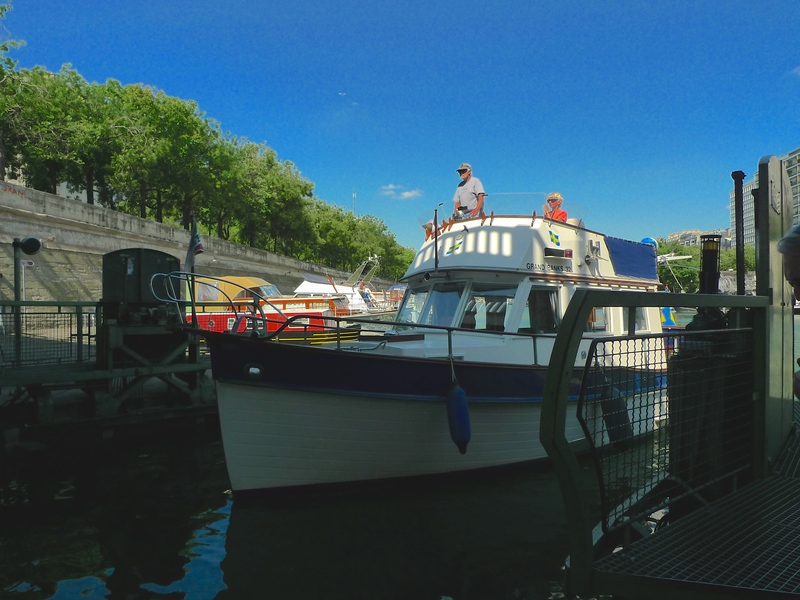 That will include exploring three more locks, walking under two more road bridges, one of which is absolutely huge, two footbridges and a railway bridge as well as pausing on the way to look at France’s National Stadium, the Stade de France, and the commune of Saint-Denis. 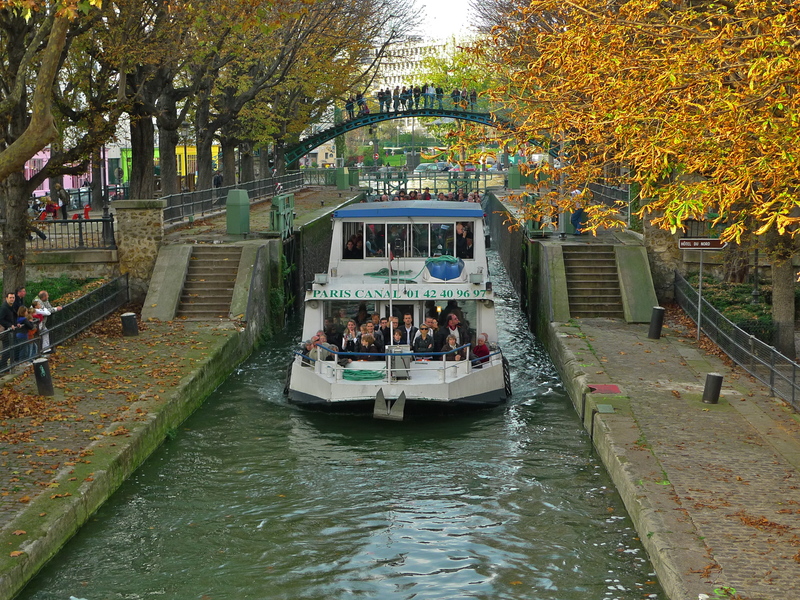 ALONG WITH THE Canal de l’Ourcq, the Bassin de la Villette, the Canal Saint-Martin, and the Bassin de l’Arsenal, the Canal Saint-Denis is part of the 130 km Réseau des Canaux Parisiens – the Parisian Canal Network. 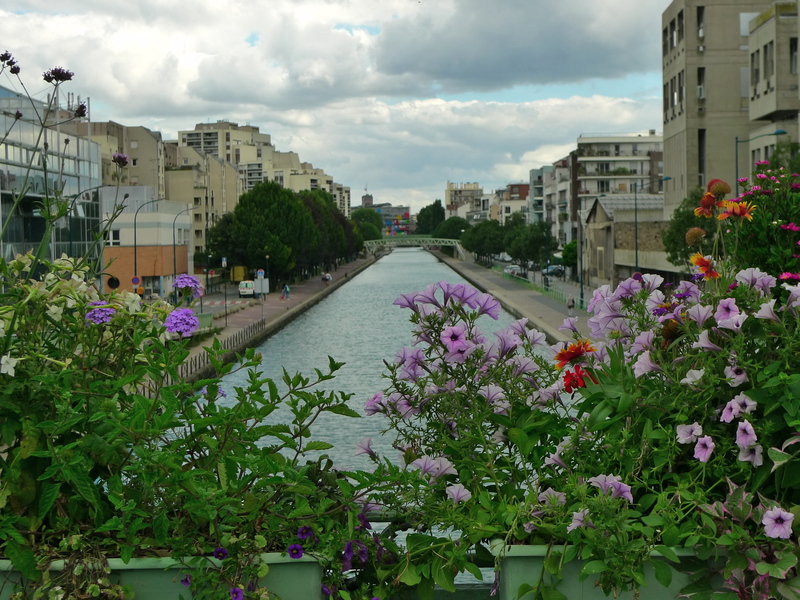 The Canal Saint-Denis links the Canal de l’Ourcq at the Parc de la Villette in the 19th arrondissement to la Seine in the commune of Saint-Denis, 6.6 km to the northwest. From the Canal de l’Ourcq to la Seine the canal navigates seven remote-controlled locks and one remote-controlled swing bridge and it drops some 28 metres. The canal is 3.2 metres deep at its shallowest point and 3.5 metres at its deepest and its width varies from 30 metres to 140 metres. It can accommodate vessels with a beam of up to 8 metres and a maximum displacement of up to 1,000 tons. It takes about two and a half hours for vessels to navigate the full length of the canal. 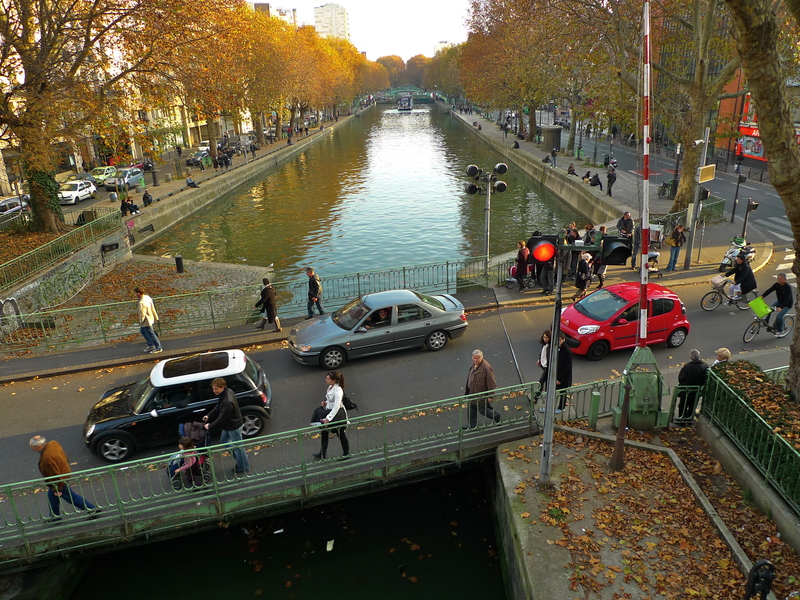 Like the Canal de l’Ourcq, the Canal Saint-Denis was born in the mind of Napoleon Bonaparte. Both canals were intended to provide an efficient means of communication for provisioning Paris but whereas the Canal de l’Ourcq was also intended to provide Paris with a plentiful supply of water, the Canal Saint-Denis was designed as what we might think of today as a ‘by-pass’, a means of reducing the number of ships and barges passing through the centre of the city. 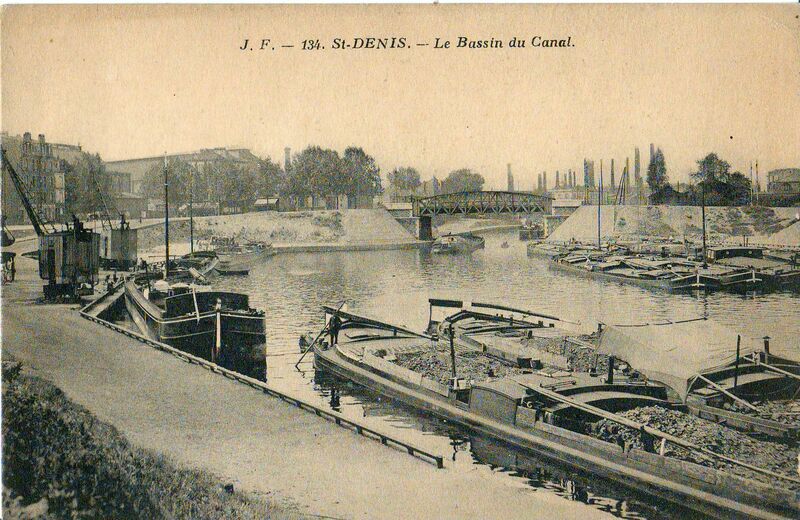 As well as being a by-pass for river traffic the Canal Saint-Denis was, and still is, a by-pass for water. 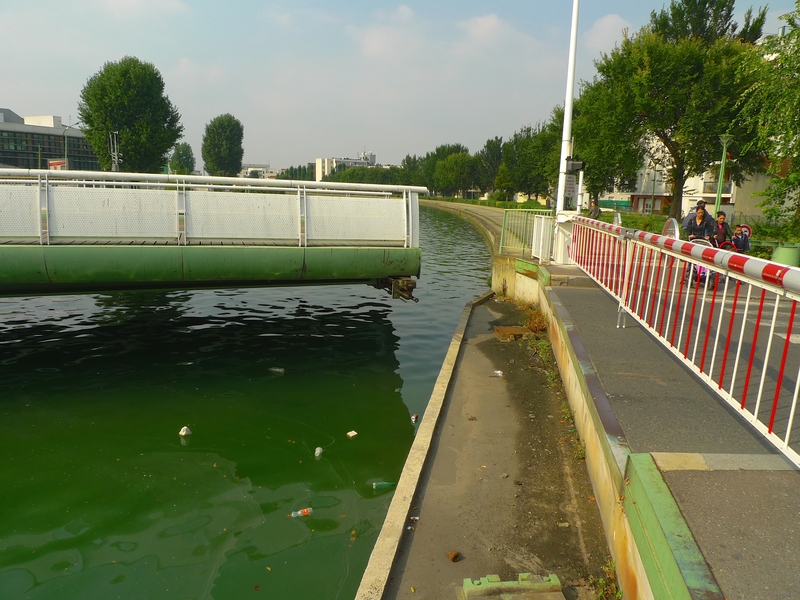 By diverting excess water from the Canal de l’Ourcq to the Seine, the Canal Saint-Denis serves to maintain constant water levels in Paris’s canals thereby helping to prevent flooding. 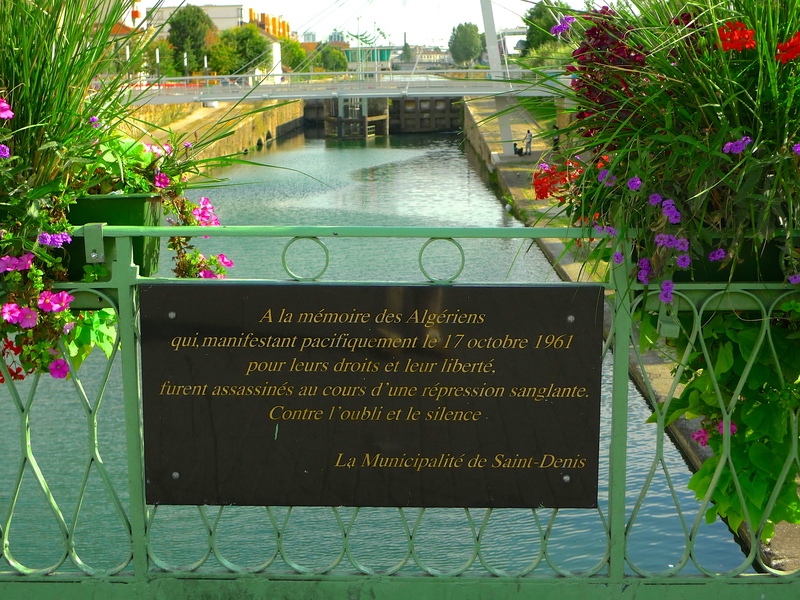 The building and operating of the Canal Saint-Denis was achieved through what we would now call a public-private partnership. The City of Paris purchased the land and then tendered contracts to private banking firms requiring them to build and operate the canal in return for which they were permitted to collect tolls from traffic using the canal for a term of ninety-nine years. 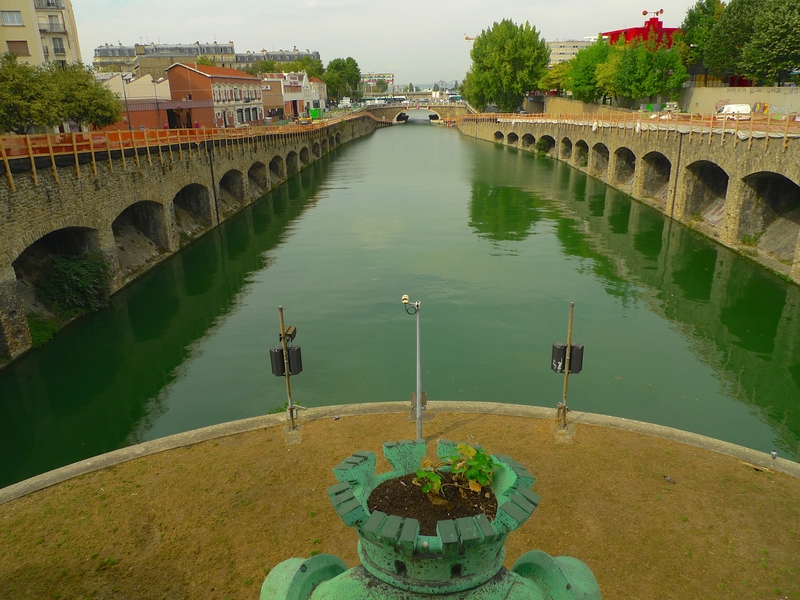 Work on the Canal Saint-Denis began in 1805 under the supervision of the French ingénieur des ponts et chaussées, Édouard de Villiers du Terrage, and it opened in May 1821, on time and, at an estimated six million Francs, under budget. 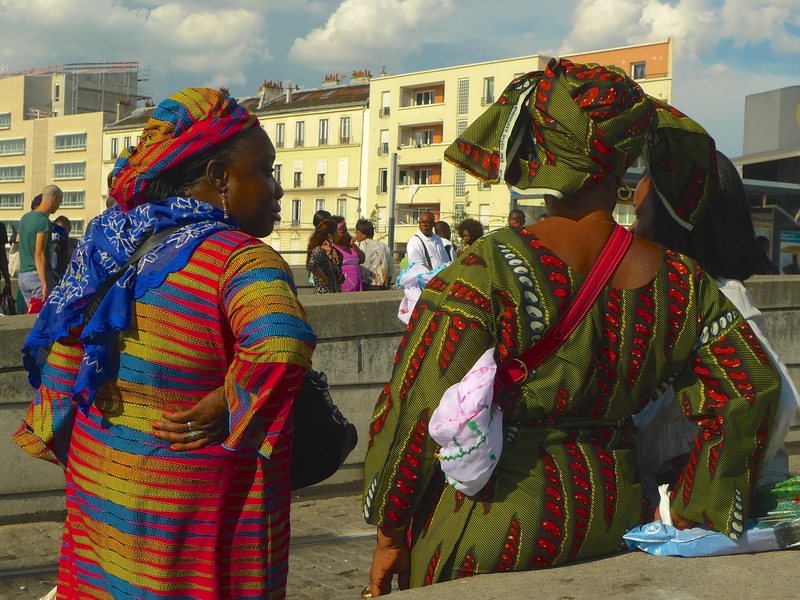 I’ve been to explore the Canal Saint-Denis by walking from one end to the other and in this and in subsequent blog pieces I will share with you what I observed. I began at the beginning, where the Canal Saint-Denis parts company from the Canal de l’Ourcq at the Parc de la Villette and runs alongside the Quai de la Gironde. Not only is the Parc de la Villette a large green space (at 35.5 hectares it’s the third largest park in Paris) it also houses one of the largest concentration of cultural venues in Paris, including the Cité des Sciences et de l’industrie (Museum of Science and Industry), three major concert venues and the prestigious Conservatoire de Paris. 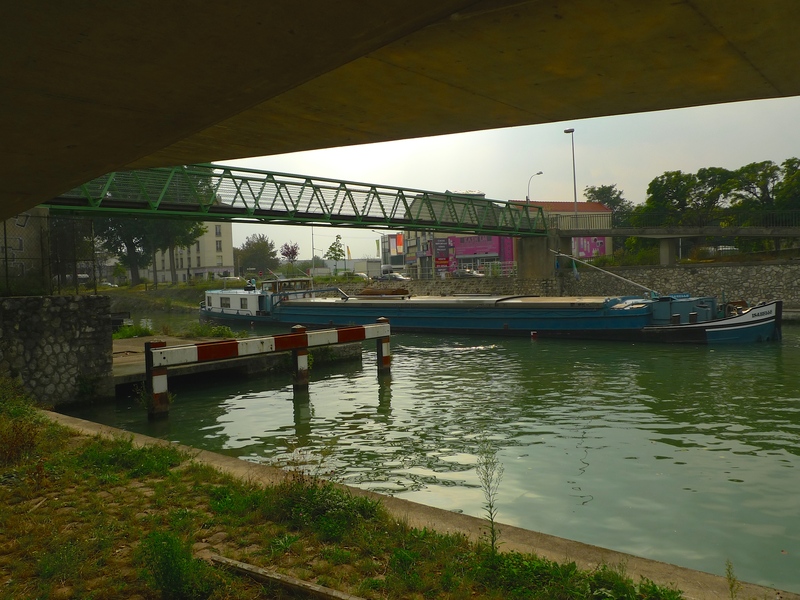 From my starting point at the head of the canal, I had the beginning of the Quai de la Gironde on my left and the entrance to the first lock on the Canal Saint-Denis, l’Écluse du Pont de Flandre, on my right. 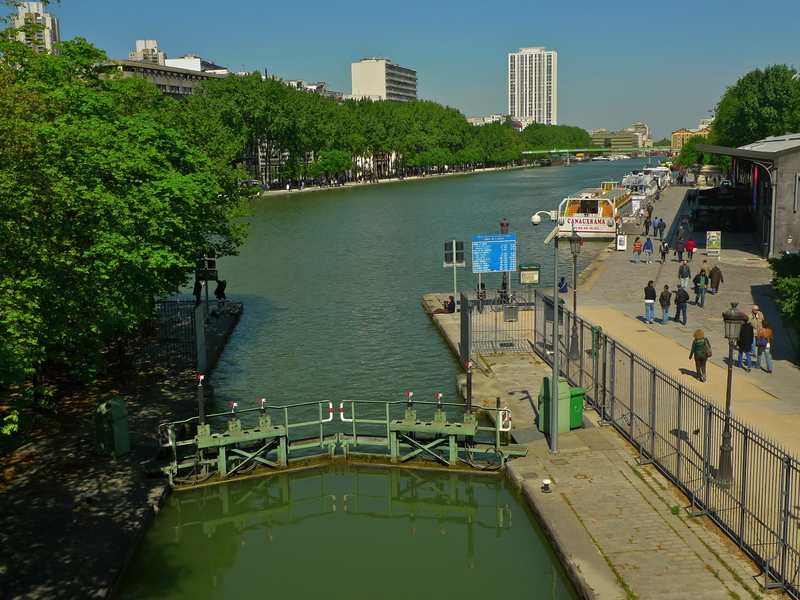 When the Canal Saint-Denis opened in 1821 there were twelve locks along its length. Between 1890 and 1895 the canal was rebuilt to accommodate bigger vessels and the number of locks was reduced from twelve to seven each comprising two adjacent chambers. 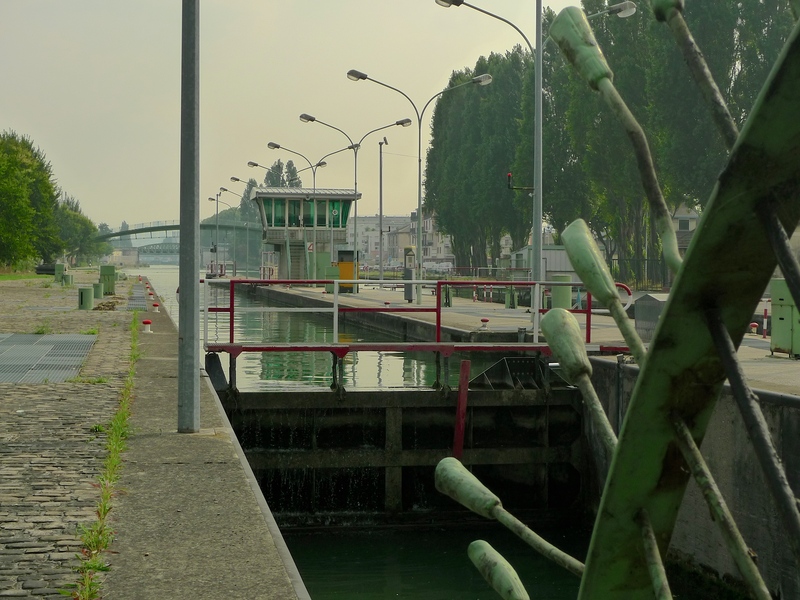 The largest lock on the canal is the first lock, l’Écluse du Pont de Flandre, with a rise of 10 metres which, when it was built, was a world-record. Today, all seven locks and the swing bridge on the Canal Saint-Denis are remotely controlled from l’Écluse du Pont de Flandre. 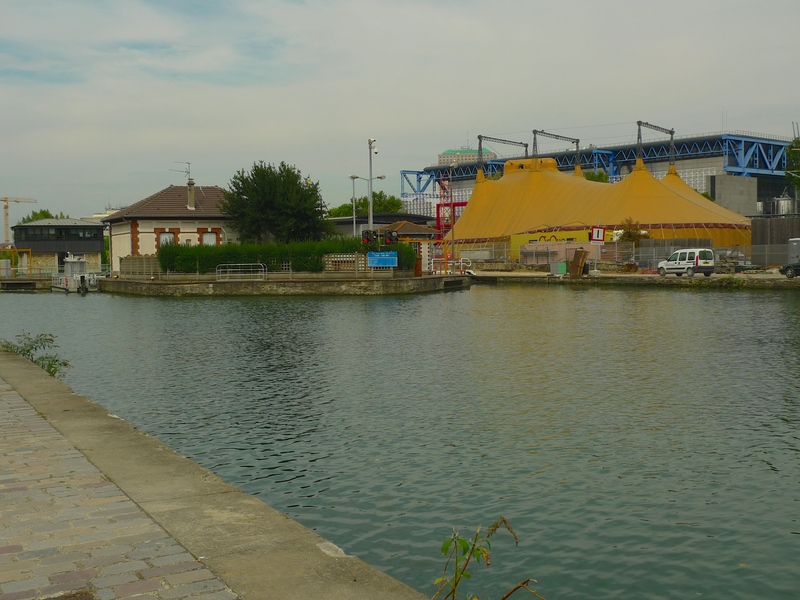 Work is underway to renovate the quays on either side of the canal between l’Écluse du Pont de Flandre and the Pont de Flandre so it was not possible for me to walk close to the water along this stretch. But I was able to walk alongside the canal along the Quai de la Gironde, which has its own history. In the early nineteenth-century, the Parisian flour and cereals warehouses were limited to the granary at Bastille and the Corn Exchange at Les Halles but with a rapidly growing population new storage facilities became necessary. 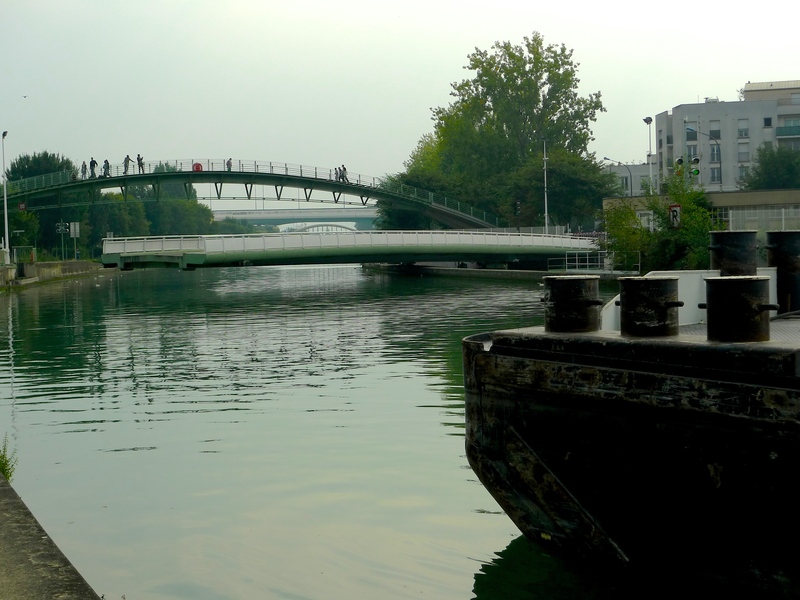 The area around La Villette was chosen because of its canals, which provided easy and inexpensive transportation. 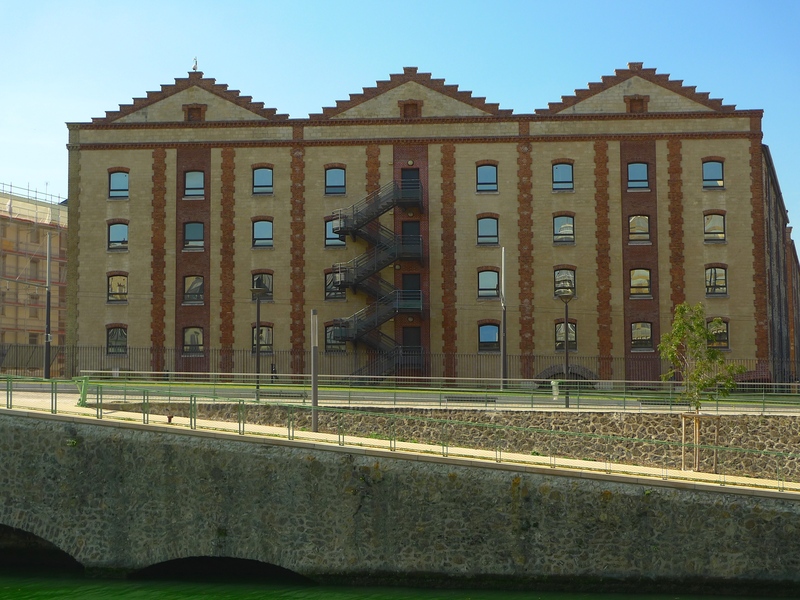 In 1858-1859, two stores docks and additional warehousing capacity were built along the Quai de la Gironde to store flour, starch, grain, oil, alcohol and commodities from the French colonies. In May 1871, during the last days of the Paris Commune, the warehouses were burned to the ground but they were rebuilt soon after and served Parisians for the next century. These warehouses alongside the Canal Saint-Denis, together with those at the pont du Crimée and alongside the Bassin de la Villette, were known as the Entrepôts et Magasins Généraux de Paris. Today, they are being redeveloped and turned into up-market office space. From the Pont de Flandre onwards, both the canal and the Quai de la Gironde take on a different feel. 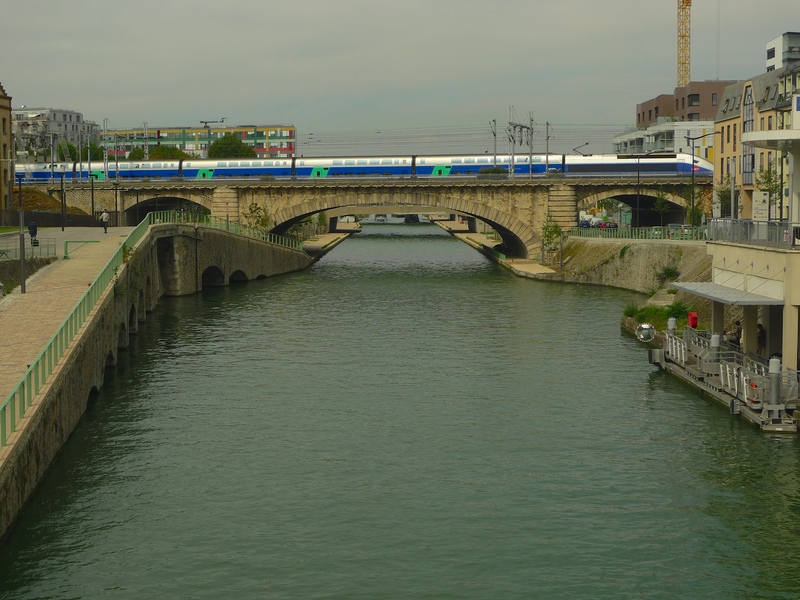 The slow moving, lumbering barges and the occasional leisure craft contrast with the sleek, high-speed (although not high-speed at this point) TGV trains crossing the railway bridge. 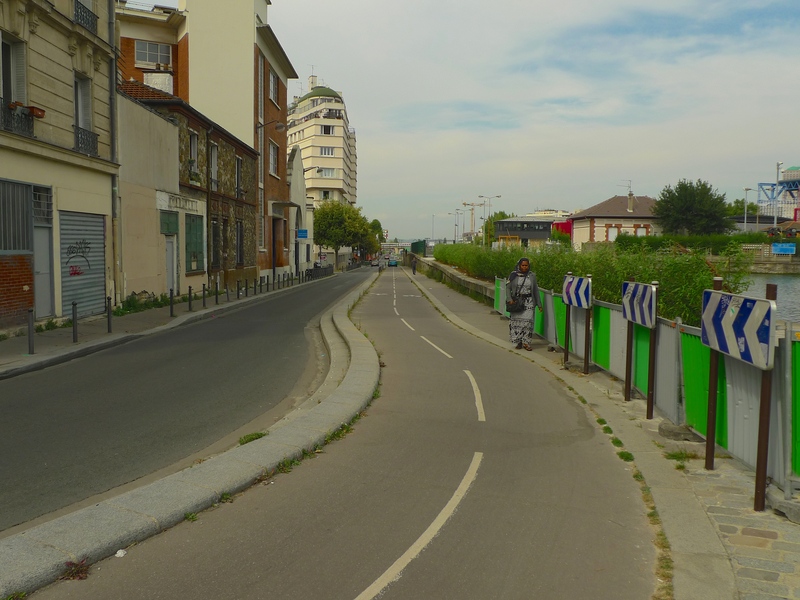 And the Quai de la Gironde ceases to become a road and is transformed into a paved thoroughfare accommodating both pedestrians and cyclists. 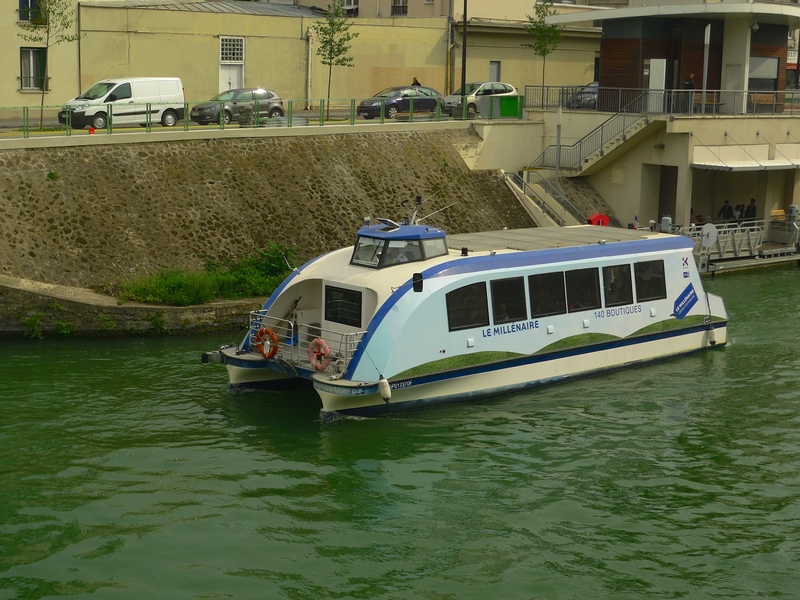 … while the navette fluviale taking visitors to and from the Millénaire shopping complex further downstream passes by on the other side. And all the while the sound of construction work echoes in the background as the former Entrepôts et Magasins Généraux are rejuvenated. It was from here amidst all the redevelopment work that I decided to pause and listen and to record a sound portrait of this stretch of the canal and the Quai de la Gironde. Next time, I will explore the canal from the end of the Quai de la Gironde to the swing bridge, the Pont Tournant du Canal Saint-Denis, but in the meantime, I will leave you with a view looking back along the canal from the end of the Quai de la Gironde – a very different view from that at its beginning. AT THE END OF the 12th century, Ville Neuve Saint Ladres was little more than a hamlet alongside the Roman road leading from Paris to Flanders. When a church was constructed in 1426 the hamlet’s name was changed to La Villette Saint-Ladres-lez-Paris. 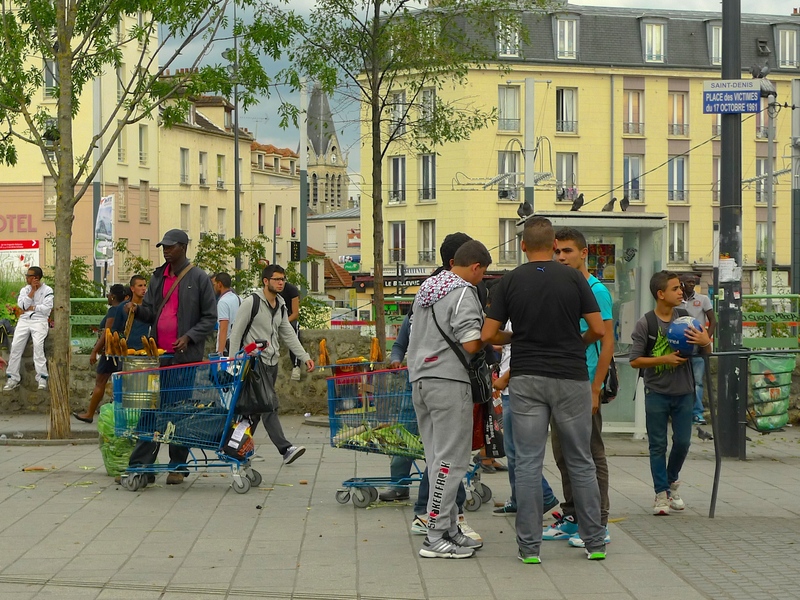 In 1790, La Villette, then with a population of some 1,800 souls, was formerly recognised as a commune and in 1860, by which time the population had increased to around 30,000, it was incorporated into the City of Paris. La Villette though was to play an important role in the life of the city before its formal incorporation. 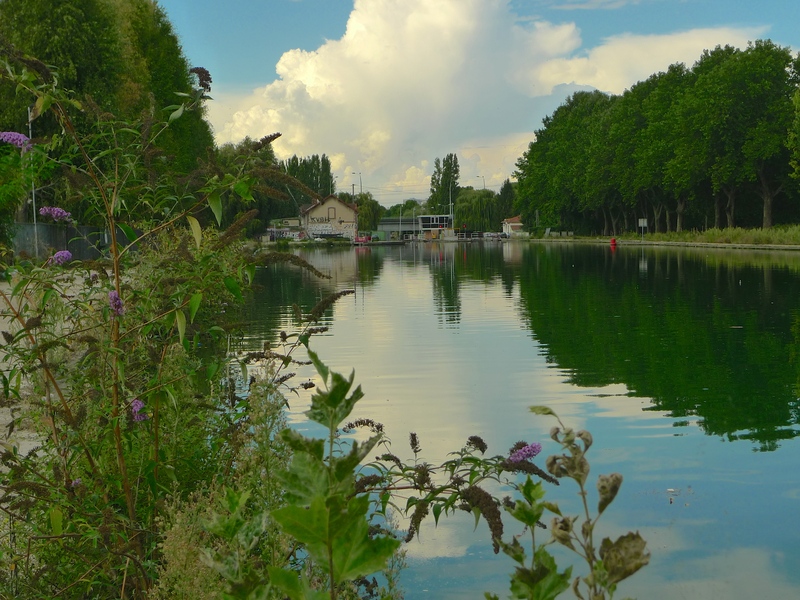 In 1802, mindful that a plentiful supply of water was a key to public health and to public morale, Napoleon Bonaparte ordered work to begin on the construction of a canal, the Canal de l’Ourcq, stretching one hundred and eight kilometres from Picardy to Paris. When completed, this canal would not only provide a plentiful supply of water to the city but also provide an efficient means of communication for provisioning the city. 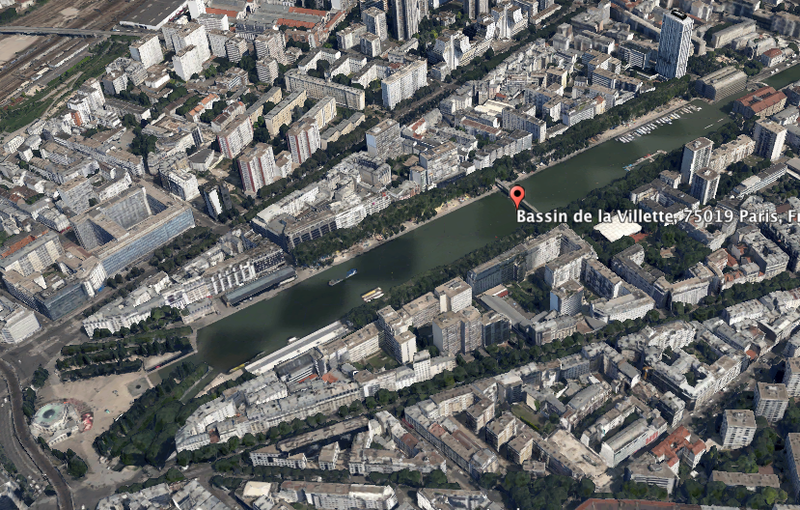 The Bassin de la Villette was created at the Paris end of the Canal de l’Ourcq from where the canal would link, and still links, to the Canal Saint-Denis, which enters the Seine close to Saint-Denis to the north and the Canal Saint-Martin which enters the Seine south of Place de la Bastille. Napoleon Bonaparte opened the Bassin de la Villette in 1808. Once the Canal Saint-Martin and the Canal Saint-Denis were completed in the 1820s the area around the Bassin de la Villette became not only a transit centre but also a busy commercial hub. Warehousing companies including the Compagnie des Entrepôts et Magasins Généraux set up on the quays alongside the Bassin mainly to store grain and flour as did a cattle market and several abattoirs. 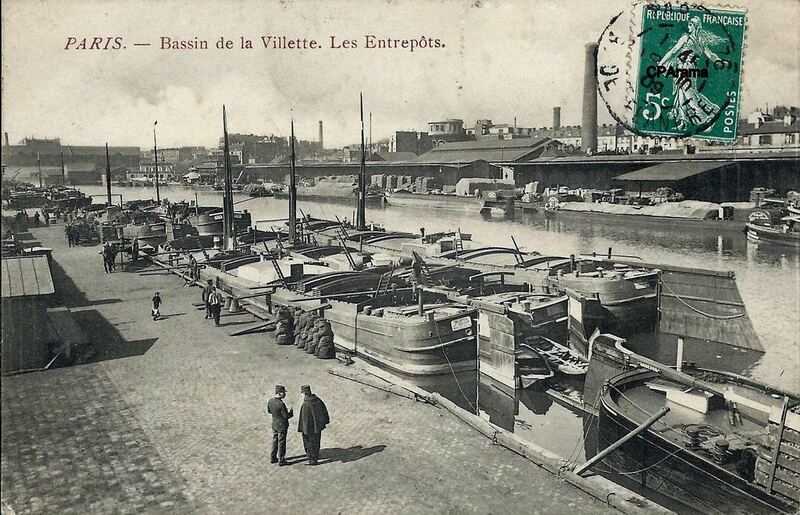 This industrialisation of the Bassin de la Villette lasted until the late 1960s by which time decline had set in and the warehouses were either abandoned or demolished. The cattle market and the abattoirs closed in the early 1970s. 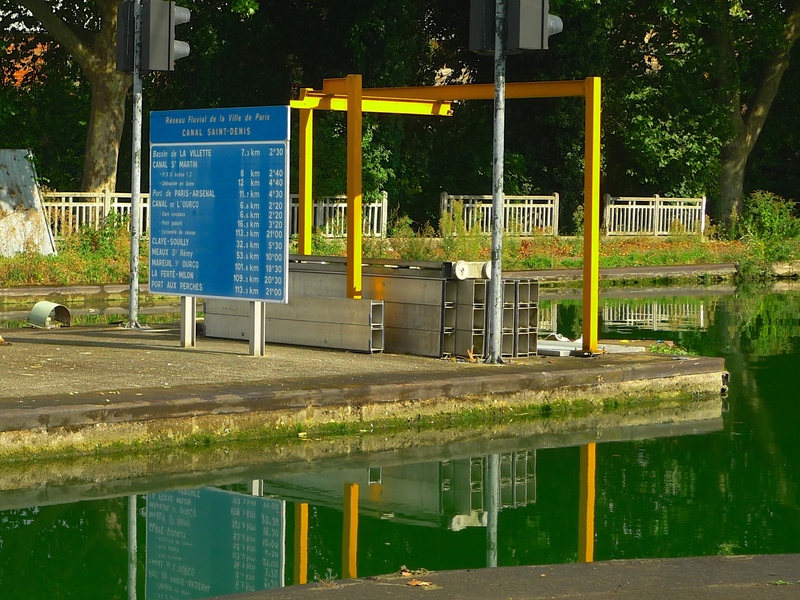 The Bassin de la Villette is in effect a man-made lake and at eight hundred metres long and seventy metres wide it’s the largest artificial lake in Paris but, despite its industrial decline, it still plays an important part in the life of the city. 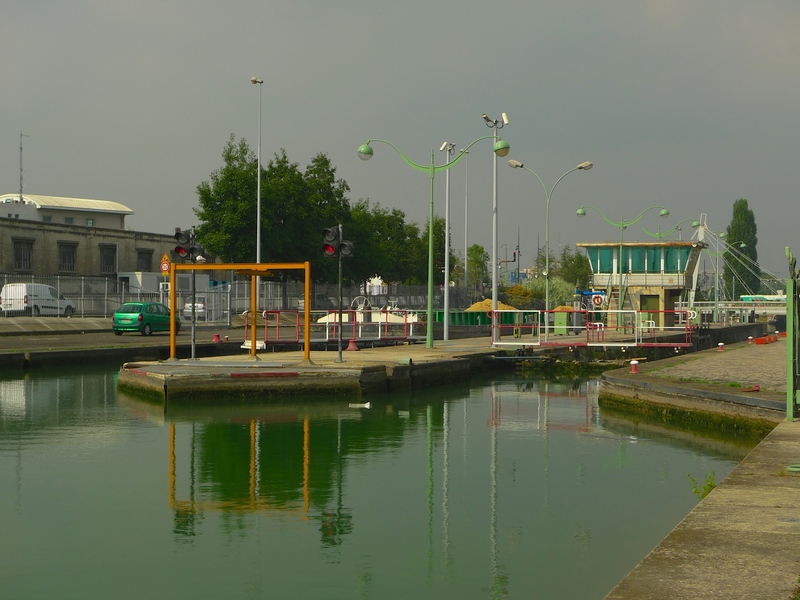 The Canal de l’Ourcq, which terminates at the Bassin de la Villette, still supplies about half of the daily water requirement for the city’s public works. 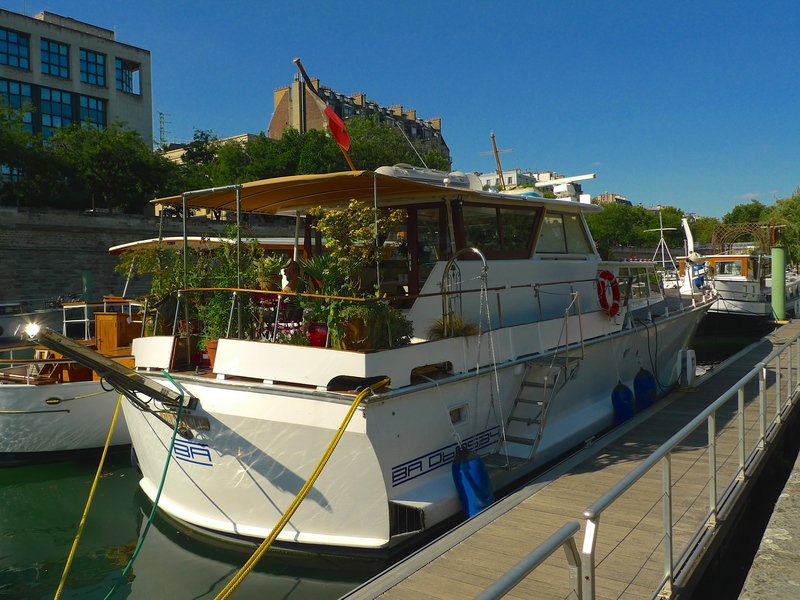 The Bassin is still a transport hub with the intersection where the Canal de l’Ourcq meets the Canal Saint-Denis with its mainly industrial canal traffic and the Canal Saint-Martin with its now thriving and lucrative tourist traffic. 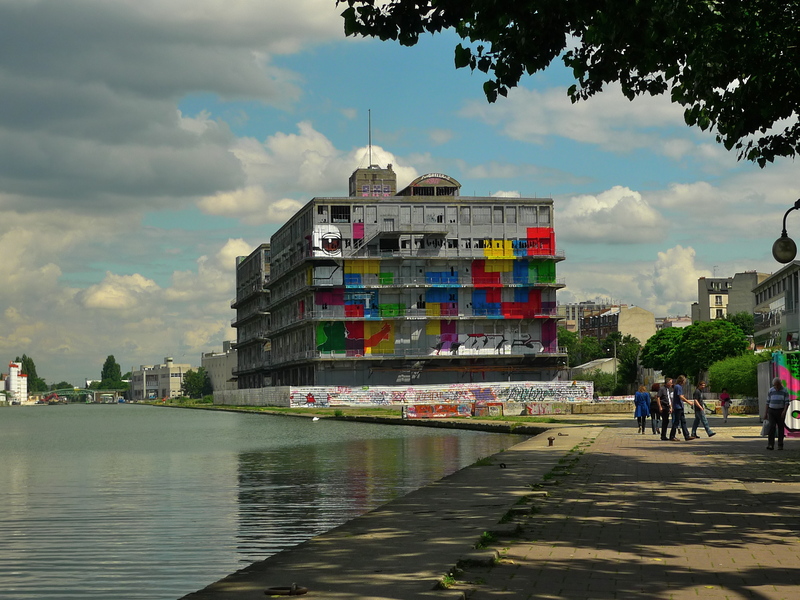 But the Bassin de la Villette has also undergone a revival with some of the former warehouses being converted into cinemas and restaurants and some of the barges into cultural venues. 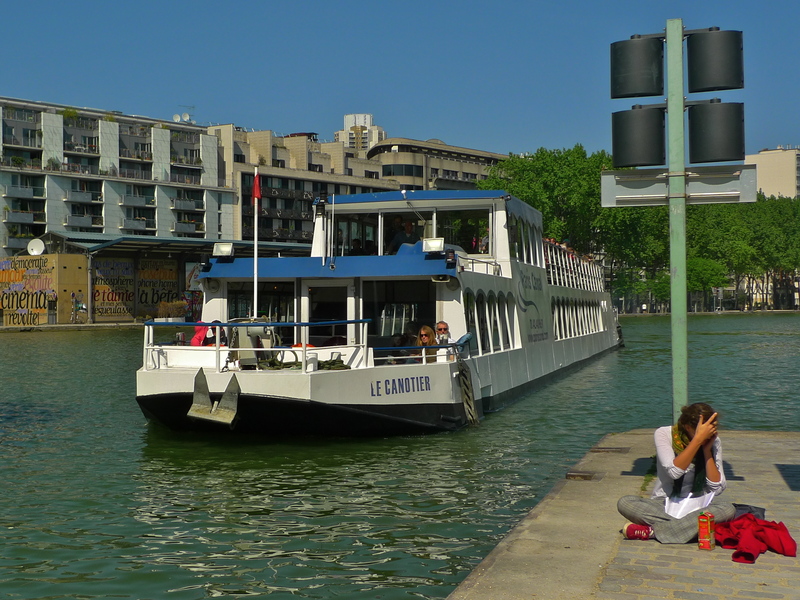 La Péniche Opéra for example is berthed on one side of the Basin de la Villette on the Quai de Loire. It’s a former industrial barge now billed as the smallest opera house in the world and it puts on a wide range of operatic events. 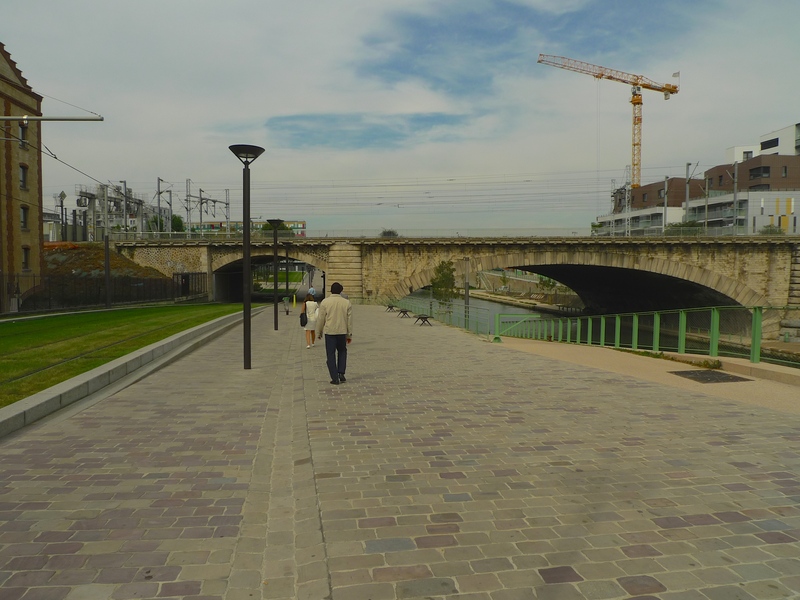 At the head of the Bassin de la Villette in what is now the Place de la Bataille de Stalingrad is another reminder of the history of La Villette. 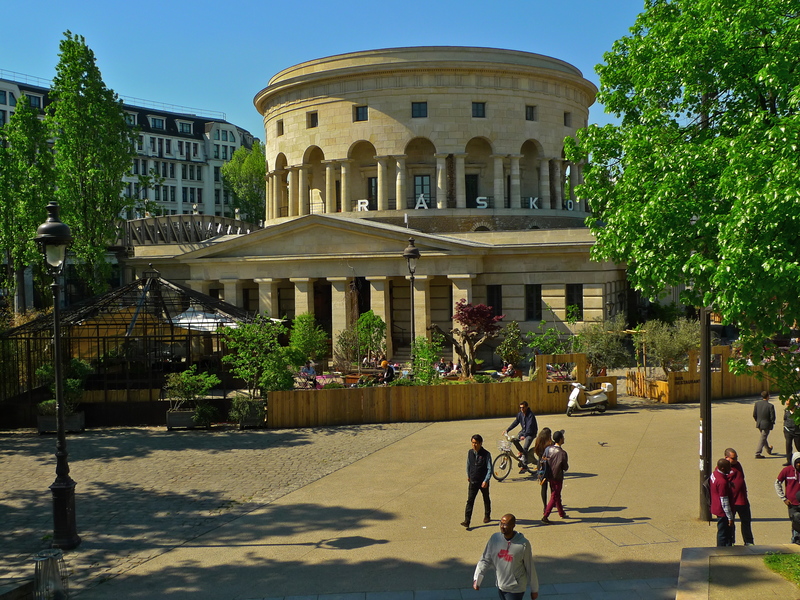 Built by one of the earliest exponents of French Neoclassical architecture, Claude-Nicolas Ledoux, the Rotonde de la Villette was originally one of the barrières d’octroi in the mur des Fermiers généraux, the Wall of the Farmers-General. This wall, built between 1784 and 1791 by the Ferme générale, the corporation of tax farmers, surrounded Paris and was intended to ensure the payment of a toll (octroi) on all goods entering Paris. The Rotonde de la Villette or the barrière Saint-Martin as it was known at the time, was one of sixty-two such tax collection points in the wall. 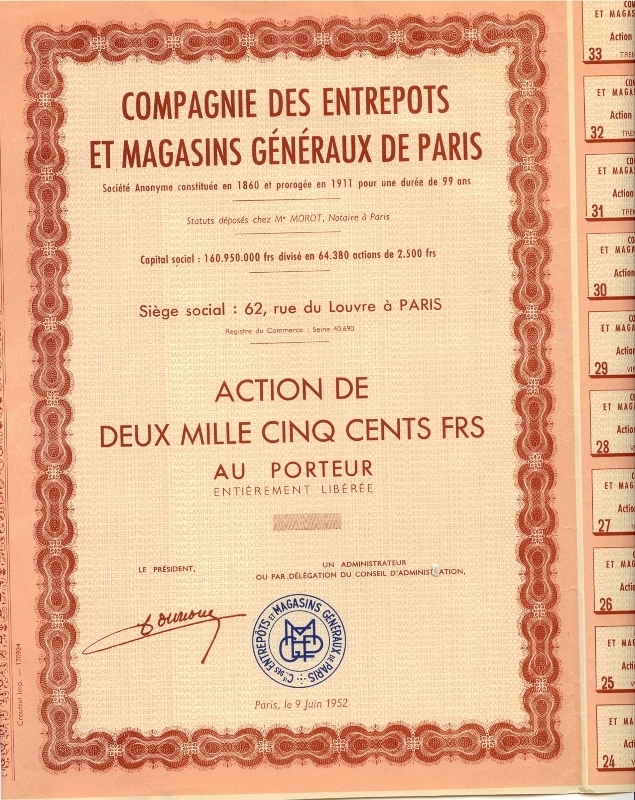 With the expansion of Paris in 1860 and with the octroi by then abolished most of these tax collection points were demolished. The Rotonde de la Villette escaped demolition and survived to become a bonded warehouse for the Compagnie des Entrepôts et Magasins Généraux. Today, it’s a restaurant unsurprisingly called La Rotonde. 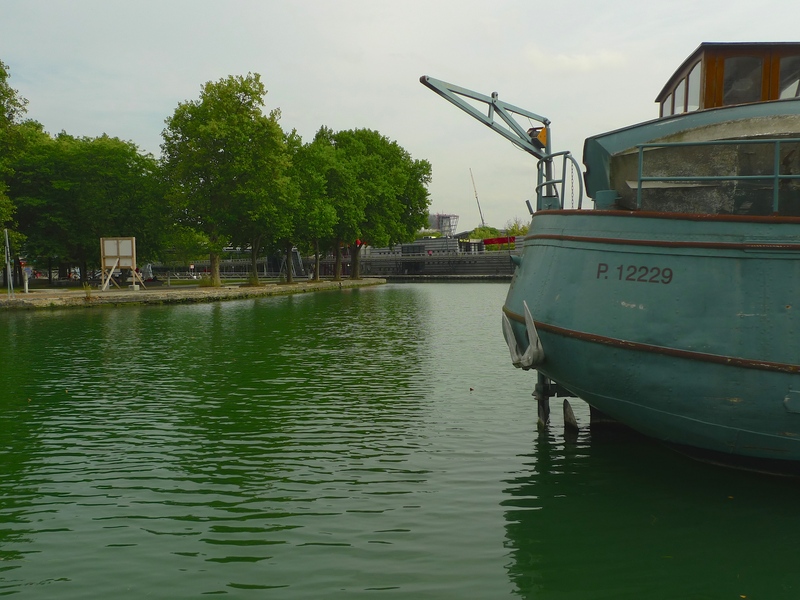 On my visit to the Bassin de la Villette I not only wanted to explore its history but also its sounds. 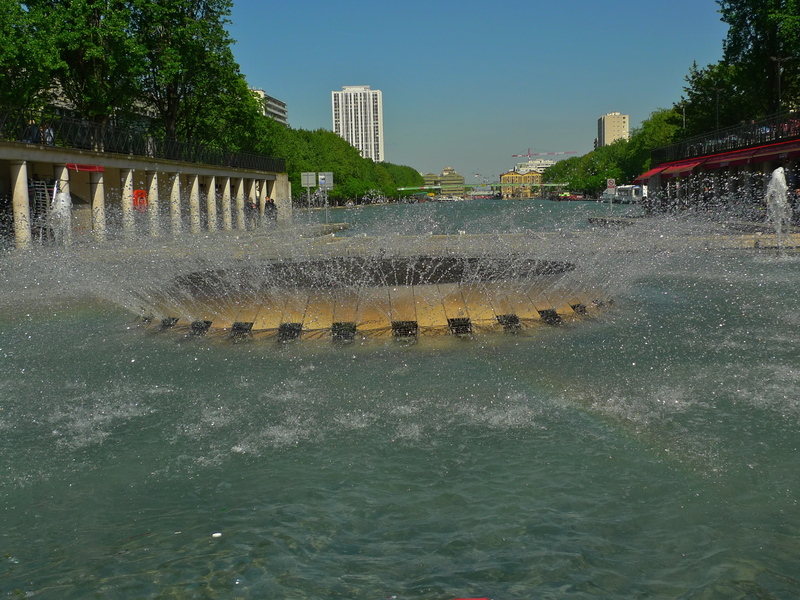 I recorded a soundwalk for my Paris Soundscapes Archive beginning at the fountain next to La Rotonde de la Villette. I walked along the Quai de Seine on one side of the Bassin, then over the Passerelle de la Moselle to the Quai de Loire on the other side, which brought me back to the head of the Bassin but this time at the Écluses de la Villette, the double lock at the head of the Canal Saint-Martin. 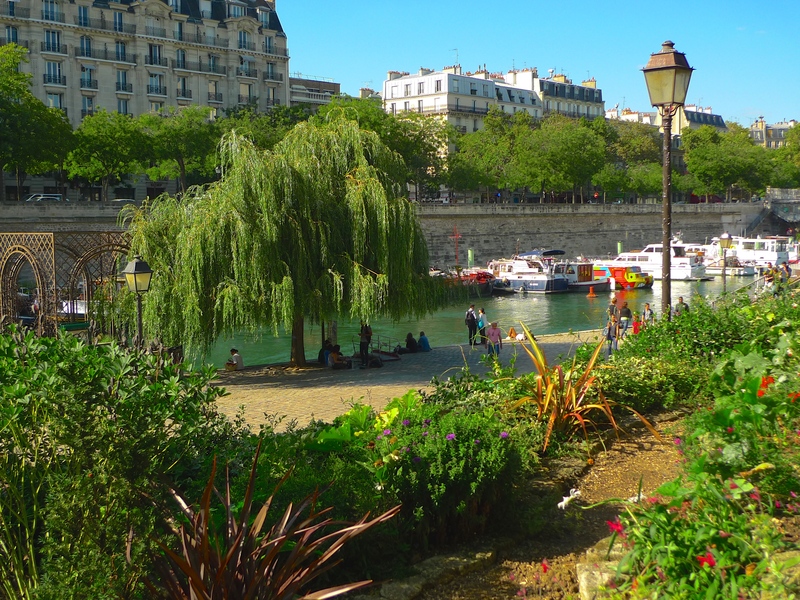 The Canal Saint-Martin links the Bassin de la Villette to la Seine. It’s four and a half kilometres long, two kilometres of it run underground and it passes through nine locks and two swing bridges. 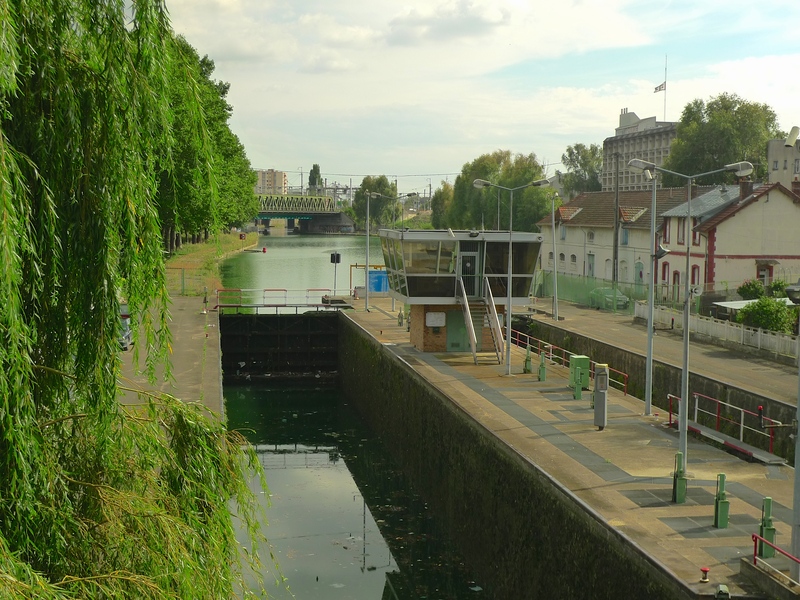 From the Bassin de la Villette to la Seine the canal drops a height of twenty-five metres, the first eight metres of which occurs at the Écluses de la Villette. 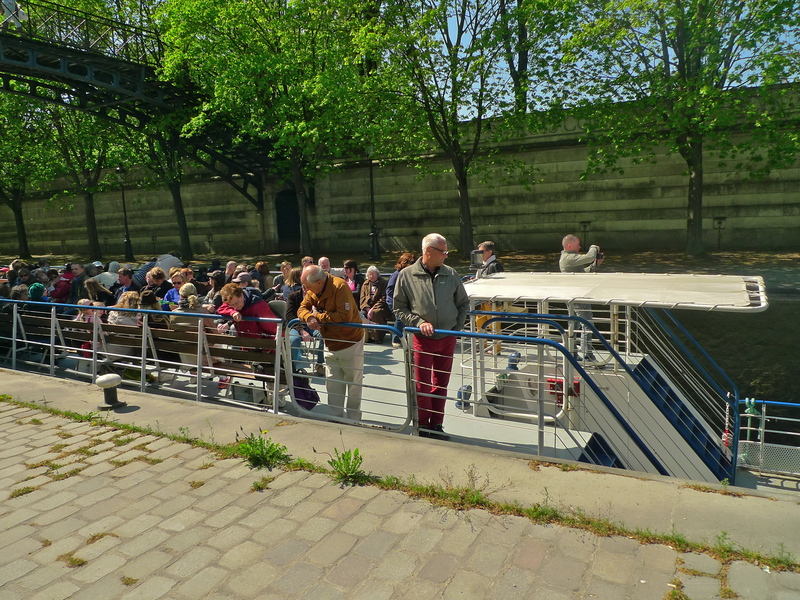 The sounds of a boat full of tourists passing through the Écluses de la Villette seemed to be too good to miss since it seemed to me that they would represent a good part of the life of today’s Bassin de la Villette so I positioned myself just beyond the first pair of lock gates and waited. This was one of those occasions when I felt that the story would be best told by fixing my microphones in one position and simply waiting for something to happen – a technique I learned from studying the work of the great photographer, Henri Cartier-Bresson. And presently something did happen – something completely unexpected. As a Paris Canal boat hove into view people were passing behind me and then I heard the sound of horses hooves. I turned round to see two splendid horses from the Gendarmerie passing by. They passed very quickly but it was long enough for their sounds to transport me back for a fleeting moment to the Bassin de la Villette in a different age. 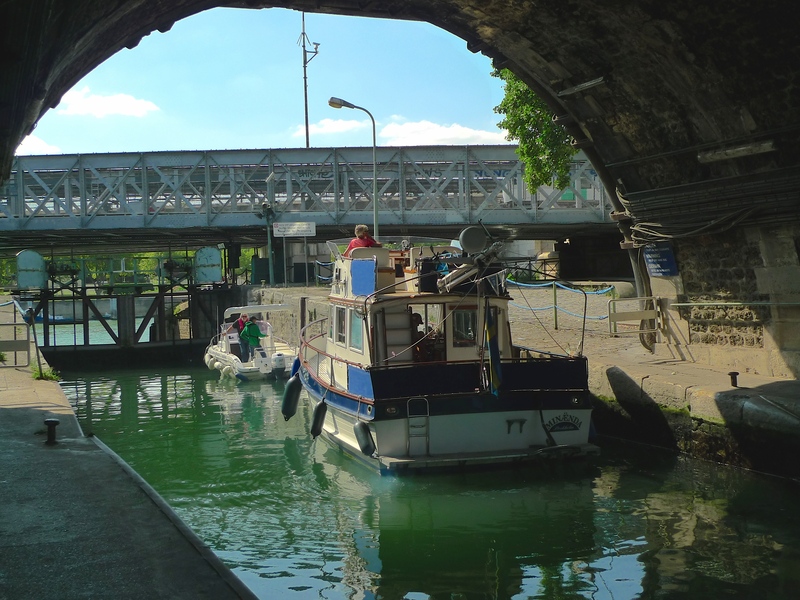 Presently, the first lock gates opened and the Paris Canal boat, complete with its running commentary, slowly and carefully entered the first part of the lock. Once in, the gates behind it were closed and the sluices on the gates ahead of it were opened and the boat began the first part of its descent. The sounds tell the story as the boat descends. In making this recording I left the microphones and the recording levels untouched throughout so what you hear is what I heard. If you listen carefully, you will hear the sound texture change as the boat descends and, as the boat gets lower, the voices of the passengers can be heard more clearly. Eventually, the lock gates ahead of the boat open and the boat slowly moves forward into the second stage of the lock and the sounds get fainter. If you listen really carefully, above the hissing sound of the water leaking through the first set of lock gates, you will hear two faint thuds as the second set of lock gates close one after the other behind the boat. 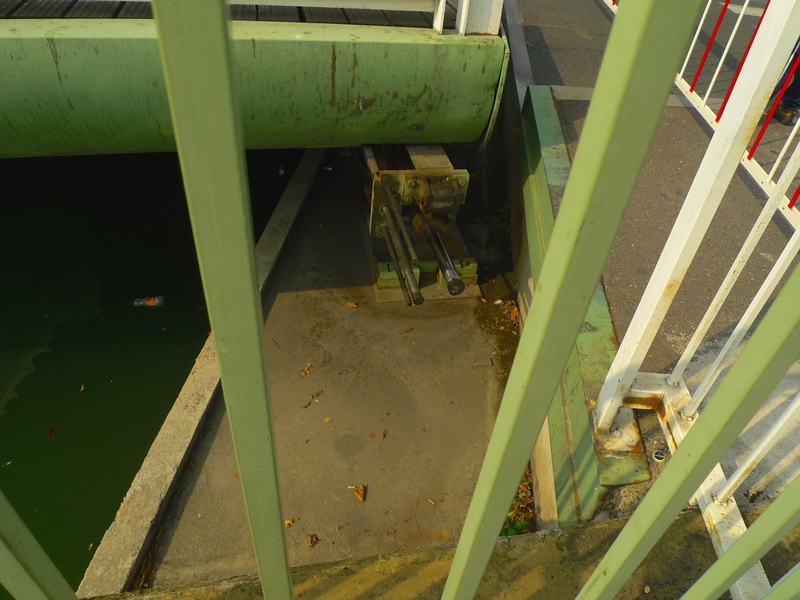 Immediately after, the sluice on the first set of gates opens and water gushes in to refill the first part of the lock. That’s where my sound portrait ends but for the boat and its passengers, now in the second part of the lock, they began their second descent until they were completely out of sight from street level. 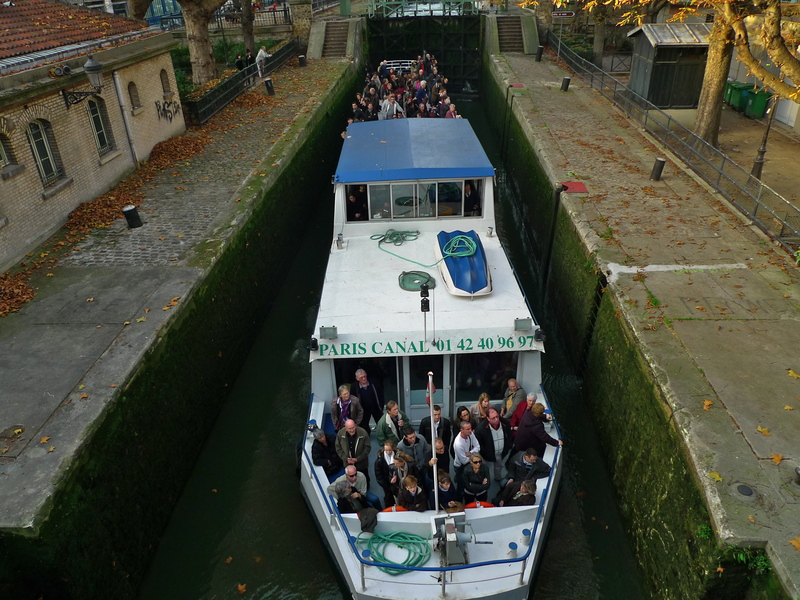 They then moved off into the tunnel taking them under the road and onto the next part of their journey along the Canal Saint-Martin. 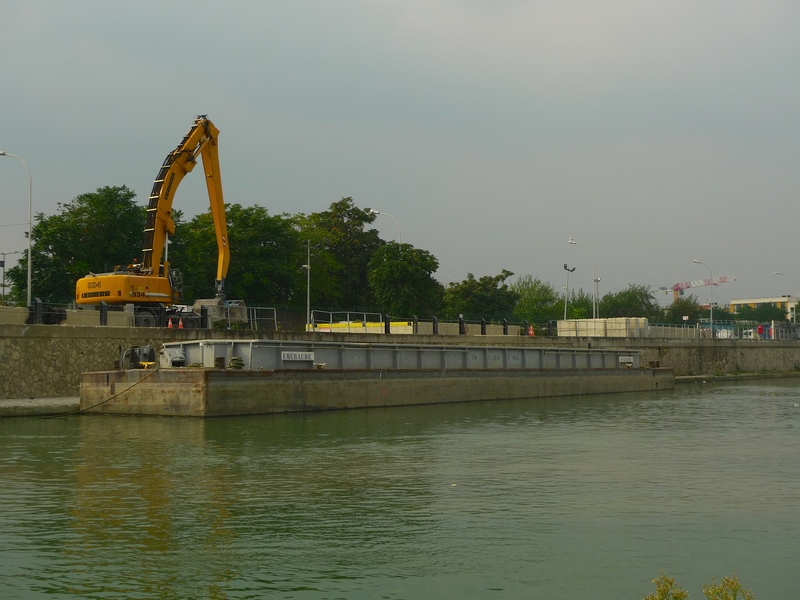 Meanwhile, the first part of the lock was continuing to refill ready for the next boat to repeat the process. I came away from the Bassin de la Villette with a good and varied collection of sounds for my Paris Soundscapes Archive but I couldn’t help wondering what rich pickings there might have been for a sound hunter like me if I’d been there when it had been a centre of industry rather than of tourism. 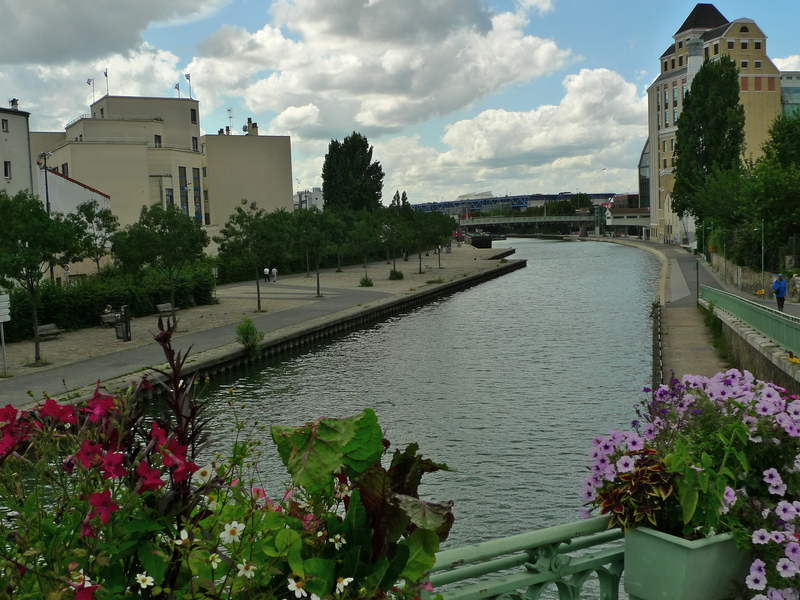 THE CANAL DE L’OURCQ was born in the mind of Napoleon Bonaparte. He recognised that a plentiful supply of water was a key to public health and so, in 1802, he ordered the construction of the canal to begin. Work began well away from Paris in Picardy where the river Ourcq was canalised and construction began to bring the waters the one hundred and eight kilometres to the Basin de la Villette in the northeast of Paris. From here the Canal de l’Ourcq linked, and still links, to the Canal Saint-Denis which enters the Seine close to Saint-Denis to the north, and the Canal Saint-Martin which enters the Seine south of Place de la Bastille. 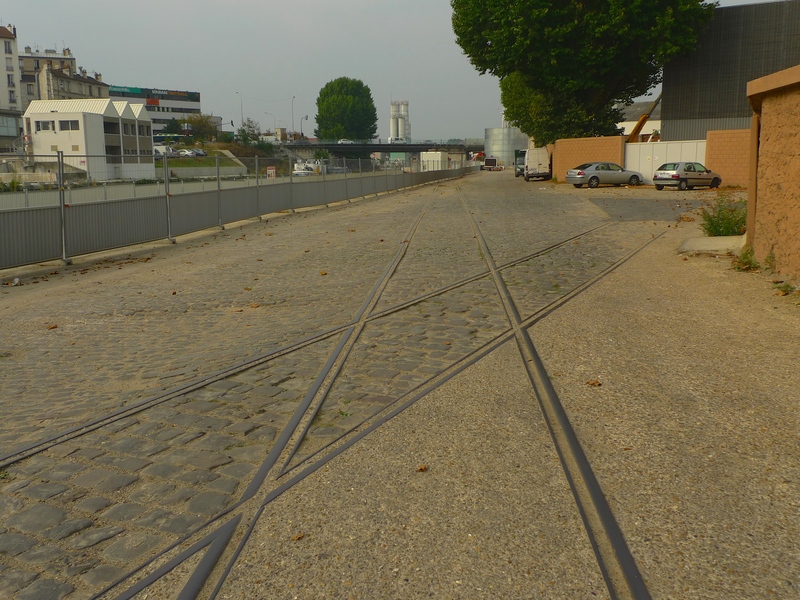 Building the Canal de l’Ourcq was not only a considerable engineering feat it was also a very smart move. On the one hand it provided a plentiful supply of water to the city but it also provided an efficient means of communication for provisioning of the city. The canal’s construction was in part funded by a tax on wine so it’s a good example of turning wine into water! The canal is still an important source of water for the city of Paris today. It supplies about half of the daily water requirement for the city’s public works. The canal’s commercial traffic may have declined but it still exists to some degree. Working barges are still to be seen and heard passing by leaving their extended sonic footprint behind them. All working waterways attract industry around them. Inevitably, some of that industry doesn’t survive and we are often left with its ghostly reminder. Buildings like this have an almost magnetic attraction for me. I am fascinated by industrial archaeology and I always think that buildings like this demand to be explored. The fact that this building is fenced off and made distinctly unwelcoming somehow adds to its attraction. I understand that psychogeography is the contemporary term for this sort of exploration but with my interest in sound, I much prefer the term sonic archaeology. Some of the industry though associated with the Canal de l’Ourcq has survived. 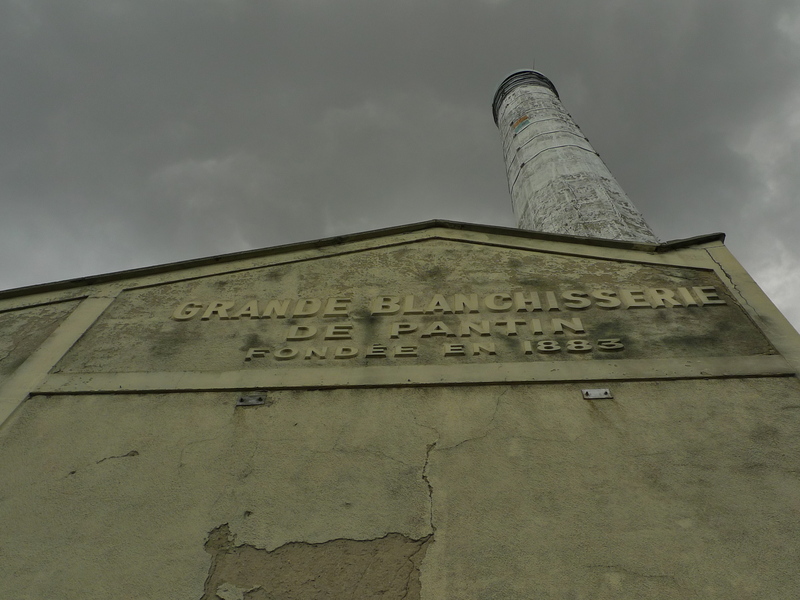 The Grande Blanchisserie de Pantin was founded in 1883 as an industrial laundry. Under a different name, but in the same premises, it survives today doing exactly the same thing. 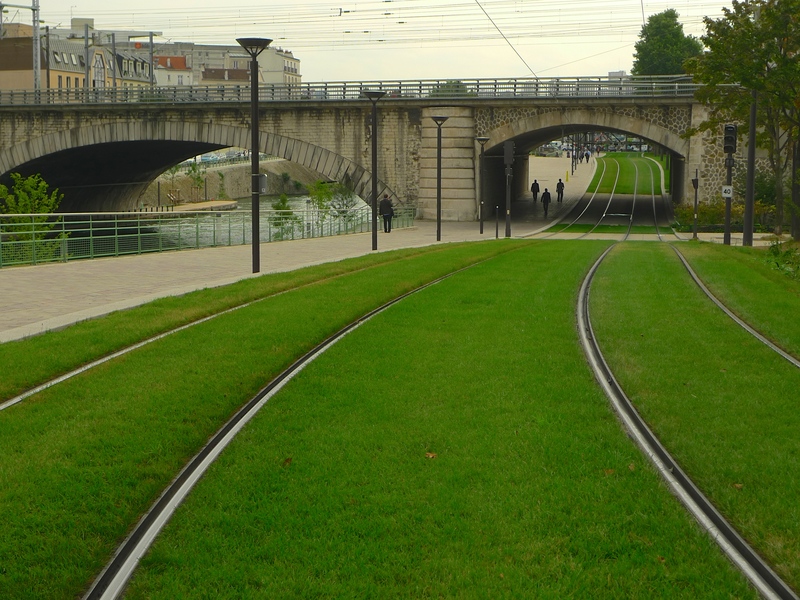 Before reaching the Basin de la Villette, the Canal de l’Ourcq bisects the enormous Parc de la Villette. 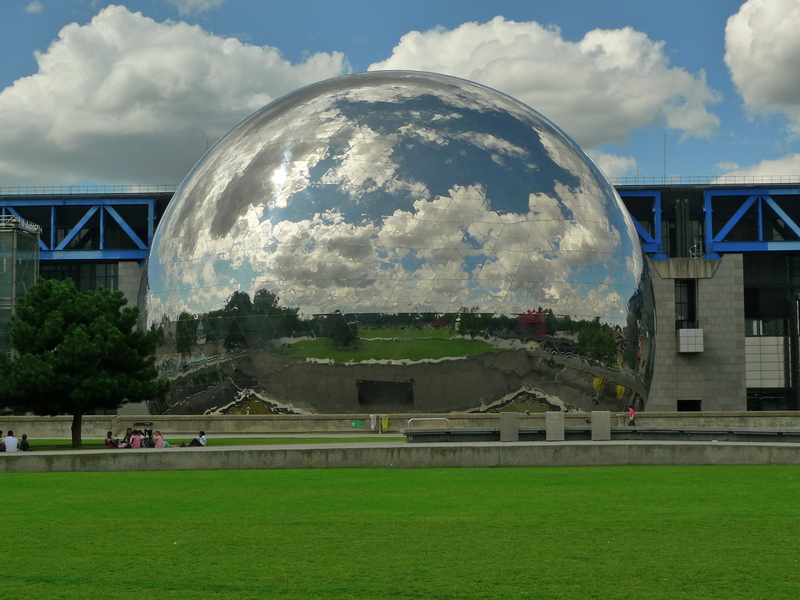 Designed by the French architect Bernard Tschumi and built on the site of the former Parisian abbatoirs, the Parc de la Villette includes the Cité des Sciences et de l’Industrie, City of Science and Industry, the largest science museum in Europe; La Géode, an IMAX theatre inside a 36 metre diameter geodesic dome; the Cité de la Musique, City of Music, an interactive museum of historical musical instruments and a concert hall and Le Zénith, a 6,300 seat concert arena, among the largest in Paris. 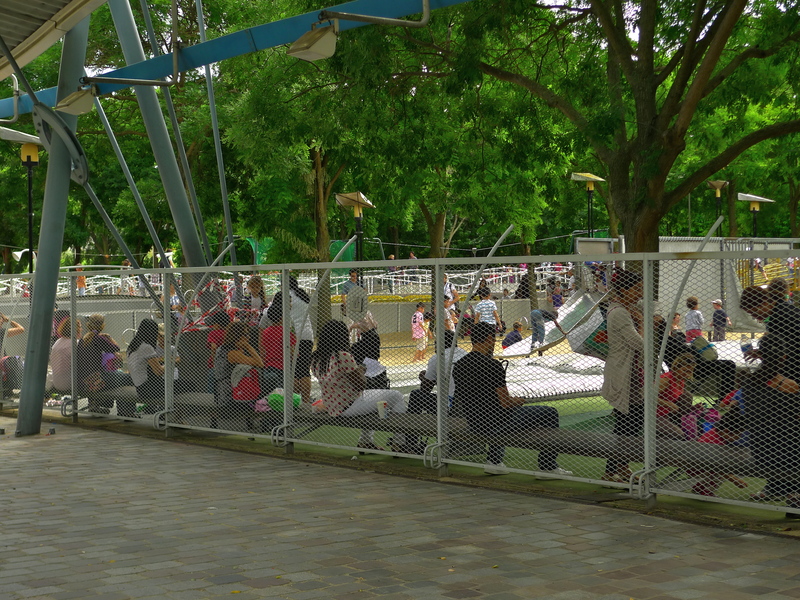 The Parc de la Villette is a parent’s delight. There’s something here to keep the kids entertained all day long. 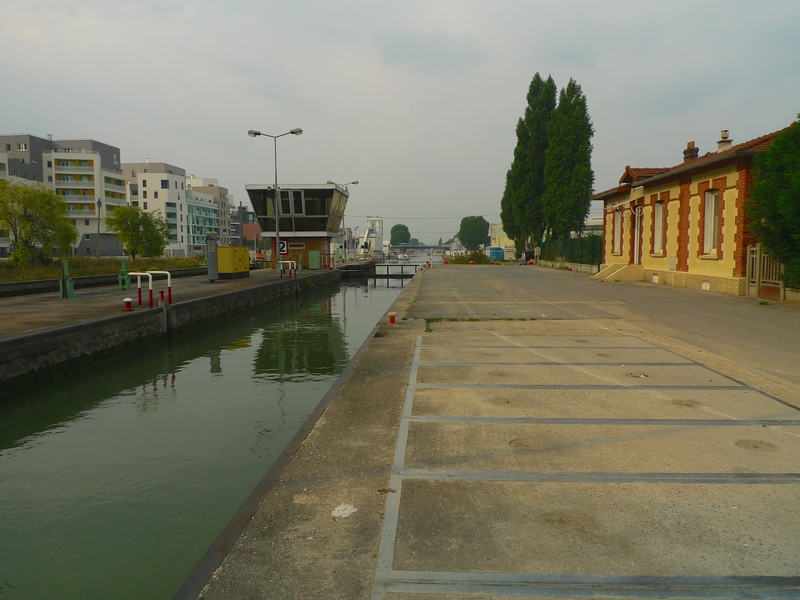 One day I shall travel the full length of the Canal de l’Ourcq but in the meantime, I am quite content to spend an afternoon walking from the Basin de la Villette to Pantin on one side of the canal and then back again on the other. I recommend it. THE WEATHER IN PARIS in early November has been quite exceptional, more like late summer than late autumn. It’s the ideal weather to stroll around Paris and search out places I haven’t been to for a while, places like the Canal Saint-Martin in the 10th arrondissement. 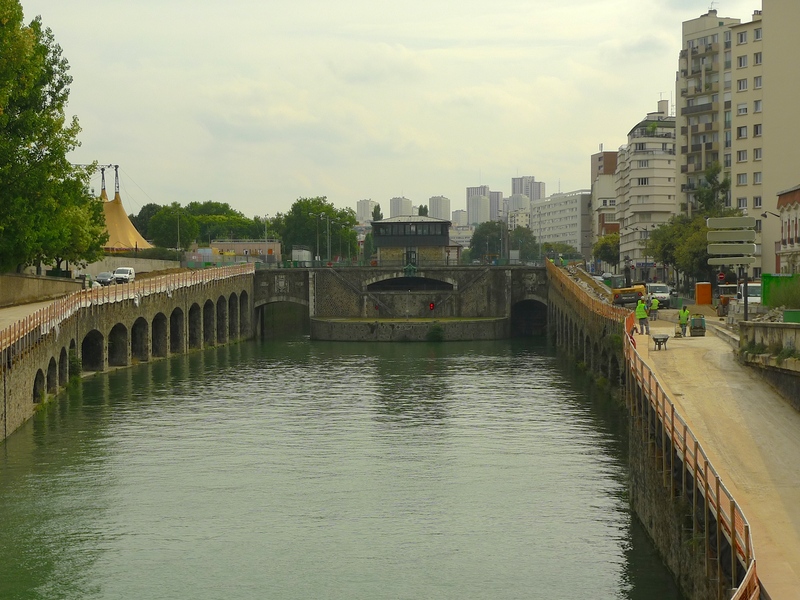 Stretching from the Place de Stalingrad to Porte d’Arsenal, the canal was born in the mind of Napoleon I as a means of supplying much needed fresh water to the city. The building of the canal was funded by a tax on wine – a case of turning wine into water then! As well as supplying fresh water, the canal was also a working thoroughfare supplying Paris with grain and other commodities. The canal trade eventually dwindled and the canal came close to extinction but today, the canal and the surrounding area, is a vibrant, rather chic place to be. The Hotel du Nord, on the Quai de Jemmapes, stands close to the canal. The hotel has been here since 1885 but it’s perhaps best known as the star of the film of the same name. The 1938 film, directed by Marcel Carné and starring Annabella, Jean-Pierre Aumont and Louis Jouvet, was shot on location here. 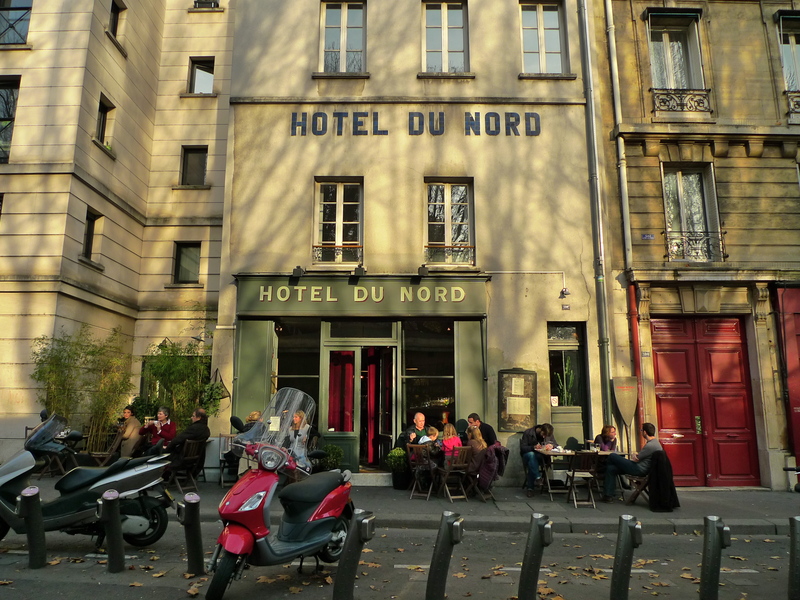 Standing in front of the Hotel du Nord today it’s very easy to slip back in time to 1930’s, black and white, Paris. Inside, with the zinc bar, the white tiles on the walls and the black and white mosaic tiles on the floor the feeling is enhanced. 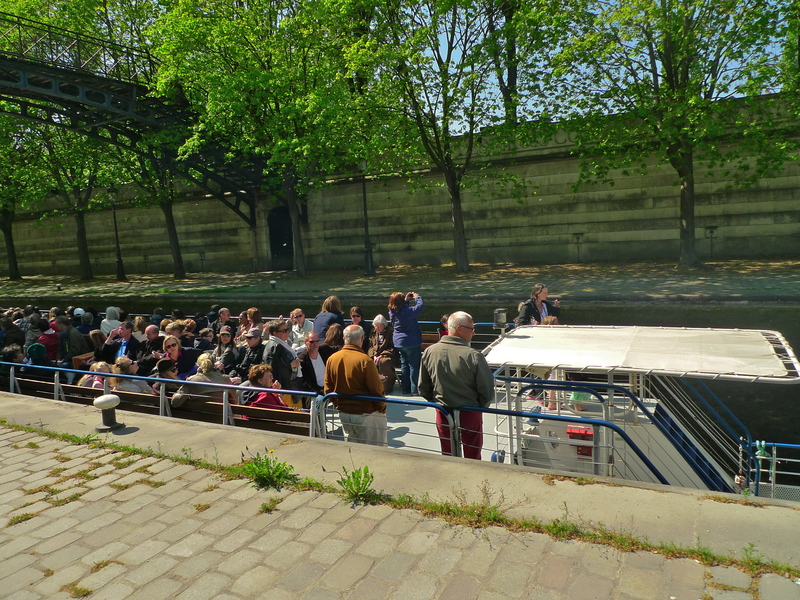 Today, the Canal Saint-Martin is a waterway largely for tourist boats. 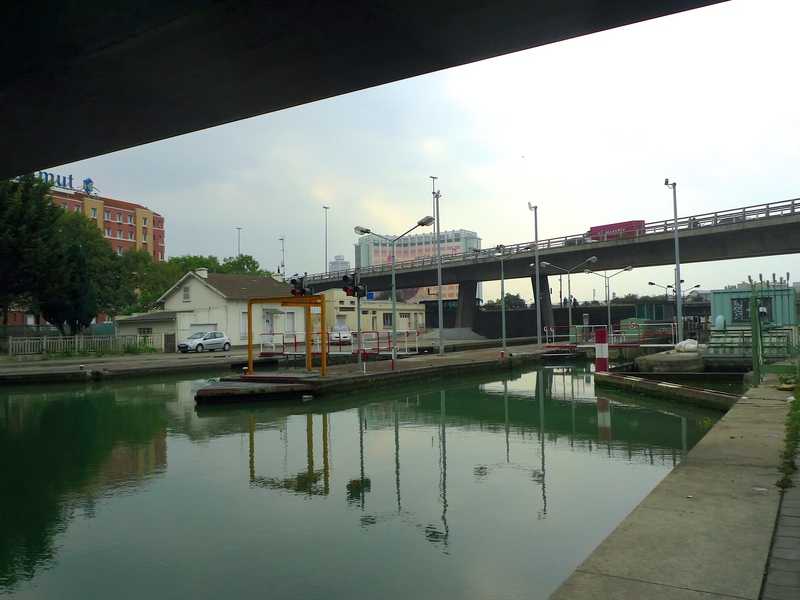 The canal has several locks to be negotiated, which ensures that no journey along the canal will be made in a hurry. Navigating the locks is usually watched by people who gather on top of the bridges and it was on top of one of these that I recorded the process. The process is simple. 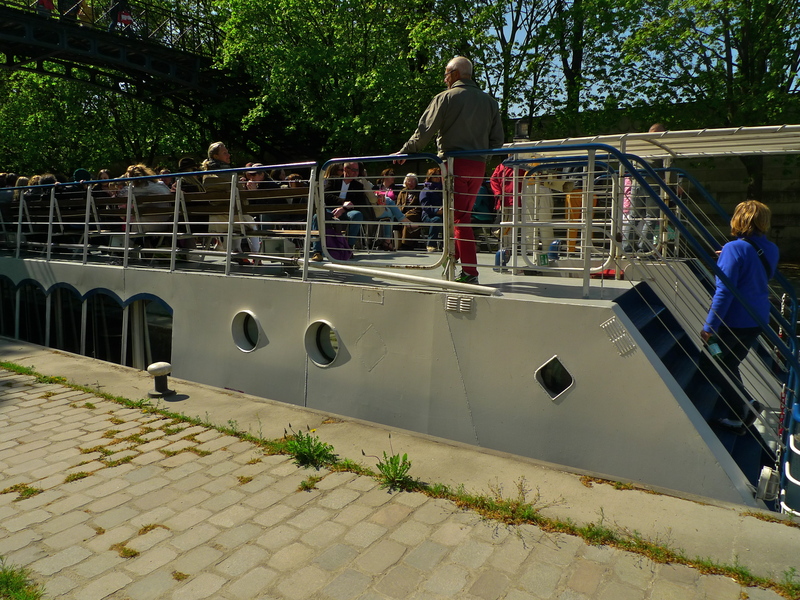 The lock fills to allow the boat in and then empties to allow the boat out at a lower level. The lock gates operate by hydraulics and the water operates by gravity. Today, no heavy-lifting is required, it’s all done at the push of a button. And I can reveal that in this neck of the woods the earth moves! Well, not quite, but the roadway certainly does. At the locks where the road is at the same level as the boats, one of them has to give way to the other and the road always loses this contest. The traffic is stopped and the road swings out of the way. Once the boat has passed, the road swings back into place … at least until the next time. A walk along the Canal Saint-Martin is always interesting at any time but especially so in an unusually sunny November.